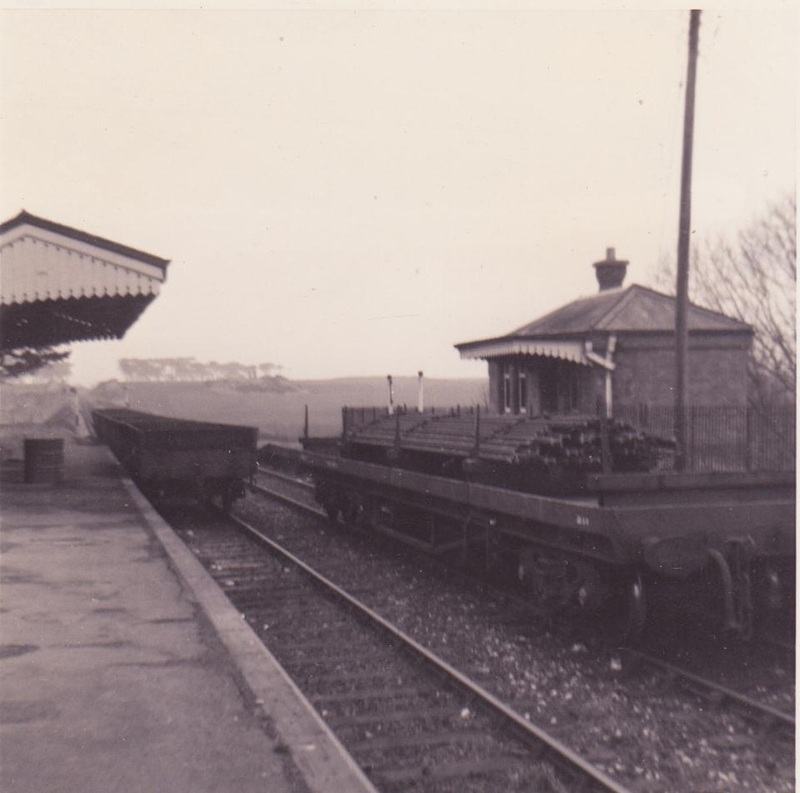 Services on the branch were withdrawn on February 4th 1963 exceot for a short section from Tolcarne Junction to Trevemper which remained open for freight until 28th October that year. 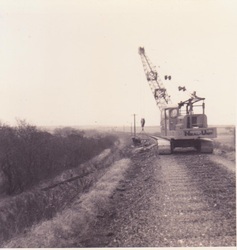 Almost a year after closure I was detailed to travel over the branch on the recovery trains. The first of these ran on January 13th 1964. 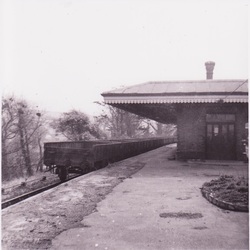 The train consisted of seven to ten open wagons plus a brake van to accommodate the guard and loading crew. My job was twofold. 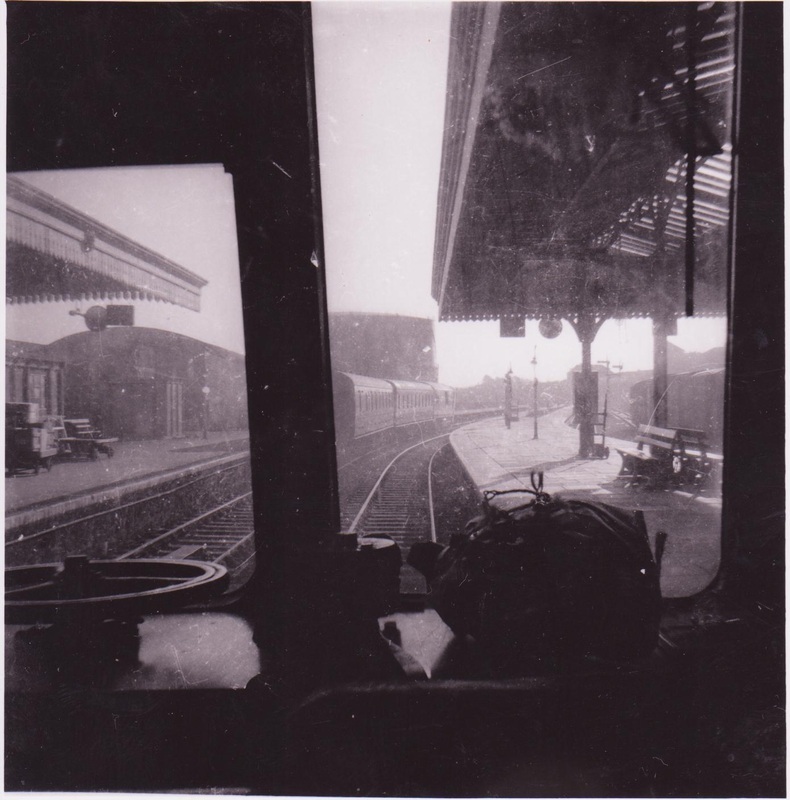 Firstly I was to act as pilotman as, with no signalboxes being manned, there were no tokens or staffs in use to authorise movement. My second, and more important function, was to make sure the train could get through ……! 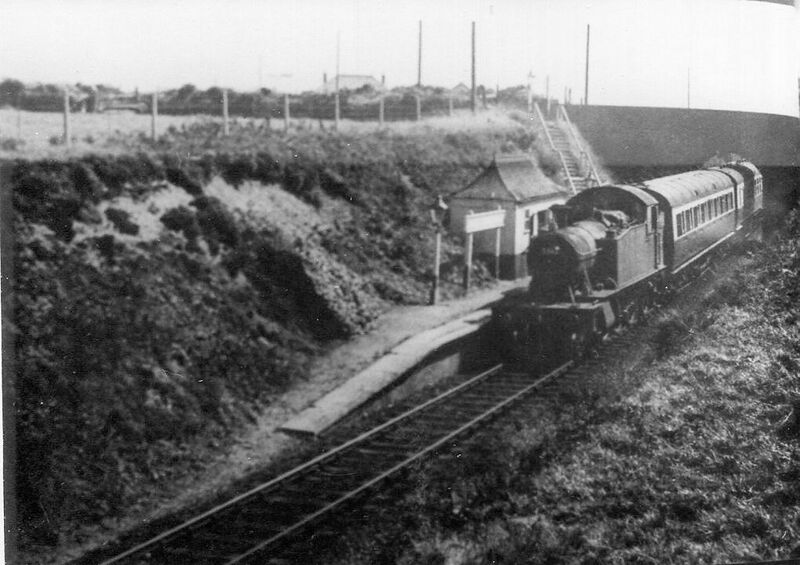 After leaving Chacewater we ran down the line as far as St. Agnes home signal. I remembered the loco crew being concerned about the state of the track after almost a years disuse. Many of those who lived by were shocked at the sight and sound of a passing train and came out to wave to us, but obviously the rails were very rusty. I vividly recall the wheels and lower bodyside of the engine becoming stained red with the rust thrown up from the track. 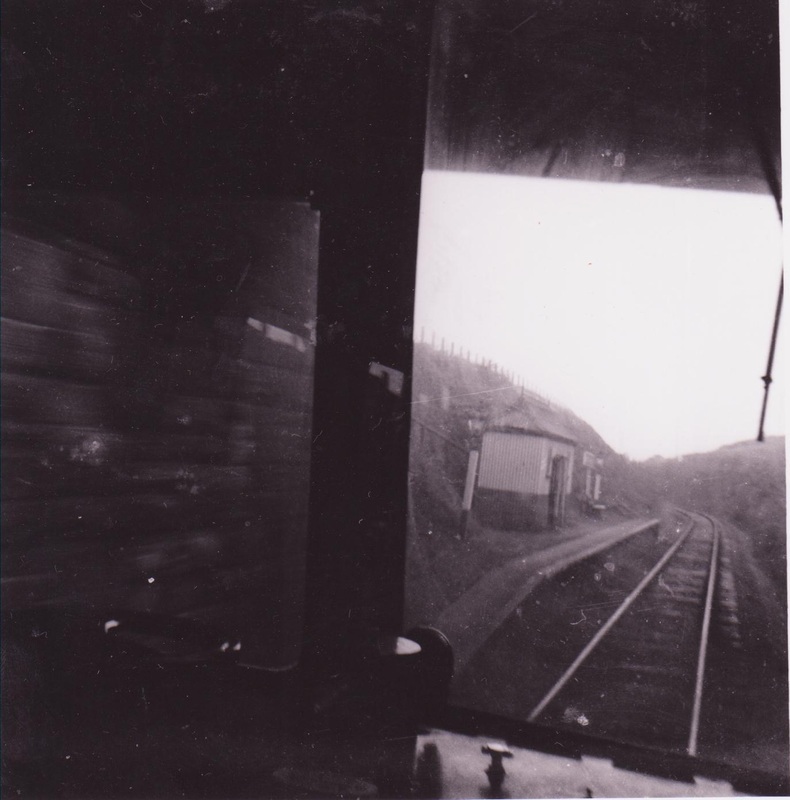 On reaching the signal at St. Agnes, not surprisingly at danger, I climbed down from the loco and walked to the box. I used the same key which I had used many years ago at the start of my railway career to unlock the box. I set the road and lowered the signals ready for the train to pass through the station. The levers and linkages were, to put it mildly, rather stiff. The train ran through and waited for me at the other end while I returned the signals to danger. 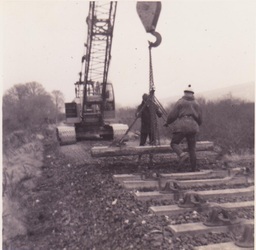 This procedure was repeated at Perranporth and again at Shepherds where the engine ran round ready for its return run. At each station everything moveable was thrown into the trucks - seats, lamps, sign, booking office fittings, cupboards, paperwork etc. etc. Sadly at Perranporth, Henry Morgan's highly polished desk, which I believe he had requested to keep, was thrown in with the rest of the recovered materials. My diary records that I was on pilotman trips to Shepherds on January 21st, and then on the 24th, the 25th and the last trip to Shepherds was on February 27th. I later found out that, on at least one of these occasions, the train was being photographed, by a certain Keith Jenkin! 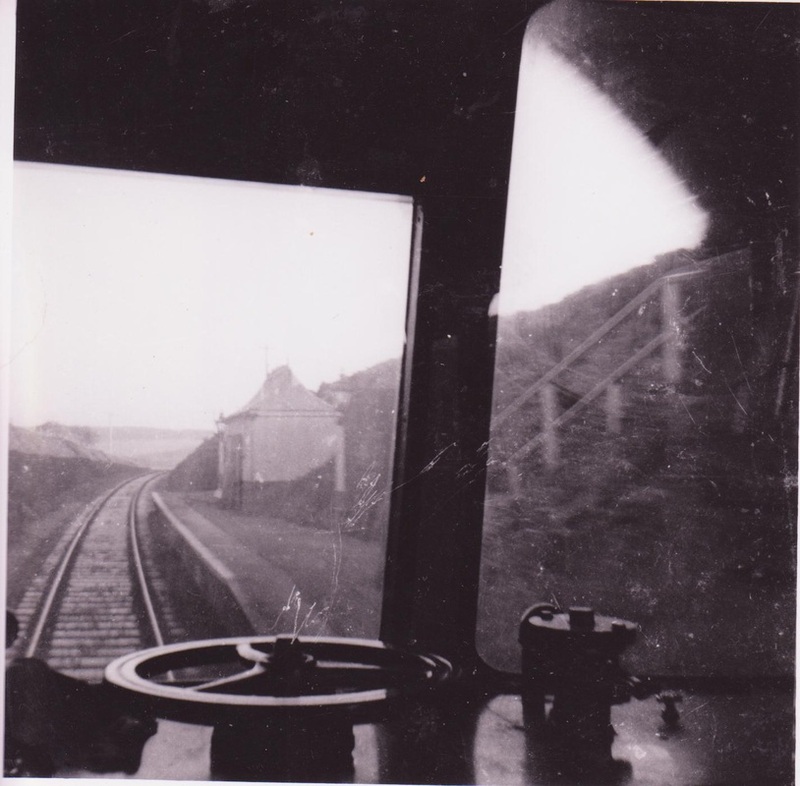 My final and last trip where I began my railway career, was to Perranporth on February 28th 1964. I understand that all items recovered went back to Swindon - what happened thereafter I don't know. 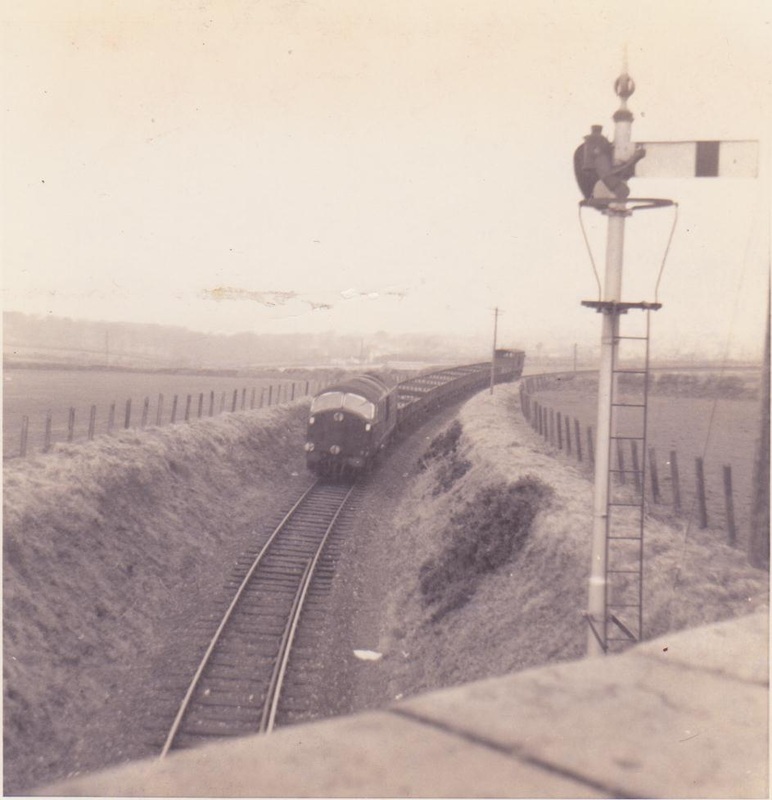 As our trips were almost daily for a time we attracted less attention and, once we realised the track was okay I noted speeds of 50mph being attained. 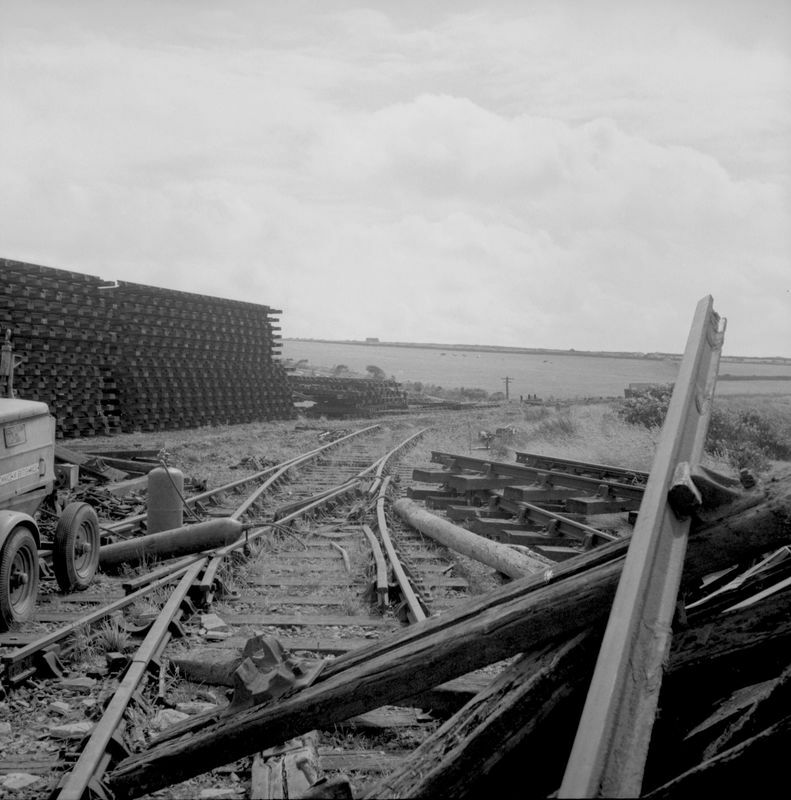 Later, track and heavy stuff was recovered from the Shepherds end by contractors, buildings were demolished, cuttings filled in and the trackbed obliterated or simply left to nature. However, a surprising amount still remains and you can still travel behind steam on the Lappa Valley Railway. 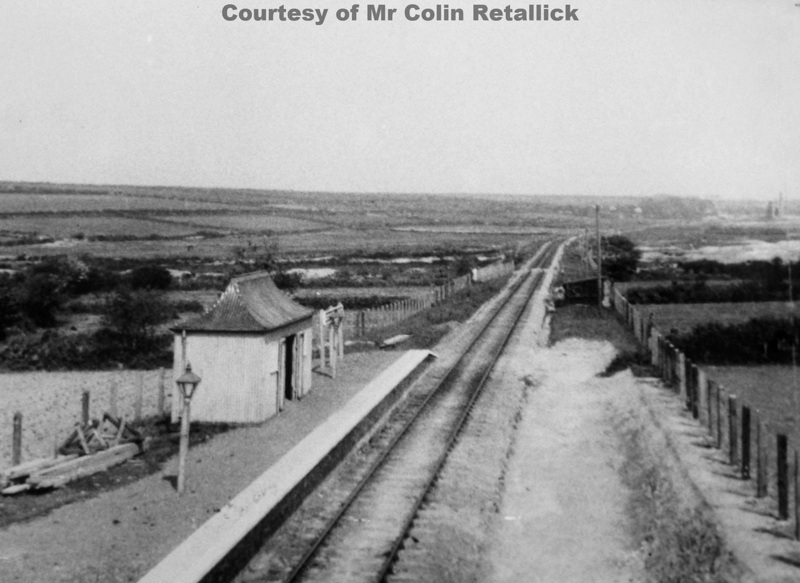 New in 2015 St Agnes station in miniature at St Agnes Museum - well worth a visit. 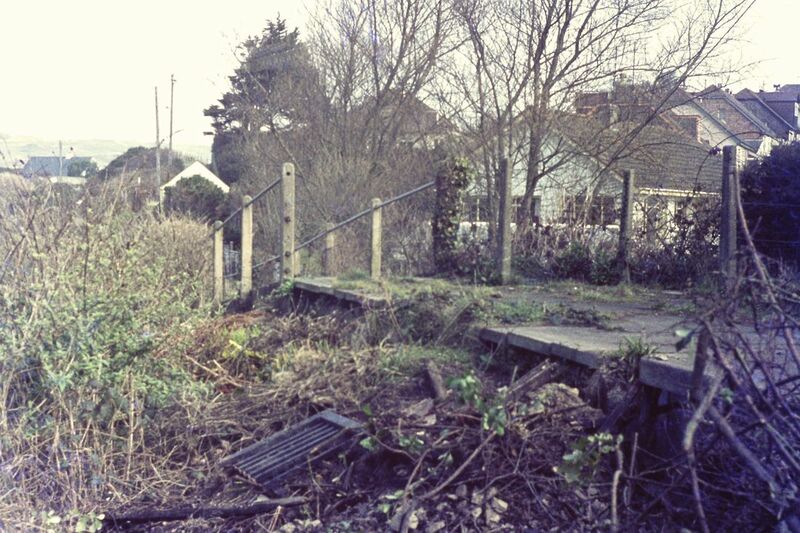 See pictures and further details at the foot of the section on St Agnes station. 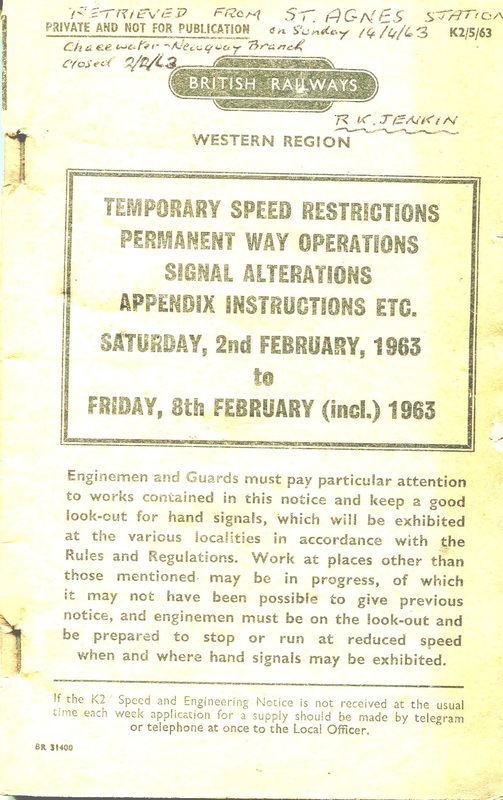 'Temporary Speed Restrictions and Permanent Way Operations for BR Western Region Saturday 2nd February to Friday 8th February 1963'. 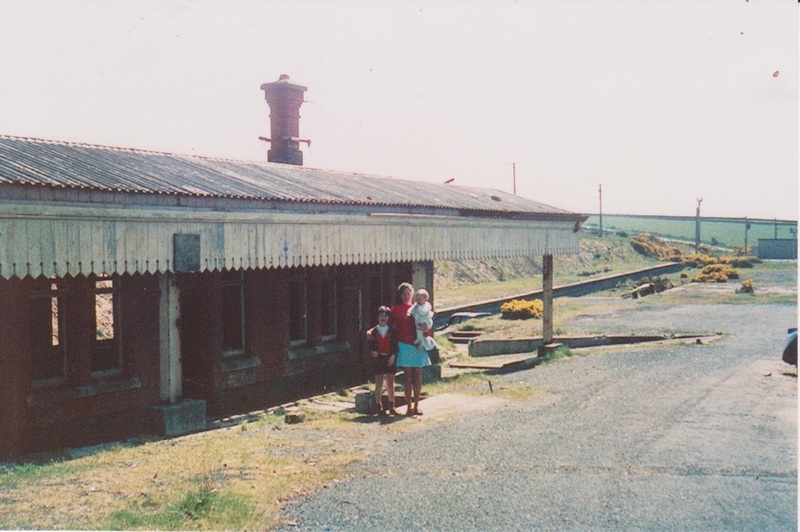 Two months after closure of the line, my father, Lewis Jenkin, visited St Agnes station and found, blowing around, the B.R. booklet illustrated below. Thankfully he saved it for me, I was living in Wiltshire at the time. 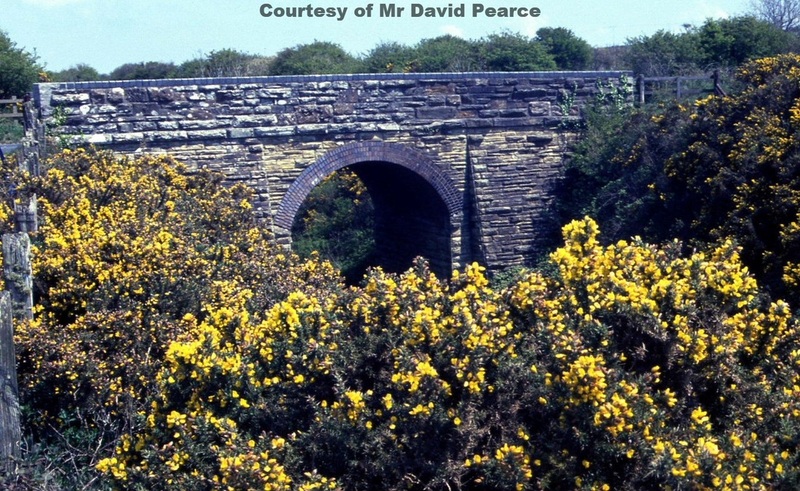 It makes most interesting reading as not only does it cover the Chacewater - Newquay line but also the whole of the Western Region including the 'Somerset and Dorset'. The fact that this booklet which would be regarded as rubbish by at least 99% of people has been saved and recorded bears witness to the value of all readers to check and save what they have. 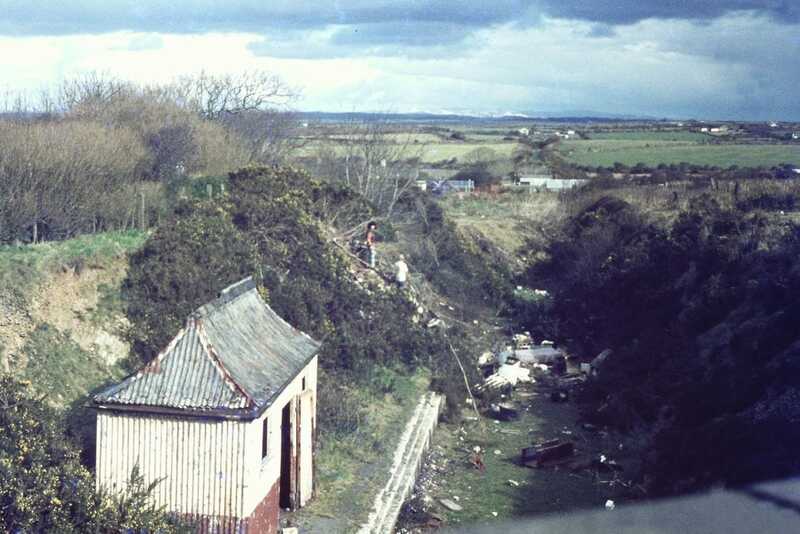 Not only the Chacewater - Newquay line but also the S & D.
The section stipulated for 'Loading Materials' includes Trewerry and Trerice Halt. 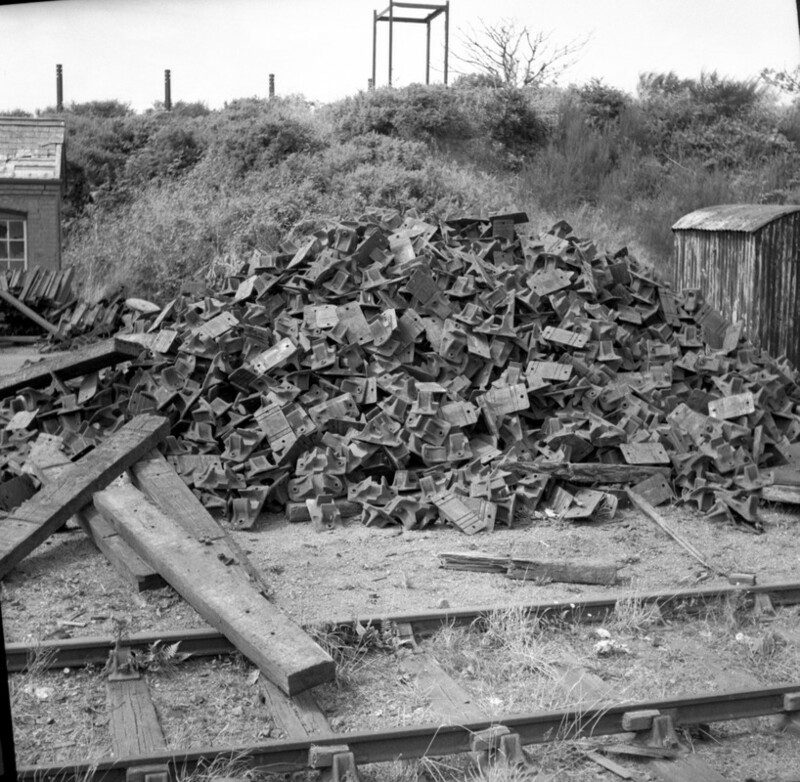 One wonders if it was on this occasion the the signs from the Halt and Level Crossing were recovered? The back of the booklet makes a lot of sense. Without these one could not travel the line - so here they are. 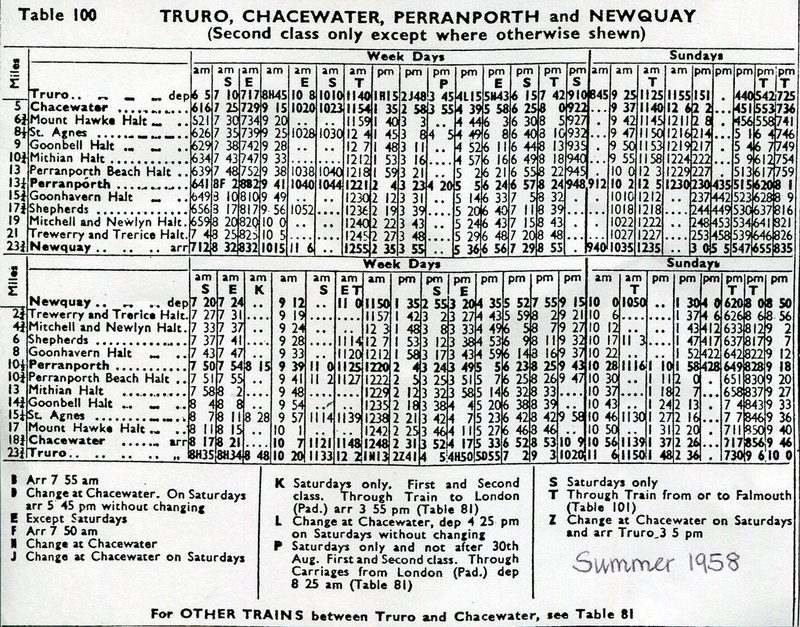 The sections Chacewater to St Agnes and St Agnes to Perranporth were protected by the Webb - Thompson train staff system. 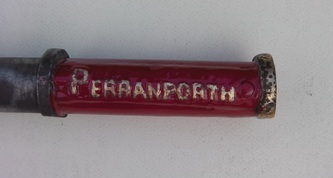 These staffs are 23" long, the former painted green, the latter painted red. 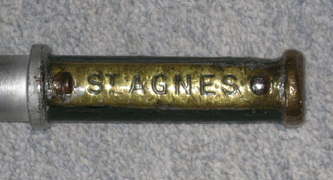 Note that the staffs differ in the position of the left hand ring, this would prevent their insertion in the wrong section of the machine at St Agnes. The Perranporth to Shepherds and Shepherds to Tolcarne sections were were protected using aluminium tokens. These tokens are 7 7/8" long and were painted green and yellow respectively. To prevent their insertion in the wrong section of the machine at Shepherds these originally had different keys on the sawn off part of the token. 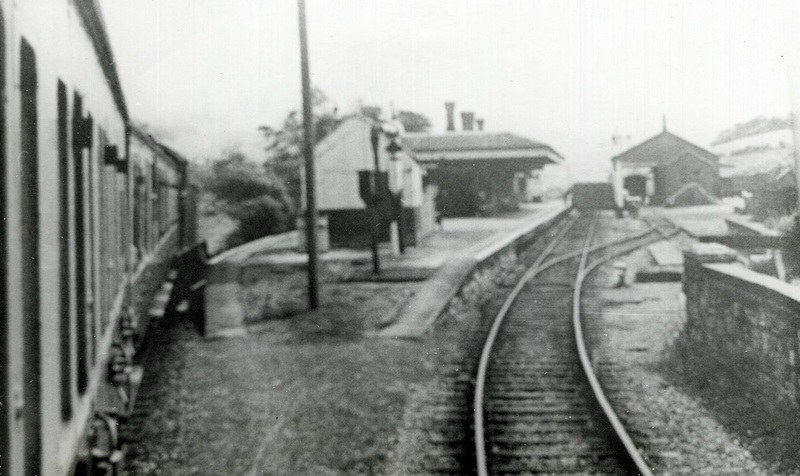 (1) On one occasion a relief signalman who was a practical joker threw stink bombs on the footplate of a Chacewater bound train. The engine crew not to be outdone when approaching St Agnes on the return run heated the token in the firebox before handing it to the signalman!! 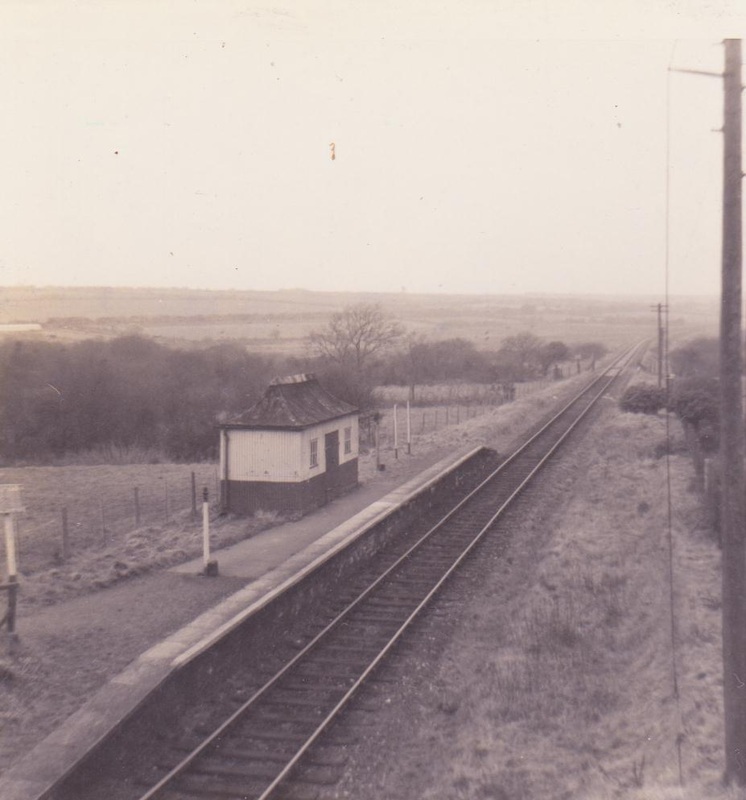 (2) It was common practice for the late turn signalman having seen the last train of the day off to Chacewater to lock up the box and go home without waiting to acknowledge the 'train out of section' from Chacewater once the service had arrived there. However, on this fateful night the engine crew threw the staff out of the engine with great force at Chacewater and on hitting a lamp standard on the platform it became bent and would not enter the token machine. 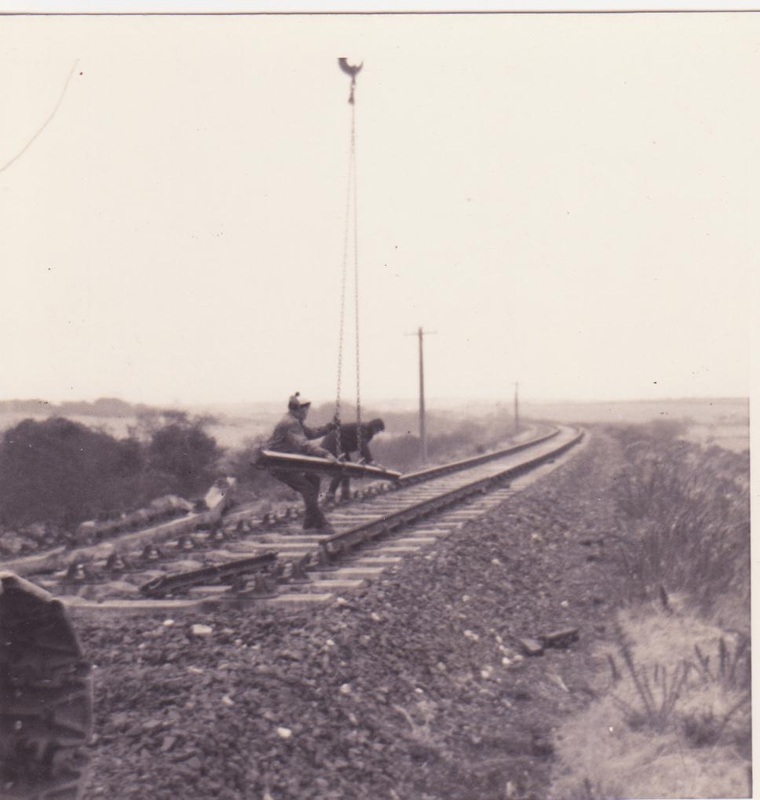 The poor old signalman had to be called out back to his box to make the necessary adjustments at the St Agnes end to overcome the effectively missing token! The web master has always spelt Tolcarne with the extra e - probably because for the last 52 years or so he has had a token with an extra 'e' displayed at home. It would now appear that as nowhere else in any paperwork is the bonus 'e' added that this is indeed a mistake, by the engraving machine operator presumably, or who whoever gave him the notes to work from. 'Somebody' was probably thinking of the golden sands of Tolcarne beach at Newquay. 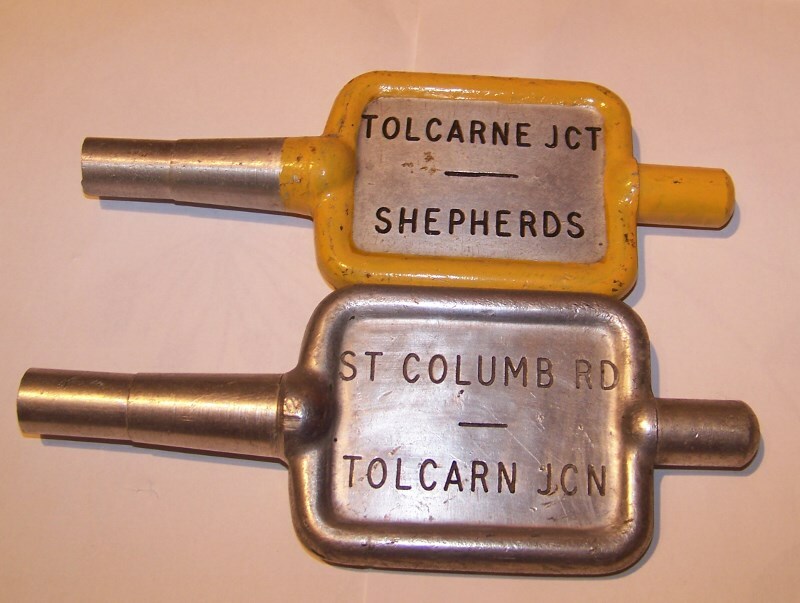 Many thanks to Chris Osment for drawing my attention to this error and to David Hibberd for sending in a picture of his token together with the token from St Columb Road to Tolcarn Junction. 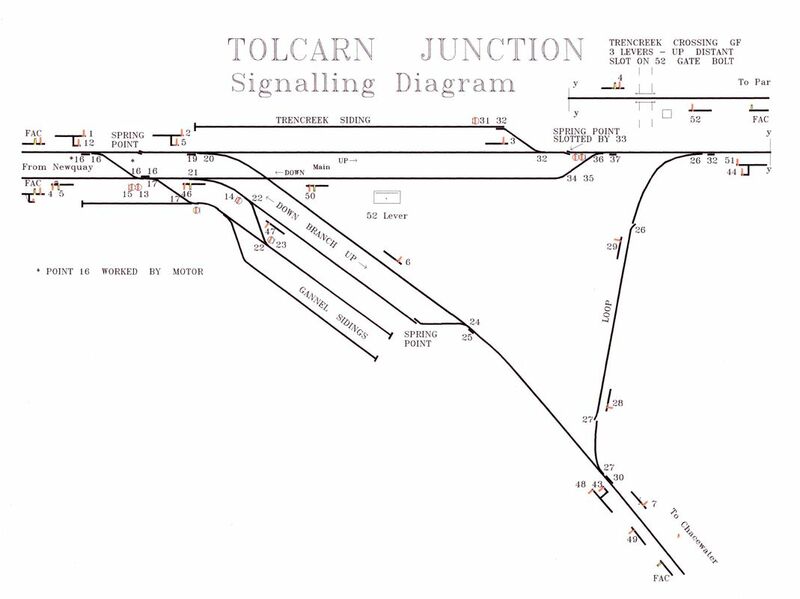 Has anybody any pictures of Tolcarn Signalbox please. 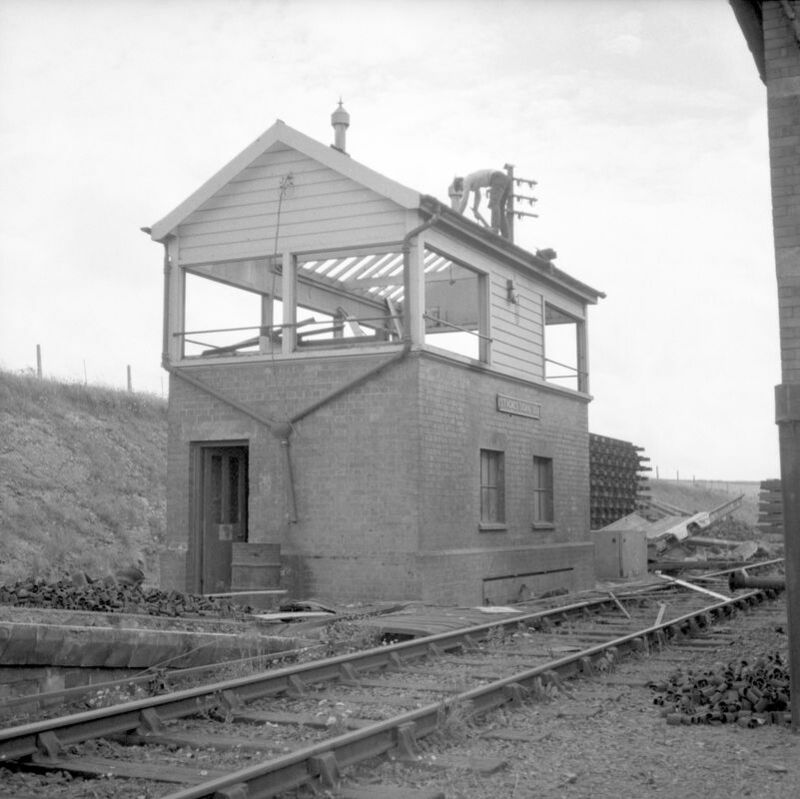 Picture (1) Blackwater North Signalbox. 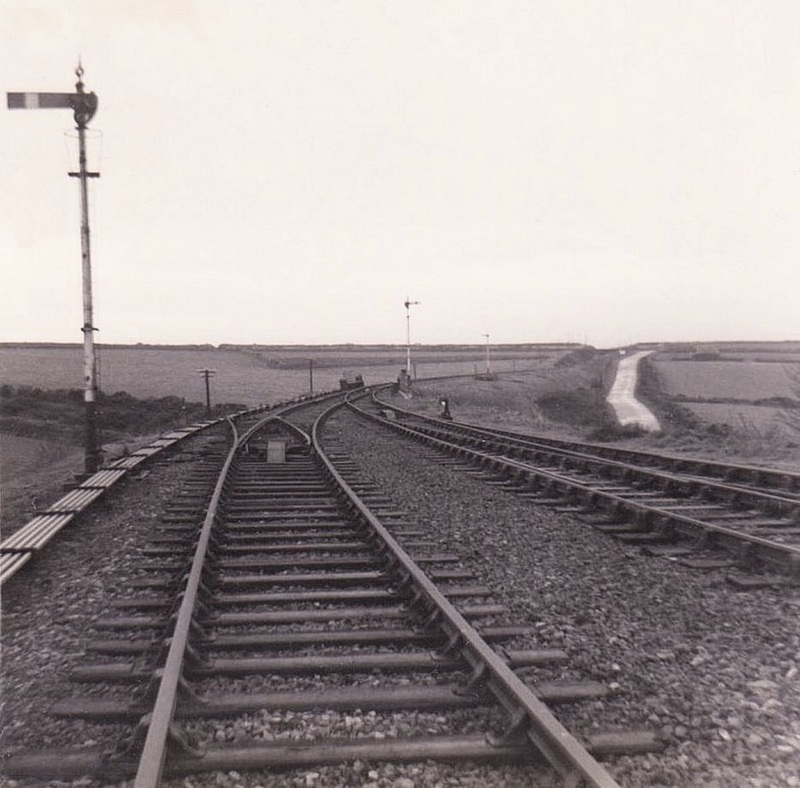 The triangular junction here was all in double track. 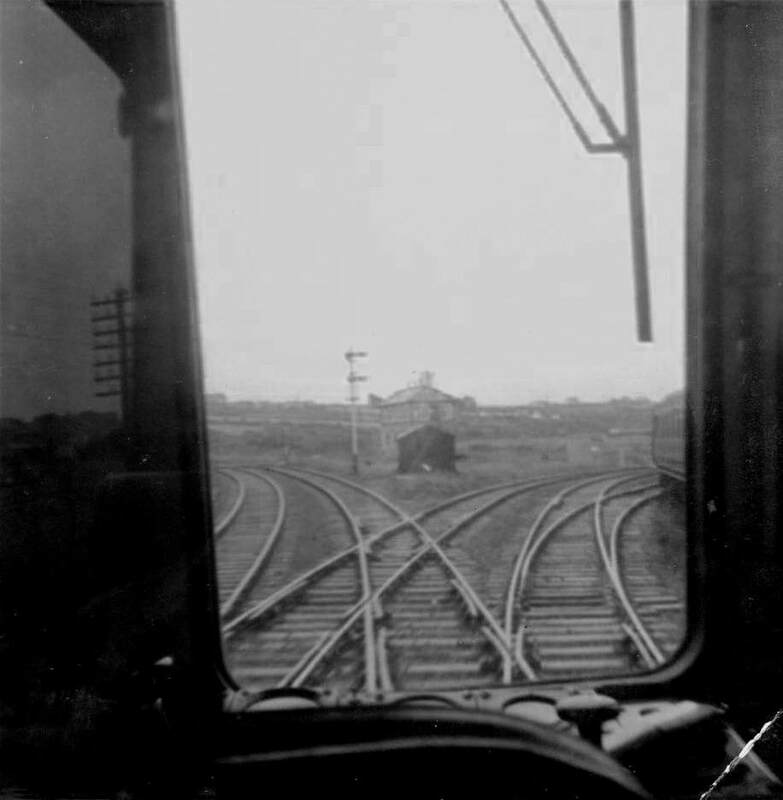 There were three signalboxes - North, East and West. 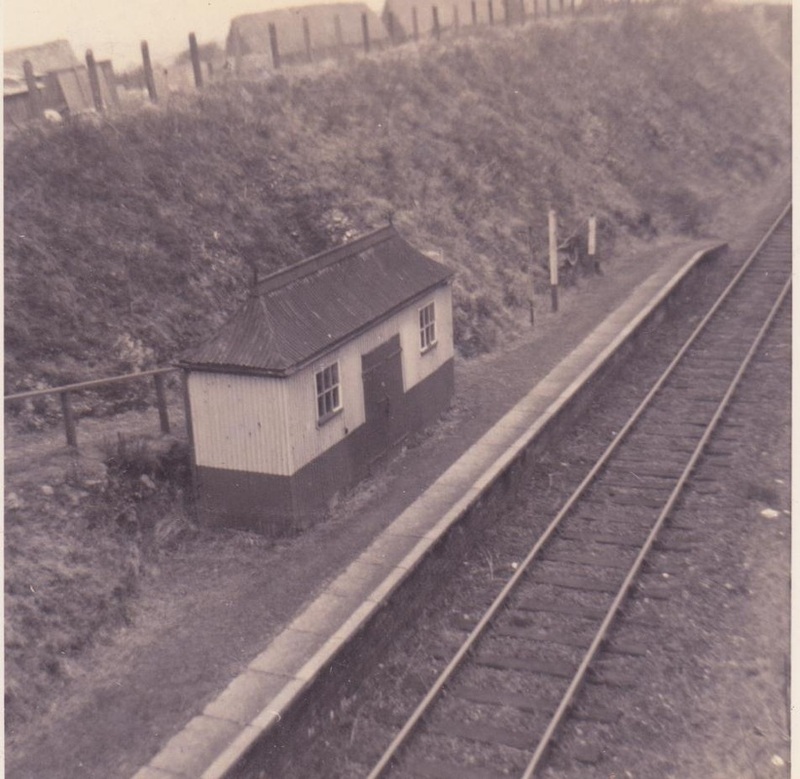 West Junction box taken out of use 18th September 1924,and the North Junction Box taken out of use 9th November 1924 when the Newquay branch was extended to Chacewater as a third set of metals. 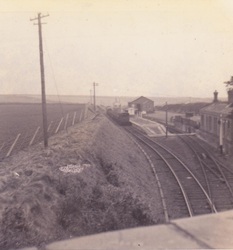 The west curve - the lines to the right of the signalbox which gave a direct connection to Redruth and Penzance were closed 5th May 1919. 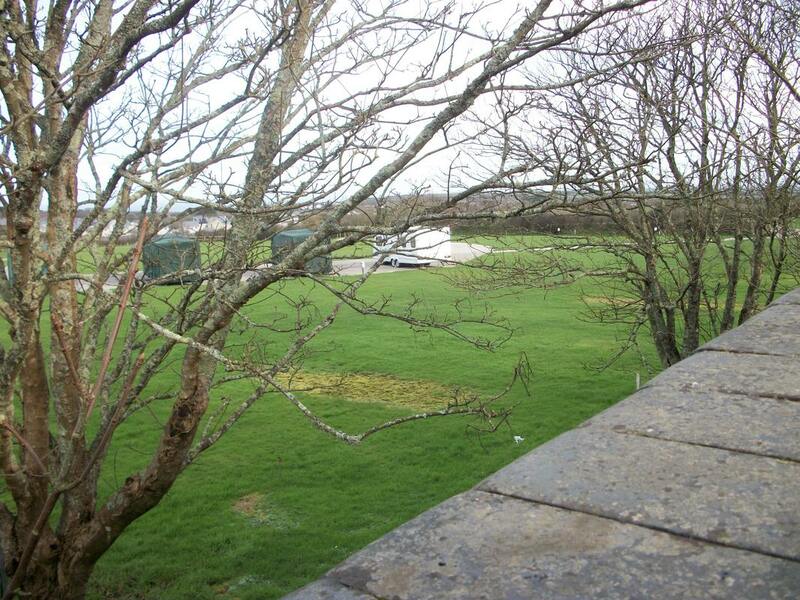 To the left can be see the top of the bridge parapets of the bridge over the former A30. The source of this picture is unknown. Picture (2A). 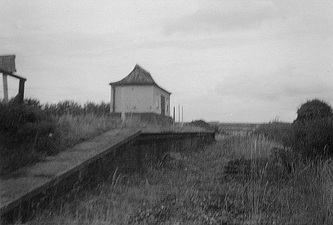 Another view of Blackwater North signalbox and also of the embankment leading up to the bridge over the old A30. 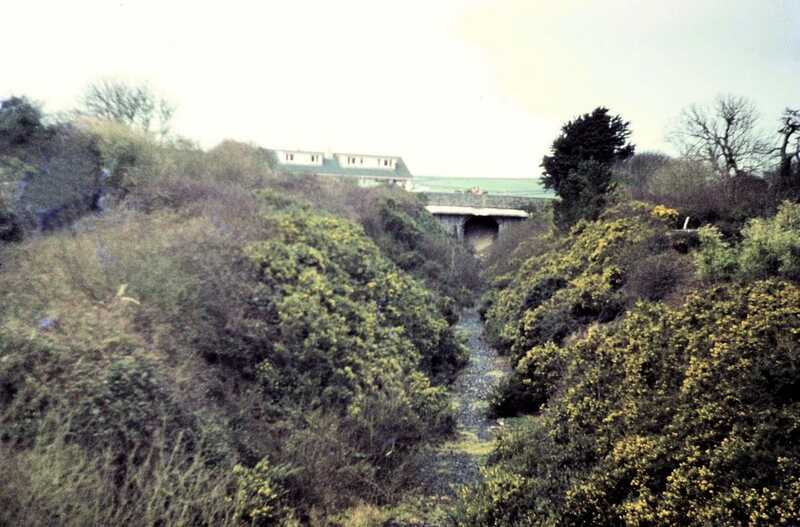 A dual carriageway, the Blackwater by-pass, has removed all of the embankments beyond the main line, which is in the immediate foreground, for some distance. Source unknown. Picture (2B) With a little editing, enlargement and removal of a telephone pole directly in line with the contractors loco and wagon it becomes a little clearer. Apologies for the poor quality but the resolution was poor in the first place. 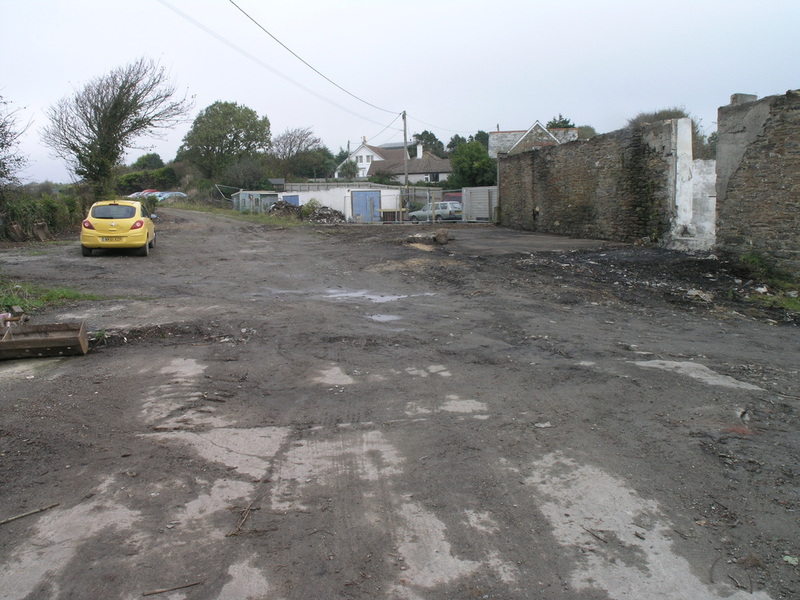 The late Lance Ibbotson, former General Manager of the Western Region once commented to me that they ‘closed the wrong Newquay branch’. How right he was, but too late. 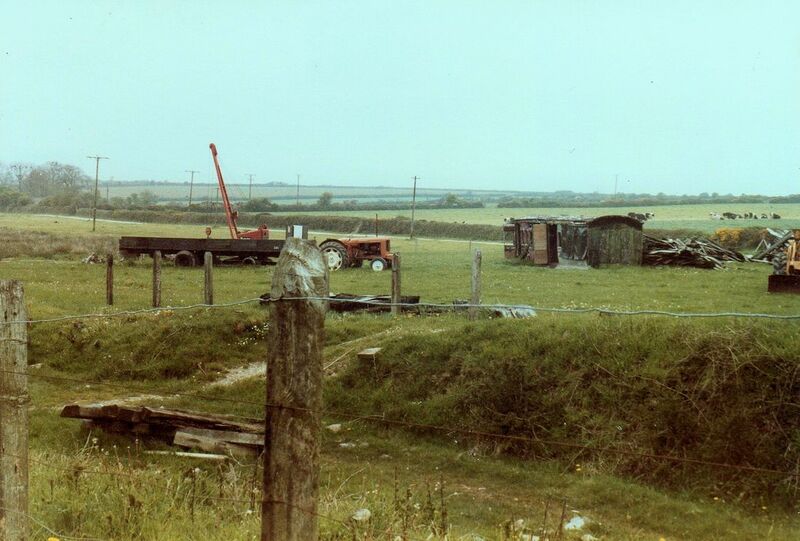 As a teenager, I spent much time in Chacewater box, in the company of the late Leslie Roberts. 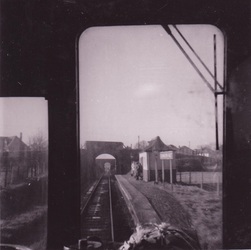 His father, still alive then (this would be 1964-6) had worked on the construction of the line in 1901-3 and lived to ride on the last train on February 2nd, 1963. 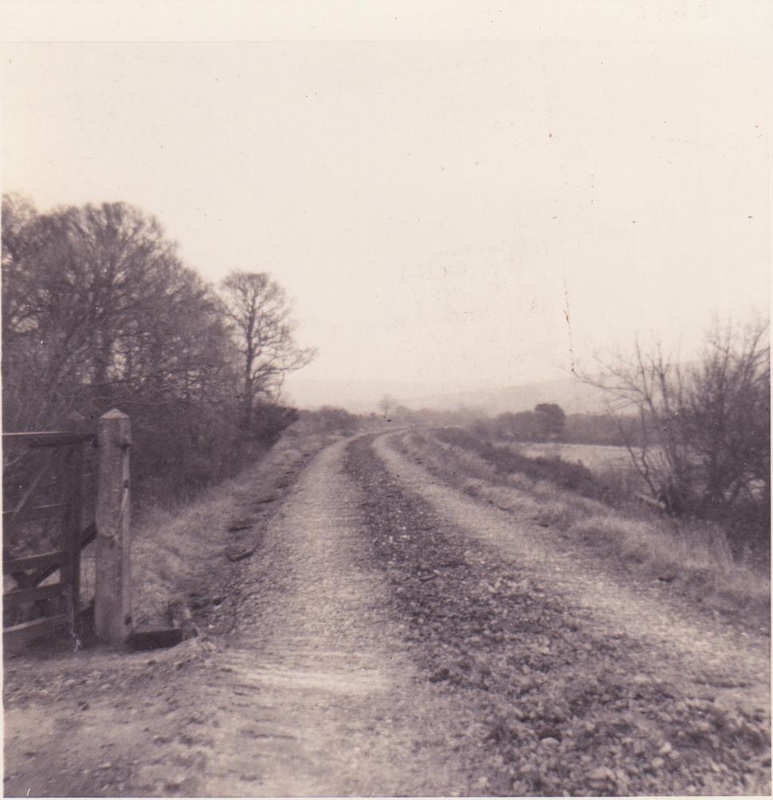 The old man lived at Blackwater and would often climb up on to the rusty track and shake his head in bewilderment at the course of events. Both he and his son told me about Blackwater Junction. 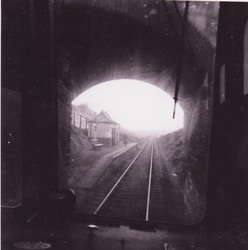 The photographs show the junction in the spring of 1903, just before the passenger opening. Picture (1) The first of the three boxes to open was the East box, on December 21st 1902. 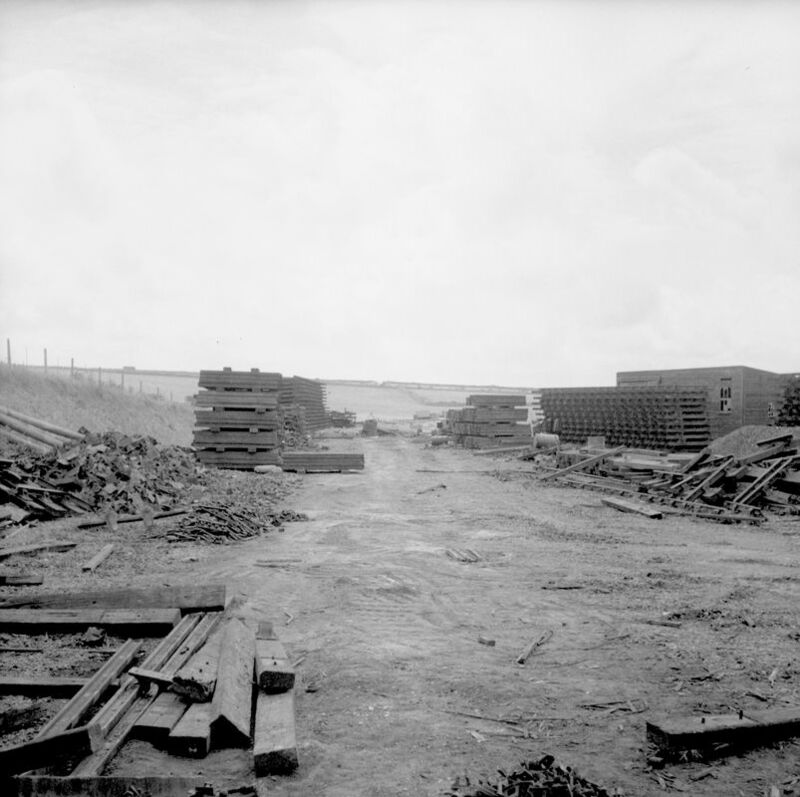 The West and North boxes followed on July 6th 1903. 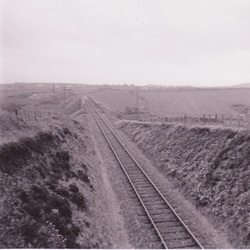 The photographs show that the line from East box to Perranporth appears ready for traffic, but the signals on the West curve carry crosses –‘not in use’. West and East boxes had 19 lever frames: North had 17. 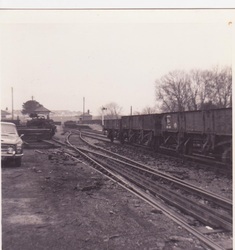 Note the contractor’s tiny locomotive with wagons at the centre of the second picture. Pictures (2A & 2B). For almost its entire life, Blackwater West box was ‘switched out’. 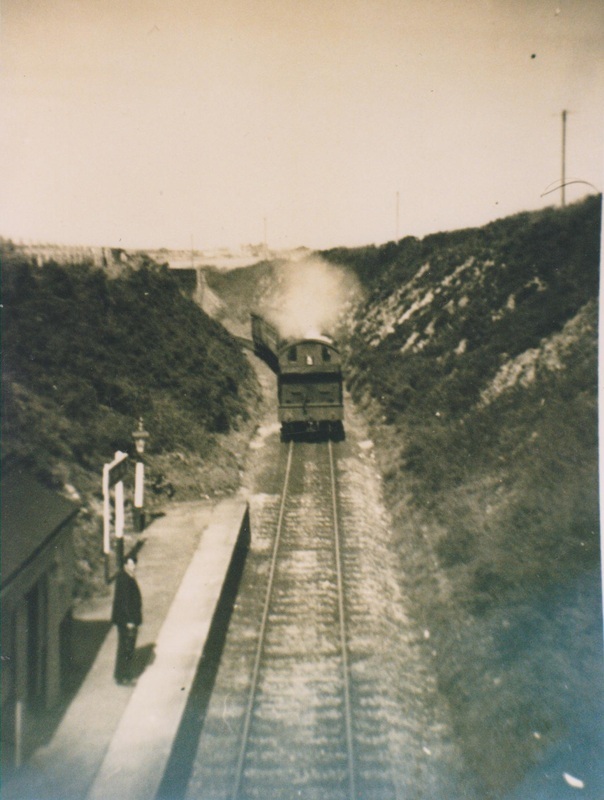 There was limited traffic on the West curve (notably a daily freight from Redruth) and regular passenger trains on the curve stopped during the first world war. 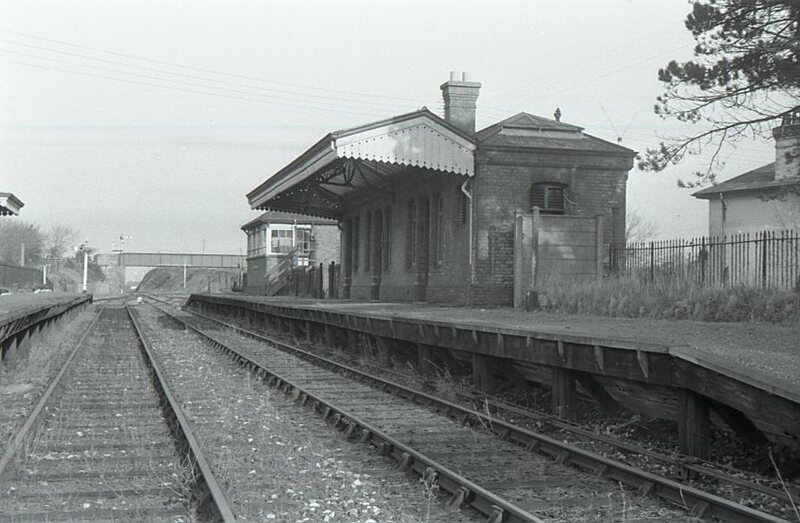 Oddly, West box had the longest life of the three: it opened in 1892 as Scorrier signal box. It was of wooden construction. A new brick box opened at Scorrier in 1902 and the structure was dismantled and re-erected at Blackwater West Junction. 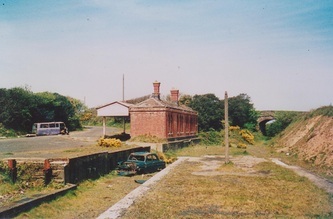 It was the first of the three to close (18-9-24) and was again dismantled and re-erected at Par signal depot, where it survived as a workshop and store until demolished in 1967, when the depot moved to St Blazey. 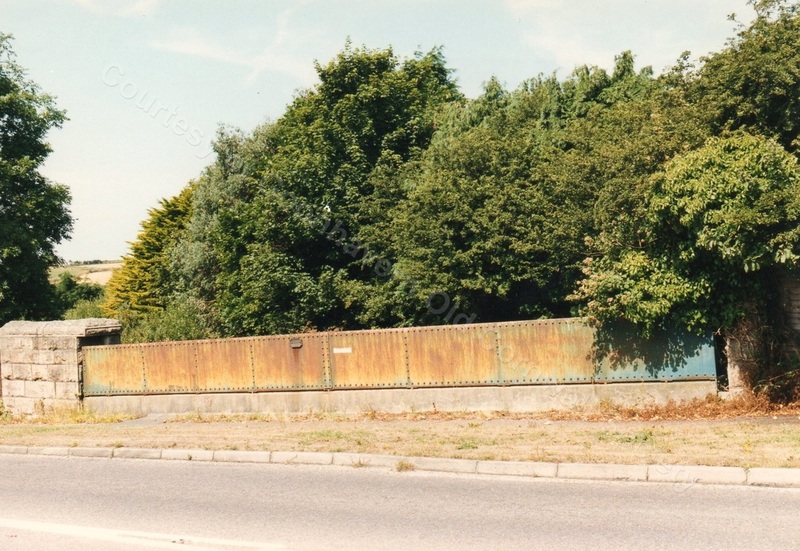 Par signal depot stood on the up side, just beyond the overbridge: the site is notable today for the vast clump of the pernicious Cupressus Leylandii there, which seem to be taking over the place. The normal operation of trains on the branch required East box (on the main line) to be open and also North box. 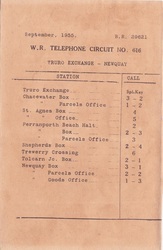 North box issued the electric staff for the section to Perranporth. 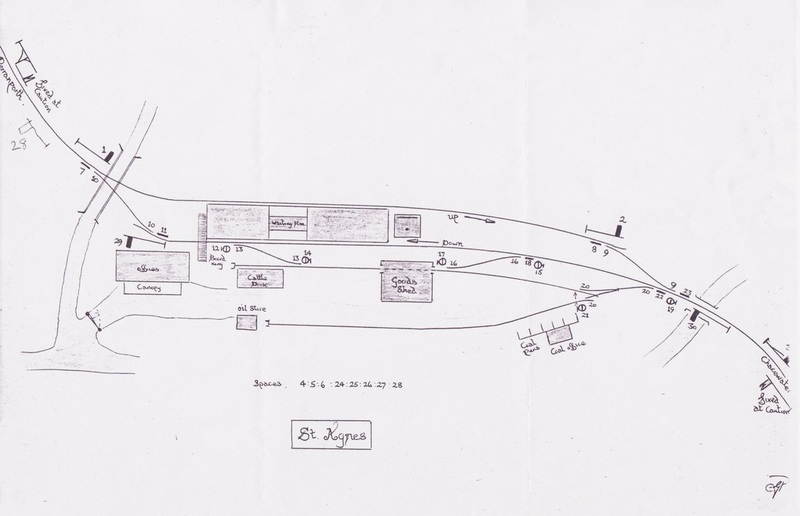 St Agnes was then merely an intermediate station with a freight siding operated by ground frames: trains could not cross there. 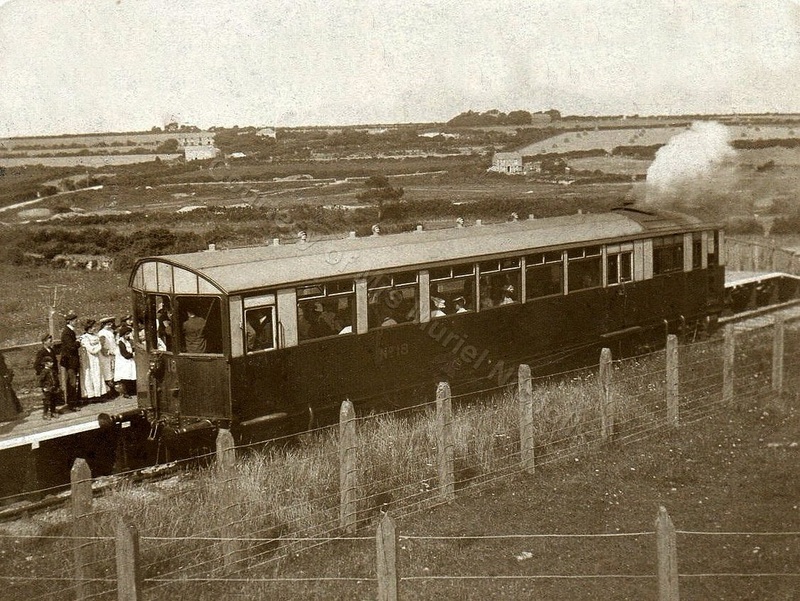 Passenger services between Truro and Perranporth began on July 6th 1903 and were operated by steam railmotors from the start. 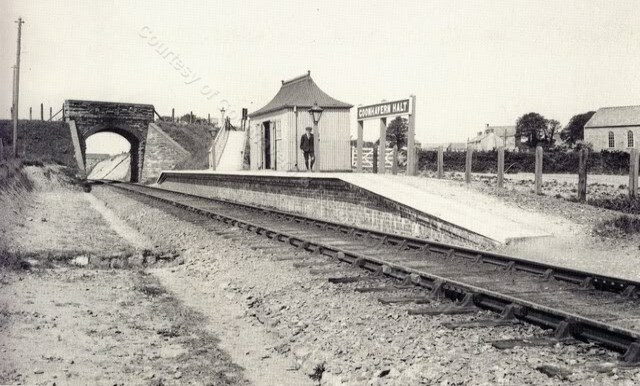 Chacewater station at this time was merely an intermediate station with two, short platforms: trains could neither start nor terminate there. 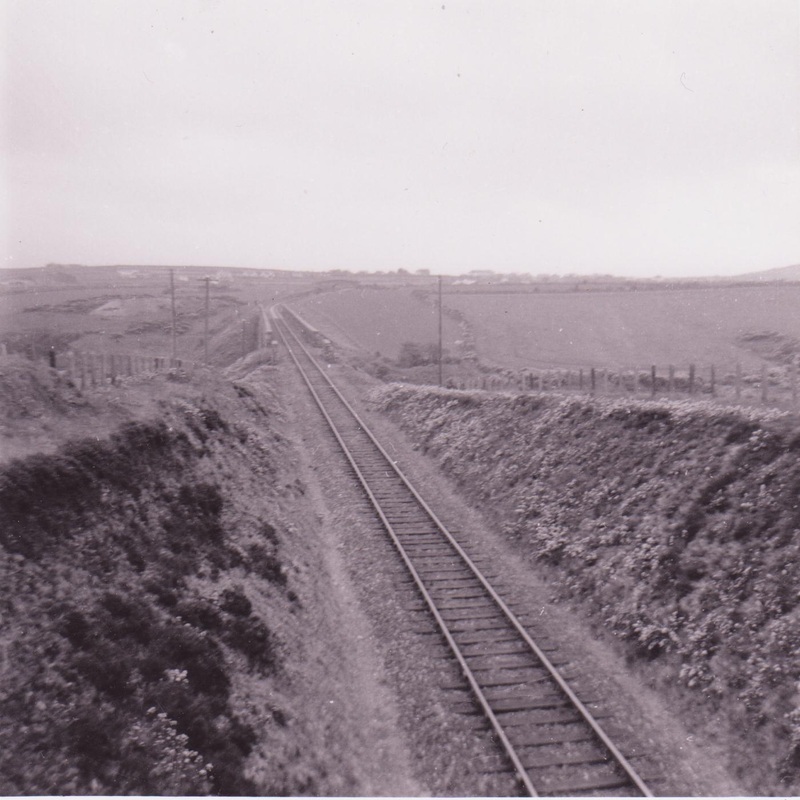 The section beyond Perranporth to Newquay (partly using an upgraded section of the old Cornwall Minerals Railway) opened in 1905. 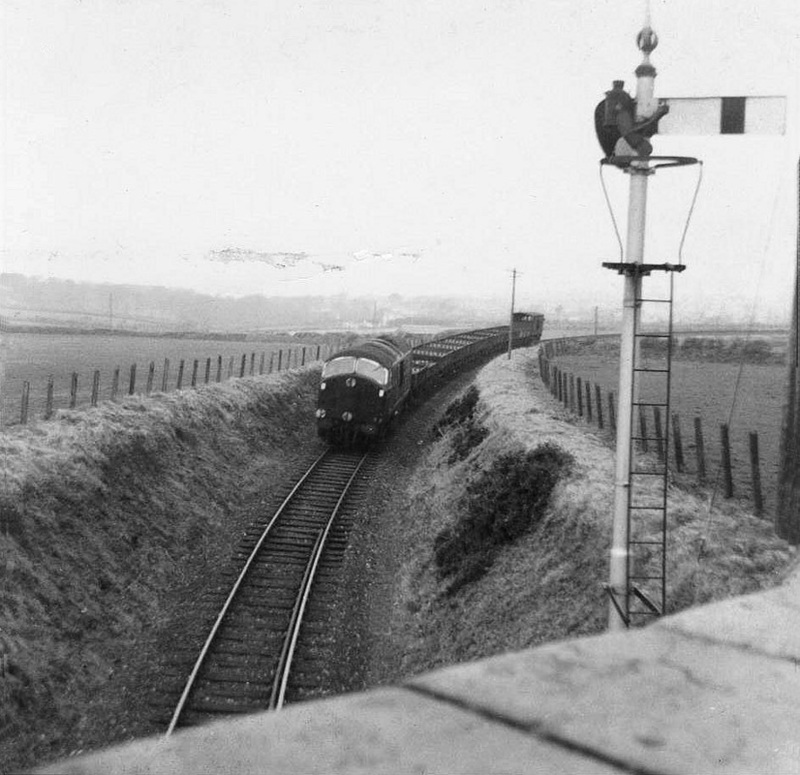 With the West curve virtually unused, the GWR made the inevitable economy in 1924. West curve (officially closed since 1919, but still usable) was removed on September 18th while a new third line into Chacewater station (which had been rebuilt in 1912 with a bay line) opened on November 9th. 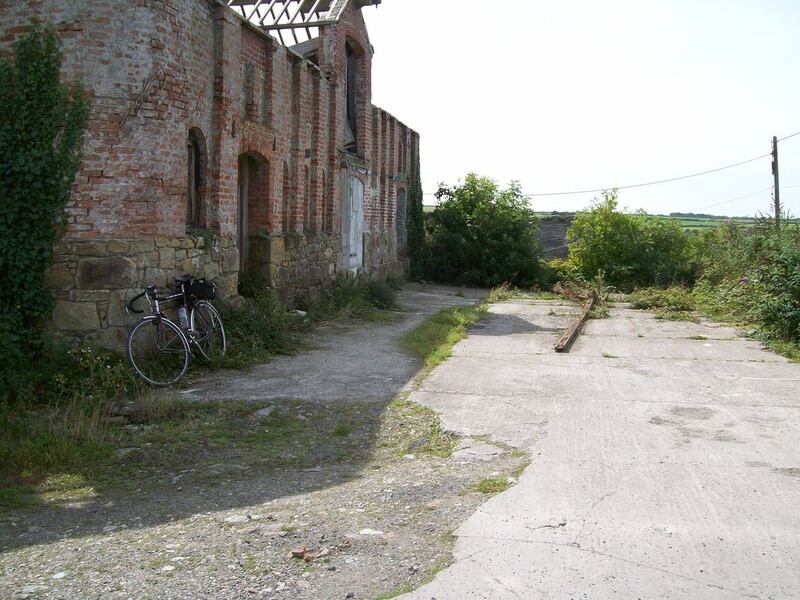 The triangle was constructed largely of mine spoil and was so polluted that almost nothing would grow on it. 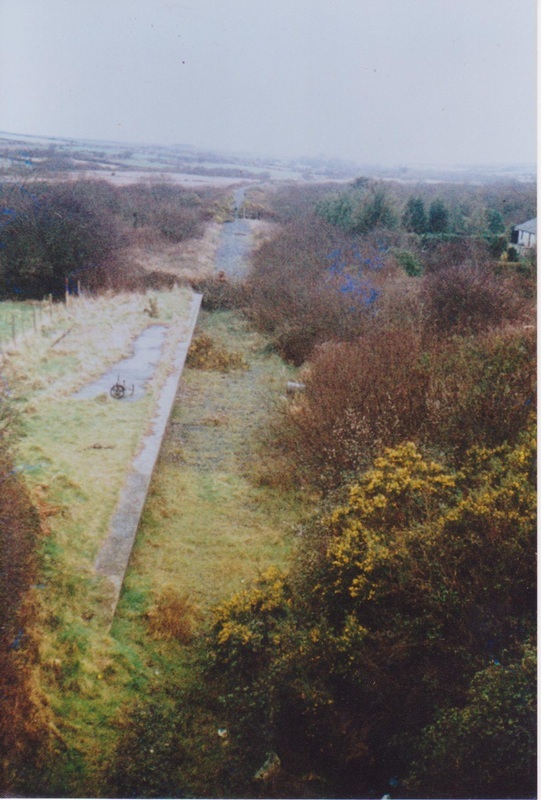 The ballasted formation of the west curve was still a distinctive feature of the view from main line trains until the whole site was bisected by the construction of the A30. A map showing the three Blackwater Junctions. 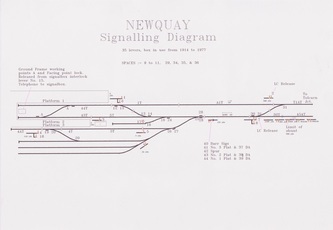 The main line crosses the map from left to right, the branch to St Agnes, Peranporth and Newquay can be seen at the top of this map. 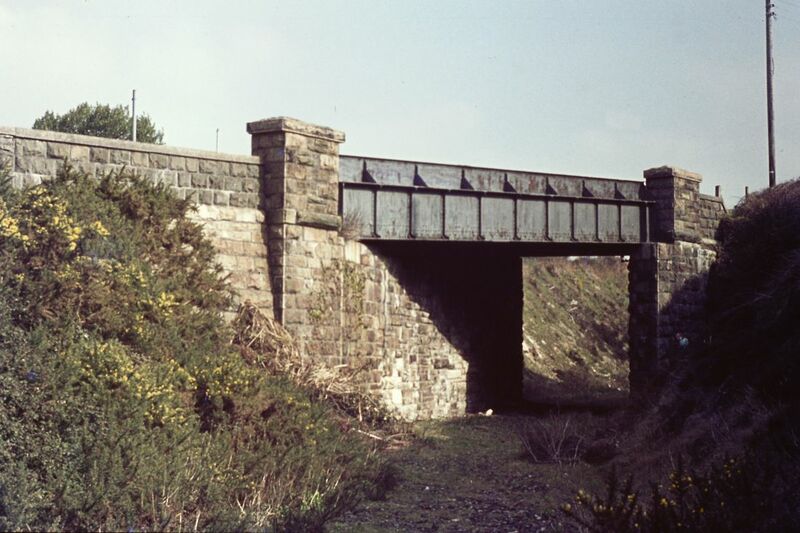 It will be noted that the junction is double tracked on all three face and the Newquay branch is double track as it crosses the A30 and therefore the bridge was quite a substantial structure. The map is from the 25 inch OS map C1900 and is reproduced with the kind permission of the National Museum of Scotland. Blackwater Junctionseen from a down main line train on the 18th February 1964 Copyright K. Jenkin . 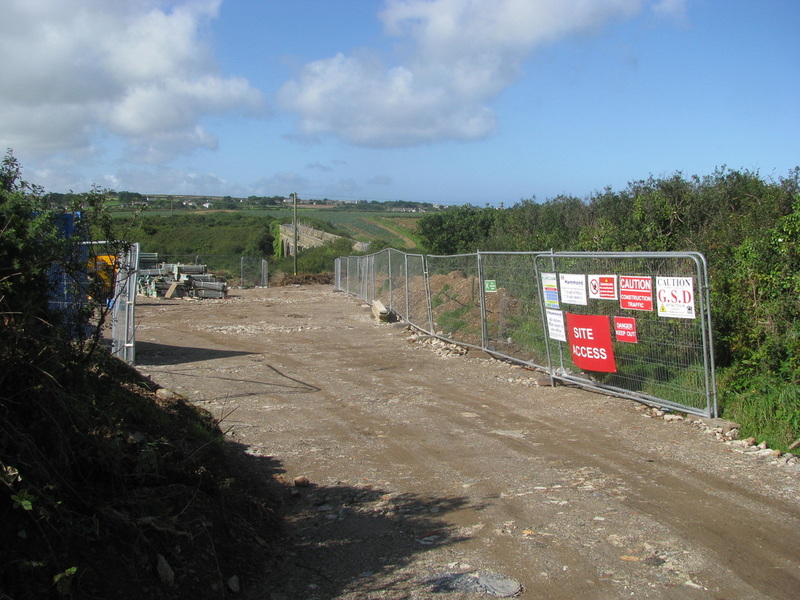 Demolition of the Newquay branch was already in progress, lifting started from Tolcarne Junction and worked back towards Chacewater. Note the polished metals. Blackwater Bridge This bridge and its embankment with the rhododendrons formed a very attractive feature where it spanned the valley to the west of the village of Blackwater. 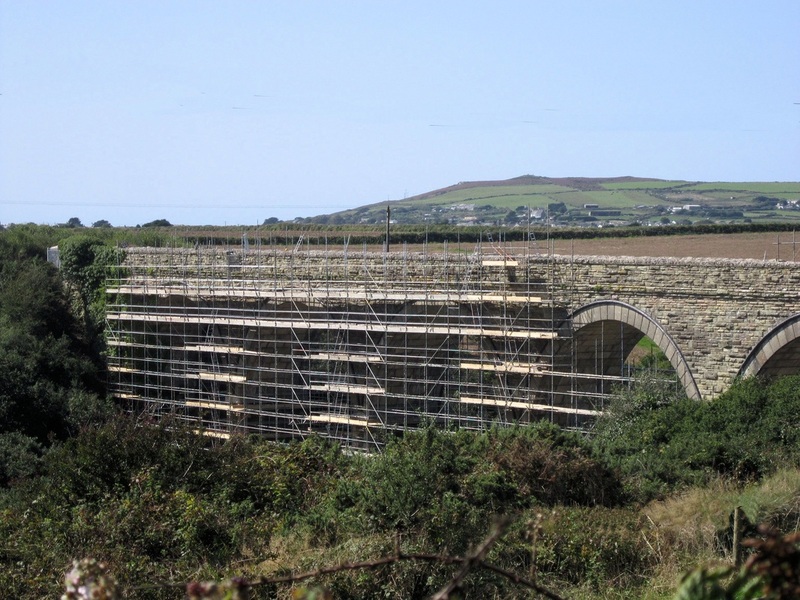 However the bridge crossed the then main trunk route - the A30 and in the interests of headroom and view it had to go - here it is looking very pretty. Pictured by Sid Sponheimer. The picture above zoomed in. One can just make out 'Blackwater Egg Packing Station'. They say that by 'Tre, Pol and Pen' ye shall now the Cornishmen. 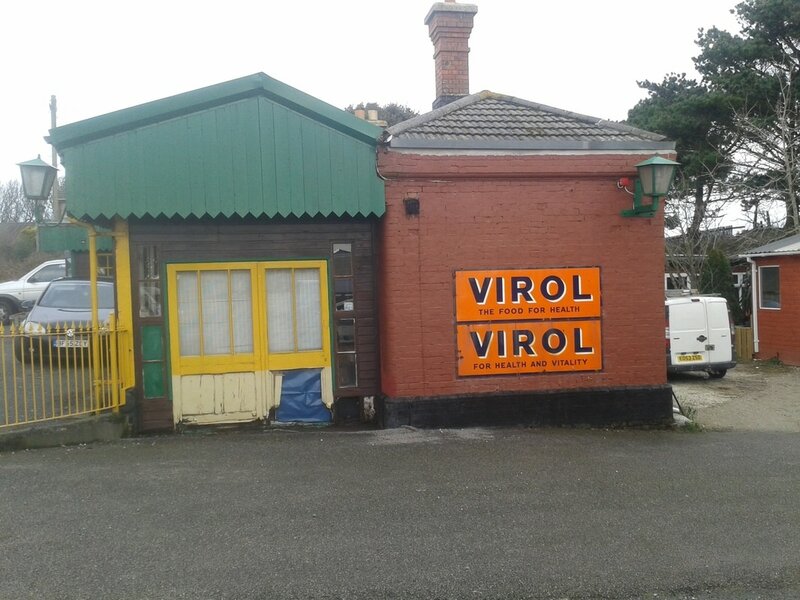 It used to be by 'AF' 'CV' and 'RL' ye shall know the Cornish cars, but sadly no longer!! 23rd August 1964. 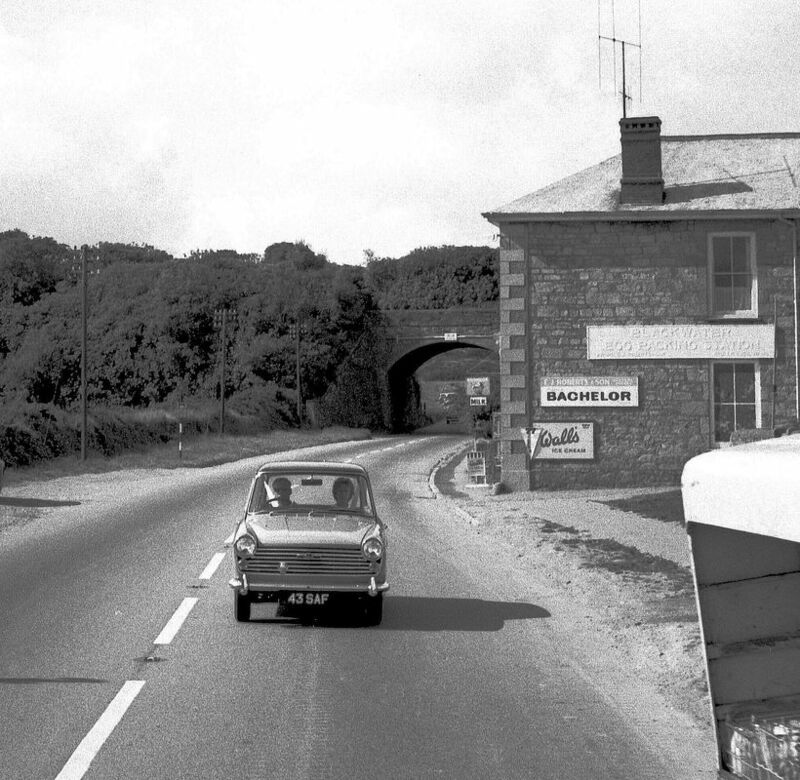 Note the large 'H' TV aerial and the milk float with its glass one pint bottles. Copyright Laurence Hansford. Laurence writes :- Anyway, I just happened to be there when the National Championships were being held at St Agnes and I was dragged along by the St Ives team as I was the only person who owned a camera. One of my chums had managed to acquire an old banger (a battered Ford Popular) and 4 of us went in that; I sat in the back. 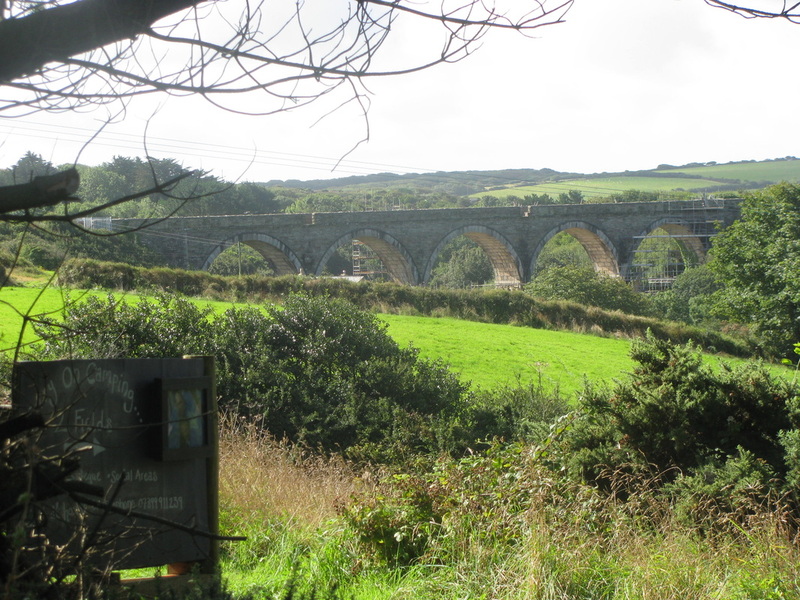 On the way up the old A30 we passed under the Newquay Branch so, looking out of the back window, I took a picture looking west from Blackwater towards where Blackwater North Junction had been. This is the first photo (I know it’s hard to read but the large sign on the building to the right of the road says Blackwater Egg Packing Station). 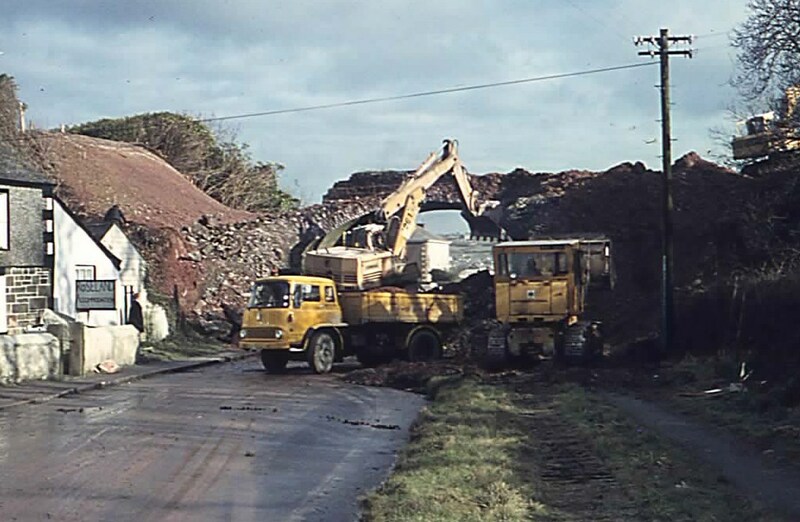 Although preparatory work was done before hand, removing the overburden of the embankment , the actual demolition took place on a Sunday and this vital artery - the A30 was closed for the day. Here Sid Sponheimer has caught the wreckers at work as a fine bridge and floral display is reduced to nothing!! Copyright Sid Sponheimer. 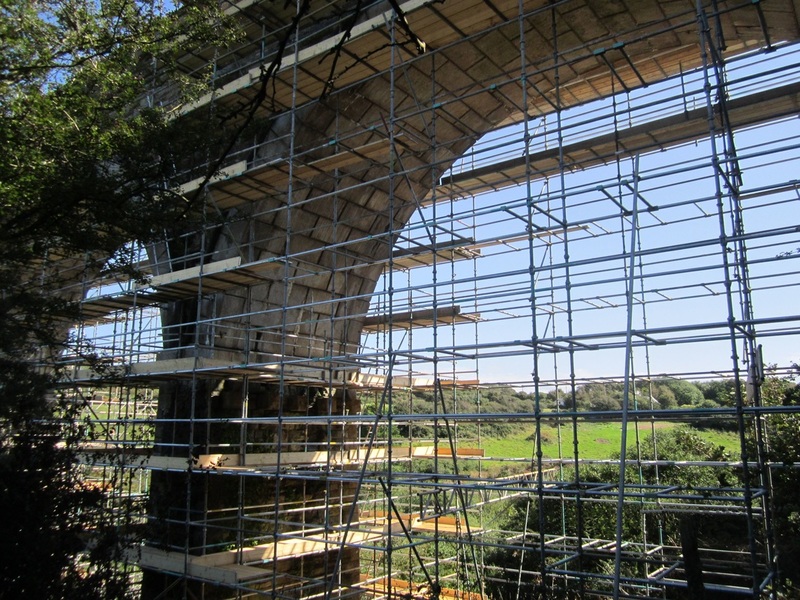 Building the bridge at Blackwater. 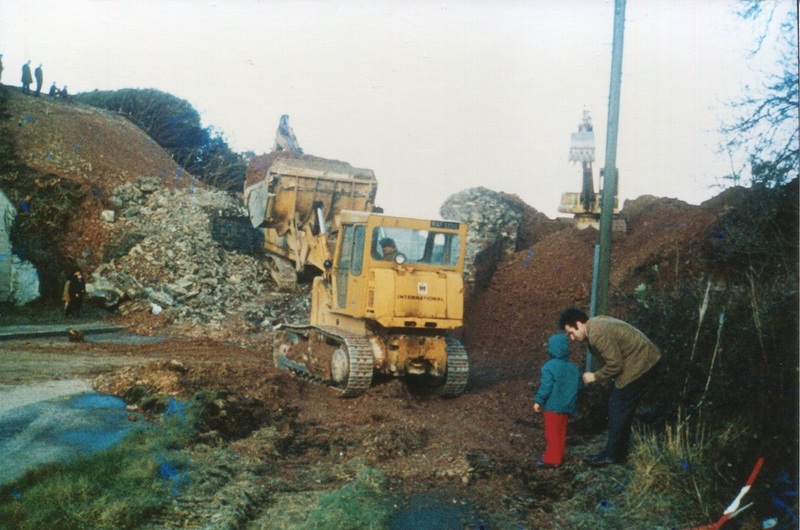 Knocking down the bridge at Blackwater - a press cutting kept by the web masters father. 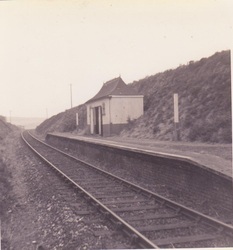 As opened, the Perranporth branch had two stations only: St Agnes and Perranporth. 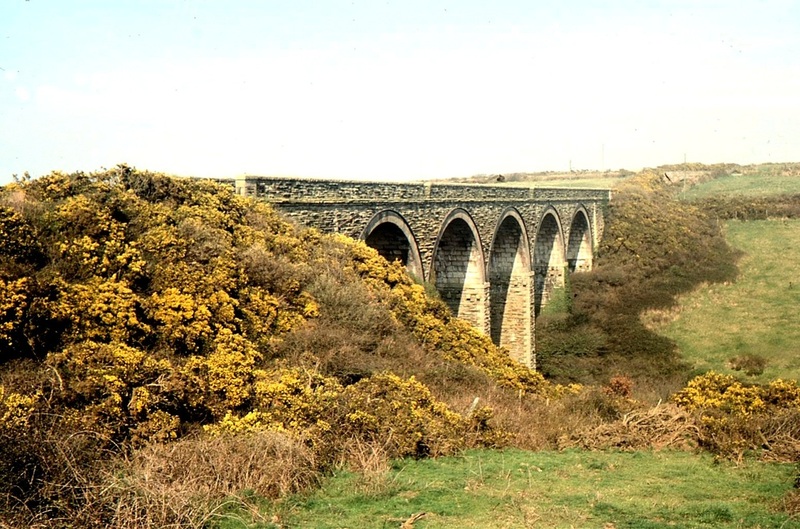 Six halts were opened on August 14th 1905, shortly after the completion of the line from Perranporth to Newquay. 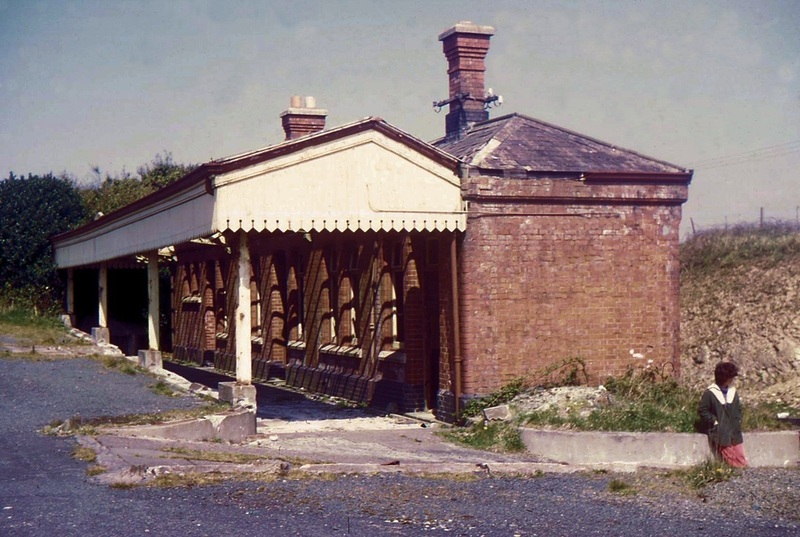 These were all ‘railmotor halts’ with short platforms and the familiar ‘pagoda’ sheds. 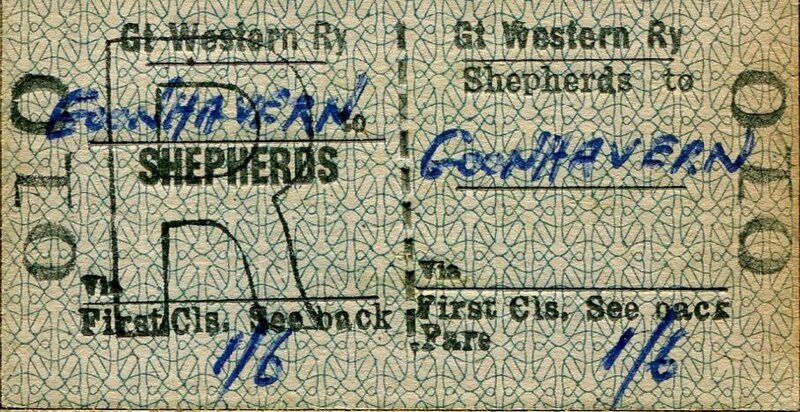 Tickets, right up to the end, in 1963, were sold by the guard. 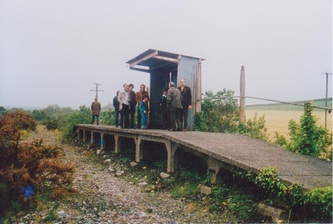 The names of the halts seldom reflected their location: anyone arriving at Mount Hawke Halt and expecting to be in Mount Hawke had a surprise! 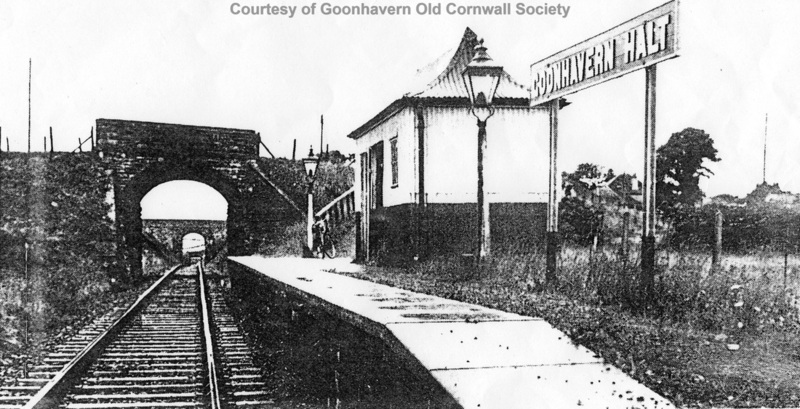 Goonhavern was the only halt actually located in the community it claimed to serve. 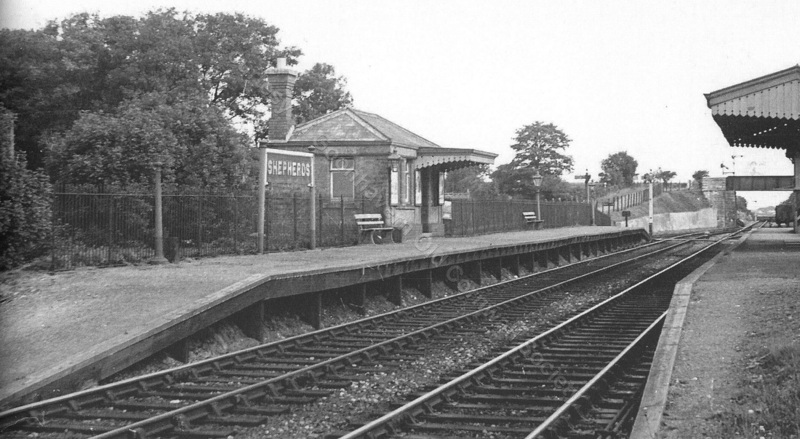 In the early days it had a siding as well, but this disappeared before 1920. 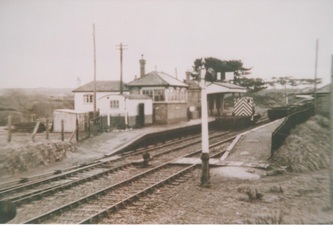 Trewerry and Trerice Halt had a level crossing. This was staffed by a lady crossing keeper and there was a ground frame of 5 levers. 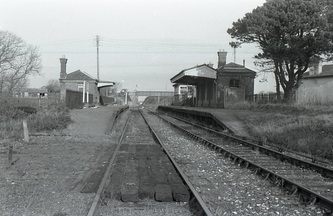 Like other remote crossings on single lines, there were two distant (not home) signals. 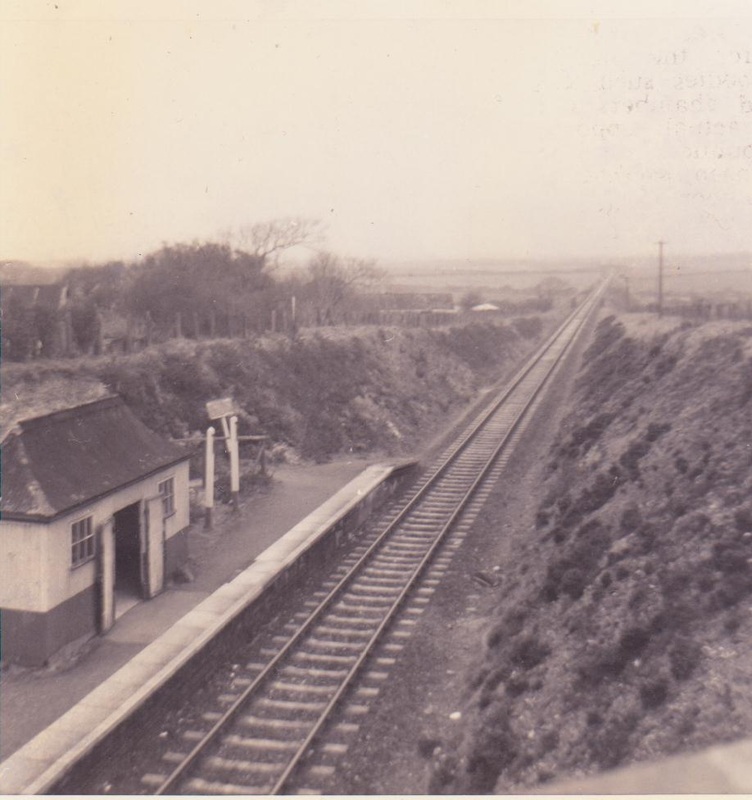 At Trewerry, lever 1 was the up distant, lever 2 the gate bolt, lever 3 the down distant and 4 & 5 the FPL and points for Trewerry siding. 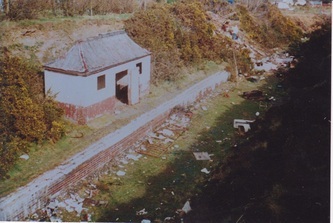 Trewerry was a loop siding, with a short loading bank for Trewerry Mill, which lay alongside the line here. The far (Newquay) end of the siding was operated by a second ground frame. 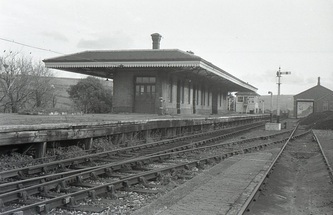 At either end of the siding was a catch point with a revolving ‘dummy’ point disc. Trewerry siding never saw much traffic and was closed and removed in 1948. 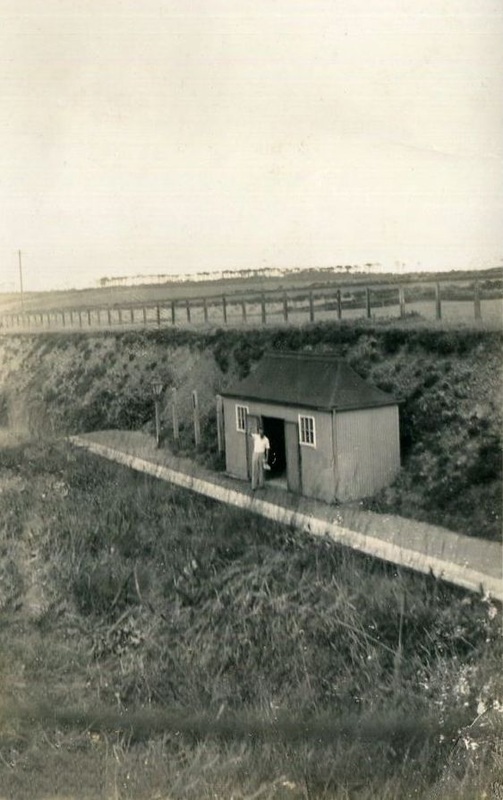 Perranporth Beach Halt was an altogether different proposition: a long platform and a ticket office were provided. It opened in July 1931. From the Alan Harris Collection. 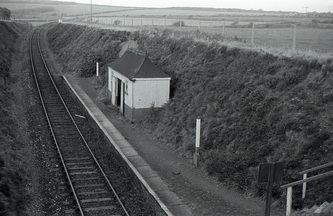 Mount Hawke Halt as a Newquay bound train runs in headed by a Class 55. 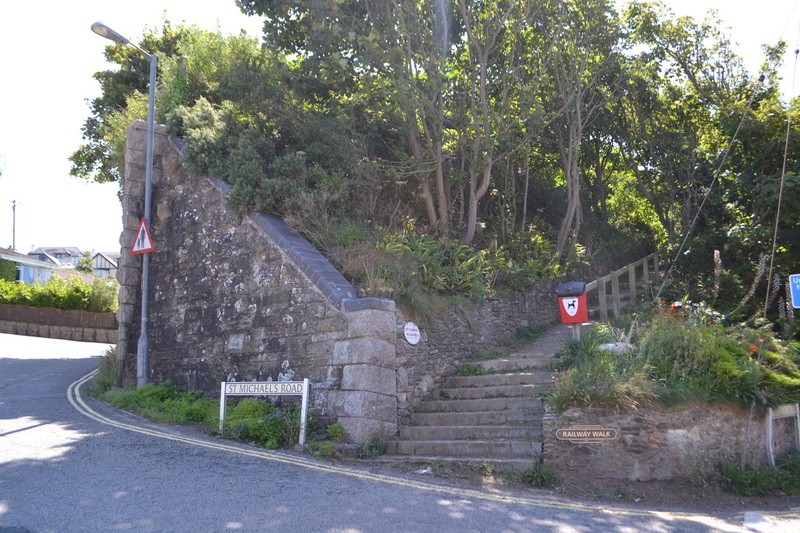 The station access down the flight of steps is very clearly shown in this view. 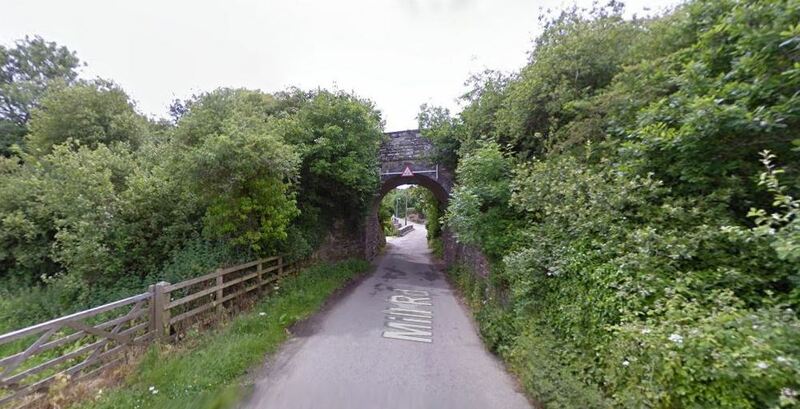 The B3277 Chyverton to St Agnes road passed under the line, rather a nasty bend with the road rising either side. 23rd August 1964 Copyright Laurence Hansford. 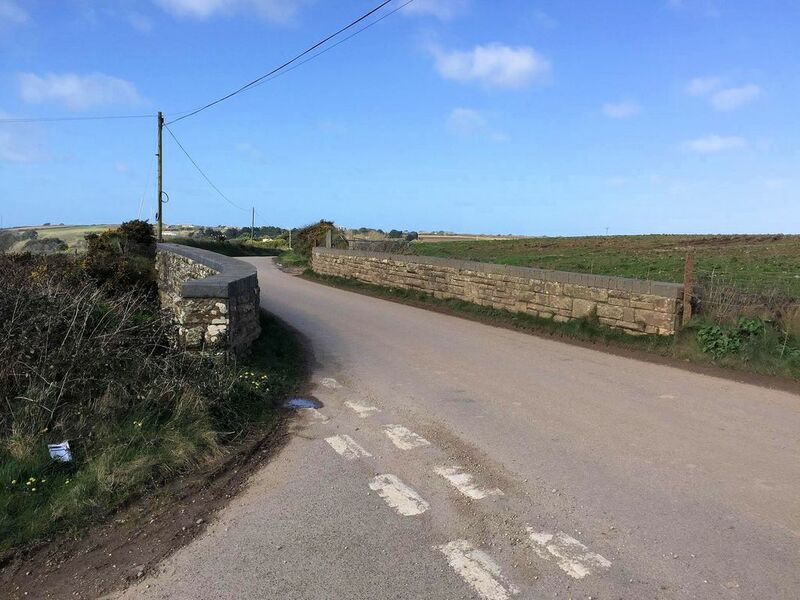 ​Laurence Hansford writes :- Then we went under the line again as we got near St Agnes, this time on the B3277, so I took another picture out of the back window. Shortly after I caught sight of what was happening at the Station and managed another back window shot, but that was all – at least for the time being. 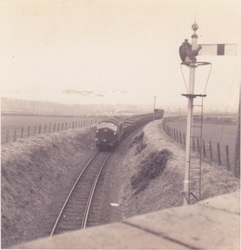 In this view alongside the station one can see the B3277 dipping down to pass under the line and then climbing towards Chyverton. Note the ominous sight of the demolition crane in the yard. 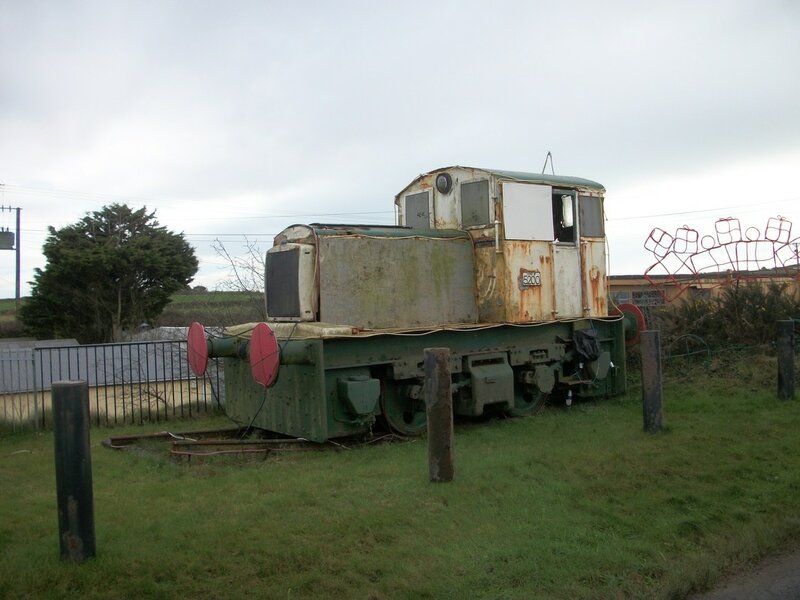 An ex Devonport Dockyard shunter now occupies a space through the fence to the left. 23rd August 1964 Copyright Laurence Hansford. 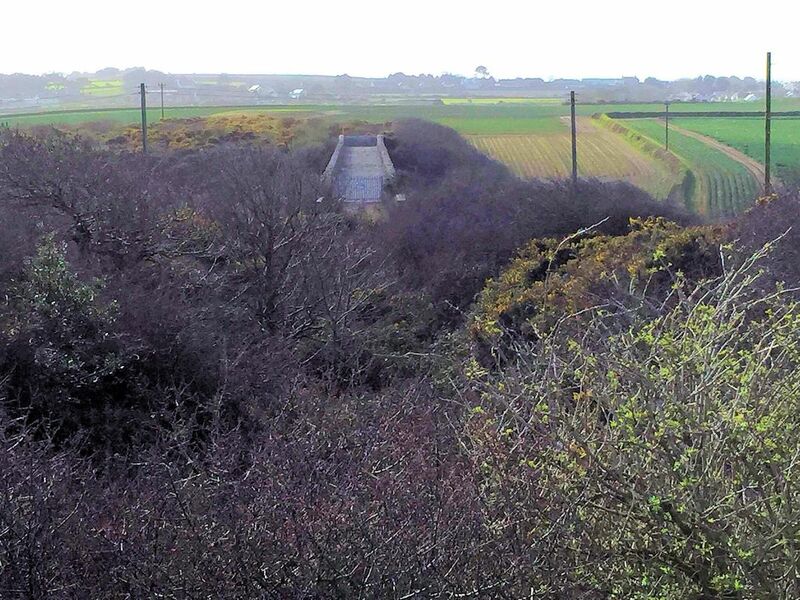 Please see mention of St Agnes Museum at the foot of this, the St Agnes section. 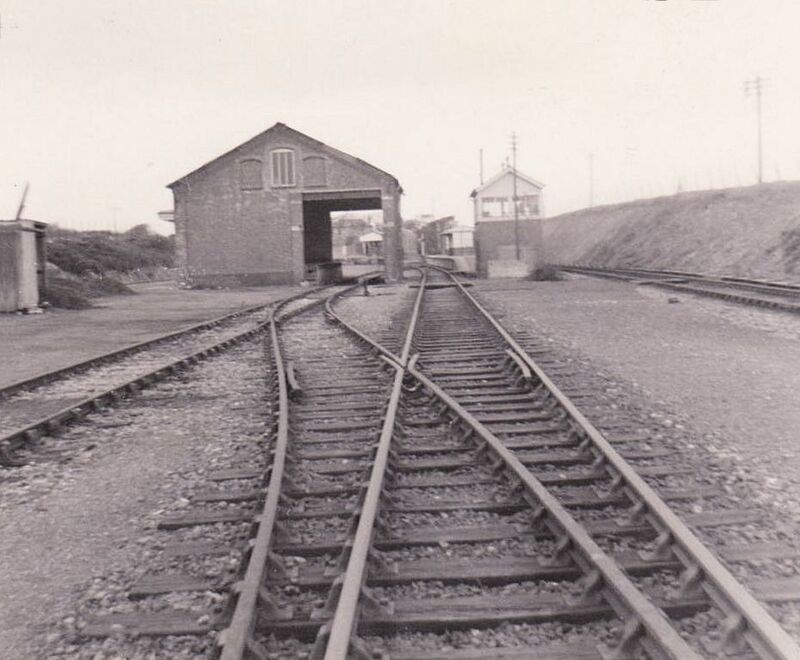 As opened in 1903, St Agnes was a one-platform station with a simple loop siding serving the goods shed. The points were operated by two ground frames, released by the train staff. 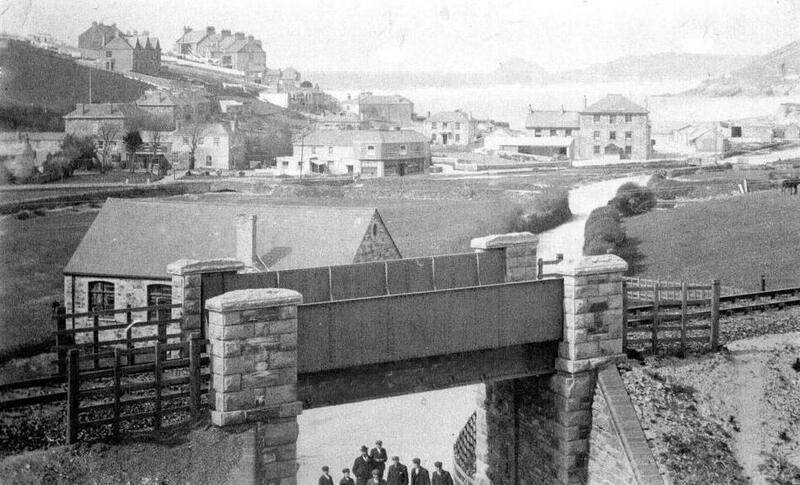 In 1903, the whole line from Blackwater to Perranporth was one electric train staff section, i.e. 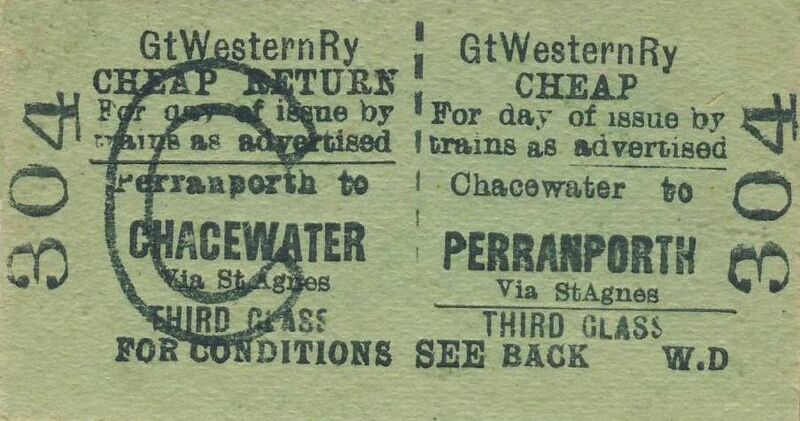 only one train could be in transit at a time, though any number of trains could follow one another, but the section was long and a following train had to wait at Chacewater or Blackwater for the preceding train to reach Perranporth and vice versa. 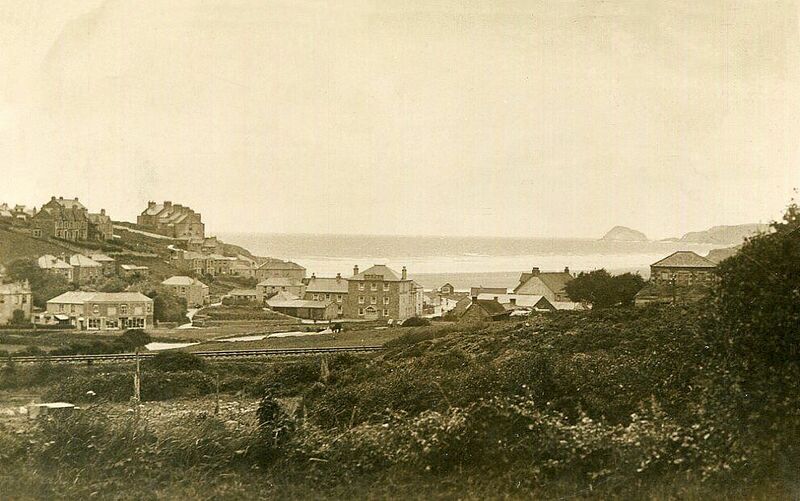 The spur for growth was when St Agnes hosted the Royal Cornwall Show in 1909. 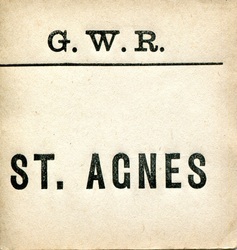 To cater for mass arrivals both of exhibitors and public, the Great Western Railway made St Agnes a temporary staff station. 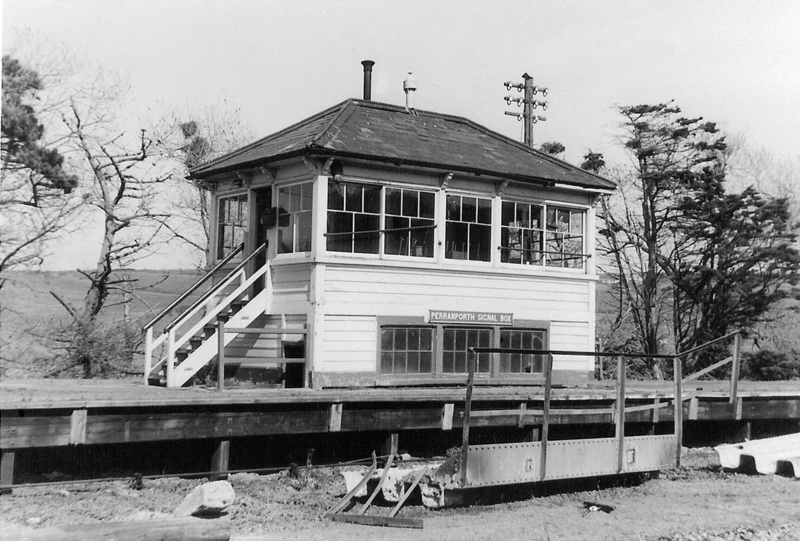 Electric staff instruments were placed in the station building and a new ground frame replaced the former East one, with extra levers to operate home and starting signals in either direction. 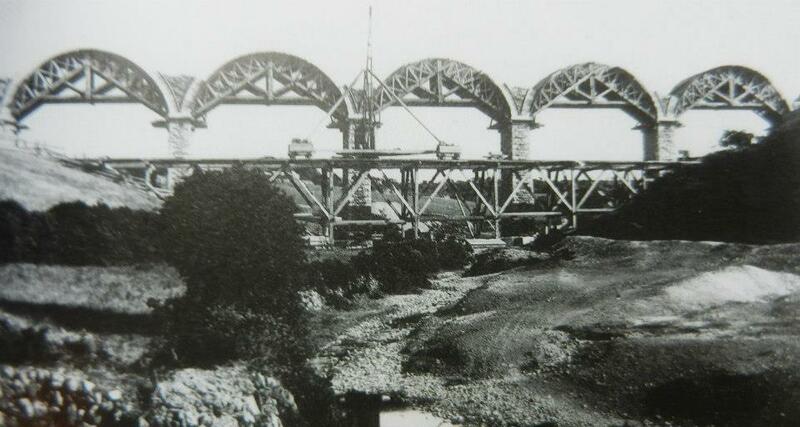 The work was completed on May 20th, 1909. 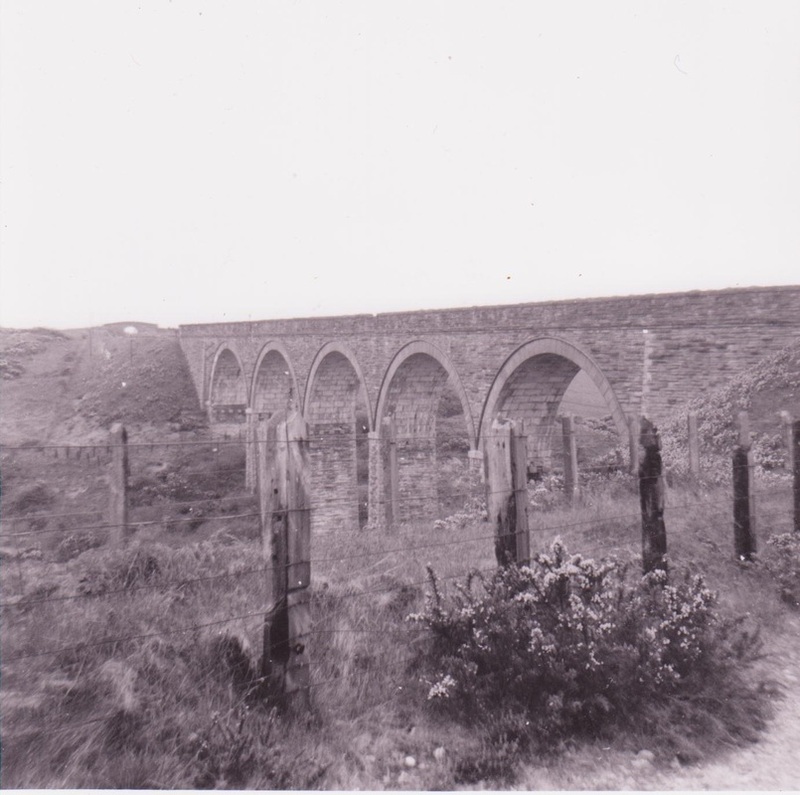 Thus there was a staff section Blackwater North-St Agnes and another one, St Agnes-Perranporth. 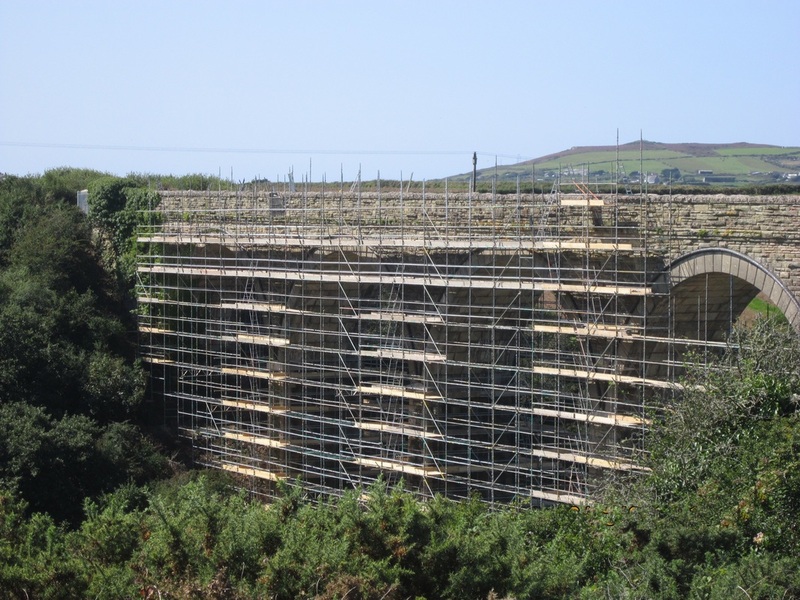 This new arrangement allowed for two passenger trains to be en route between Blackwater and Perranporth, one in each of the new staff sections. As St Agnes remained a one-platform station, two passenger trains could not cross there: only a passenger and a freight, as long as the freight was in the siding. This arrangement was a success for the RCS and afterwards, in October, it was made permanent. 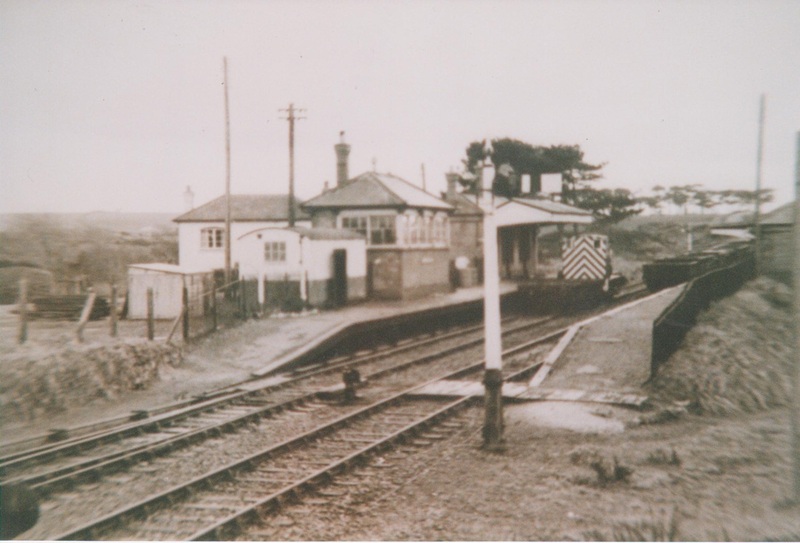 St Agnes was staffed by a porter-signalman who, because the staff instruments were in the station building, could manage station work as well. 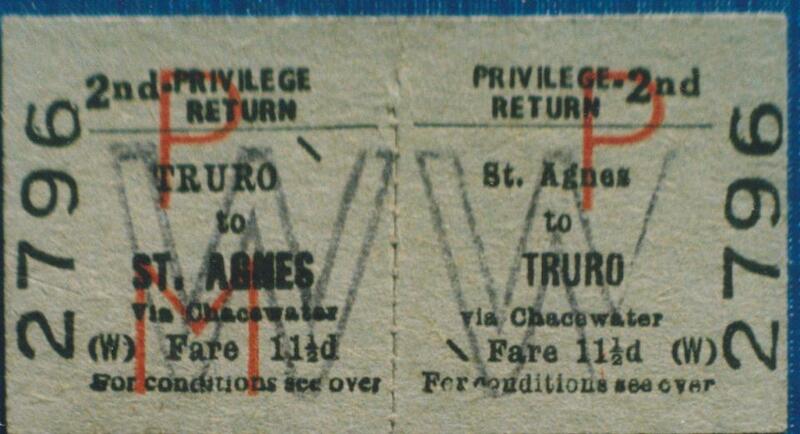 In 1924, following the abandonment of Blackwater junction, the staff section became Chacewater-St Agnes. 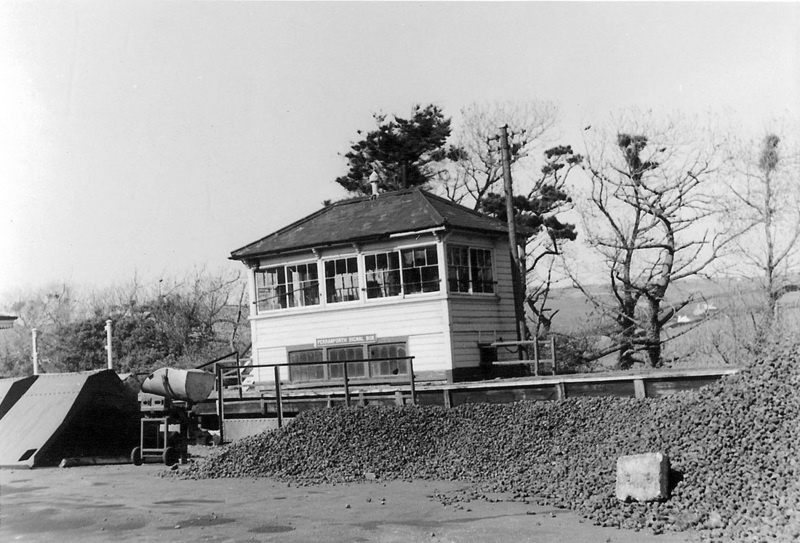 In 1936 a new, island platform was constructed and the old platform demolished. 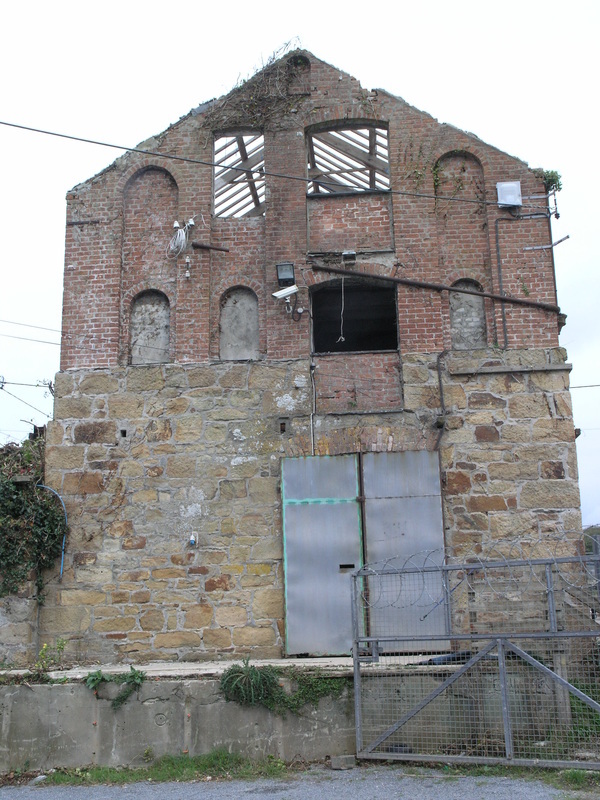 The doors and some of the windows of the station building were blanked off. 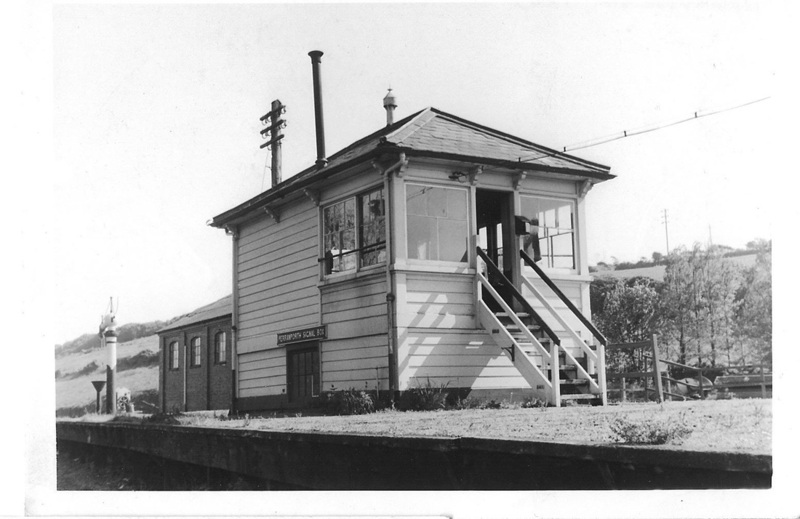 A new signal box with a 30-lever frame was built and the new layout opened on January 12th, 1937. 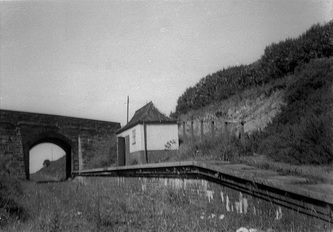 A footbridge connected the station approach with the new island platform; it seems to have had a short life, for it had gone by the 1950s. One wonders why. 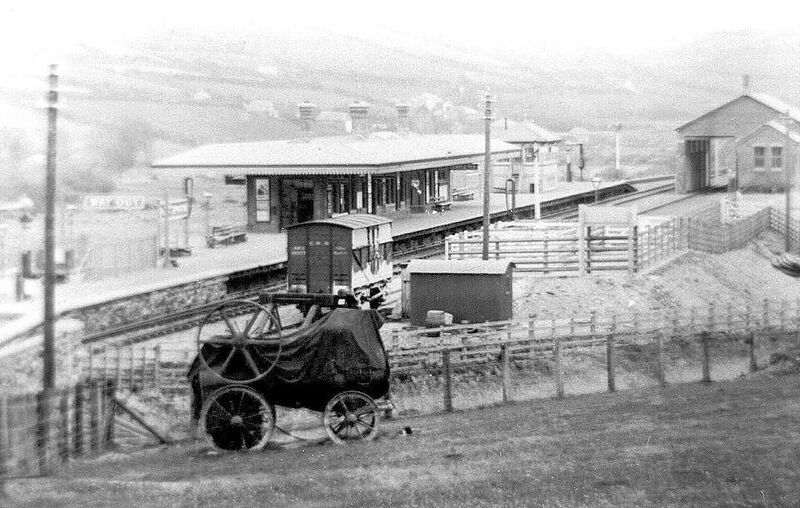 A 1902 photograph from the Alan Harris Collection.The very interesting thing in this picture it that it was taken during the very early days of constriction, the track is temporary, the awning is under construction, the road bridge in the background is also nowhere near complete. 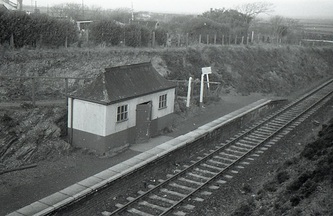 The building is, in 2018 still there, though earlier modifications in connection with the provision of a passing loop saw the platform removed and replaced by an island platform served originally by a footbridge and later by a level crossing. 2) St Agnes. 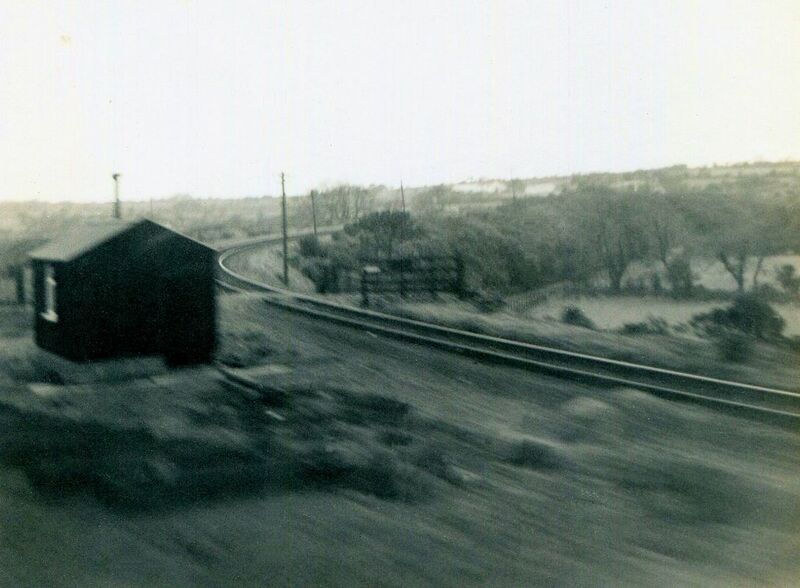 Train heads away towards Chacewater. Copyright J. Wood Collection. 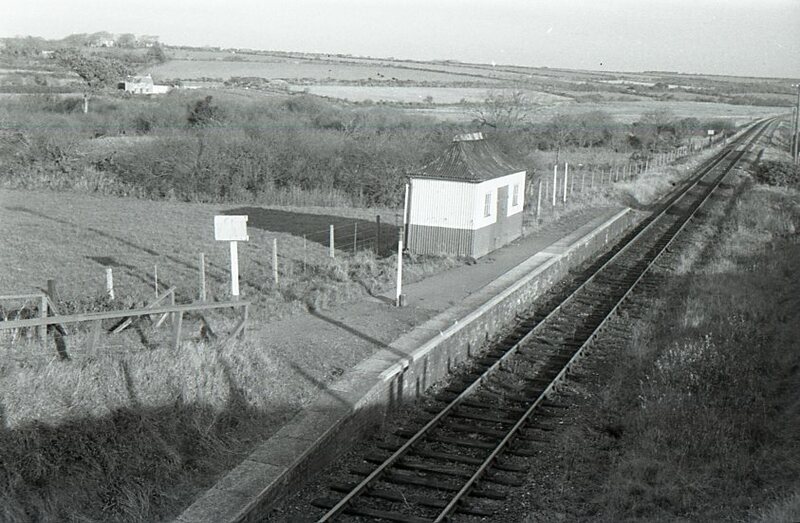 St Agnes station - a view taken on Christmas Day 1963. Copyright Keith Jenkin Apologies for the film defect on the left hand side. 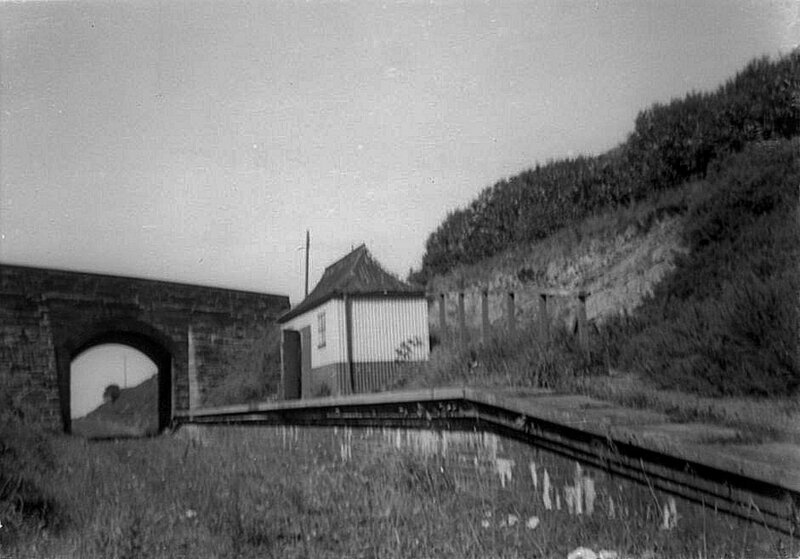 The station and box that I knew at St. Agnes were the result of a rebuild in 1937 when an island platform and passing loop were constructed. My railway career began there as porter/signalman. 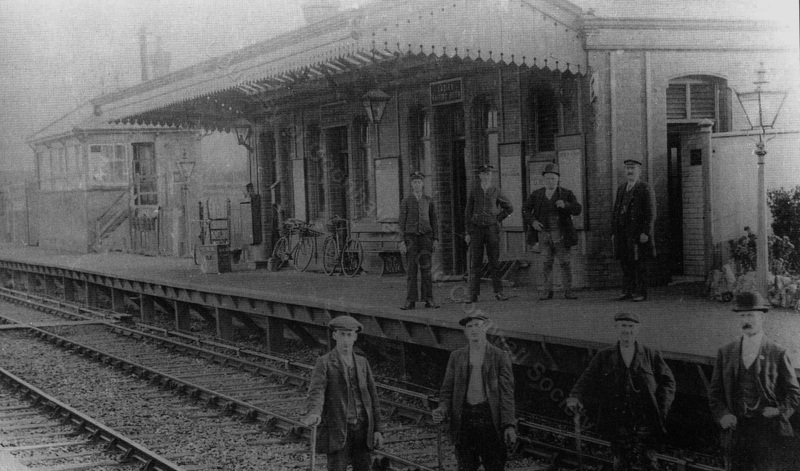 This meant that on "early turn" I would sign on about half an hour after the signalman had arrived to accept the first train of the day. My duties would then be portering on the station, issuing tickets etc. until the signalman came to the end of his shift. Then I had to man the box for a couple of hours until the "late turn" signal man arrived. 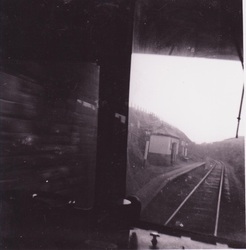 Similarly when I was on late turn I'd arrive in time to take over the box from the early turn signalman to cover the middle of the day and once the late turn signalman arrived I would revert to my station duties.On late turn I also had to light the lamps at Goonbell Halt about half a mile down the track. When I worked at St. Agnes the regular signalmen were Basil Penna and George (Digger) Rice. 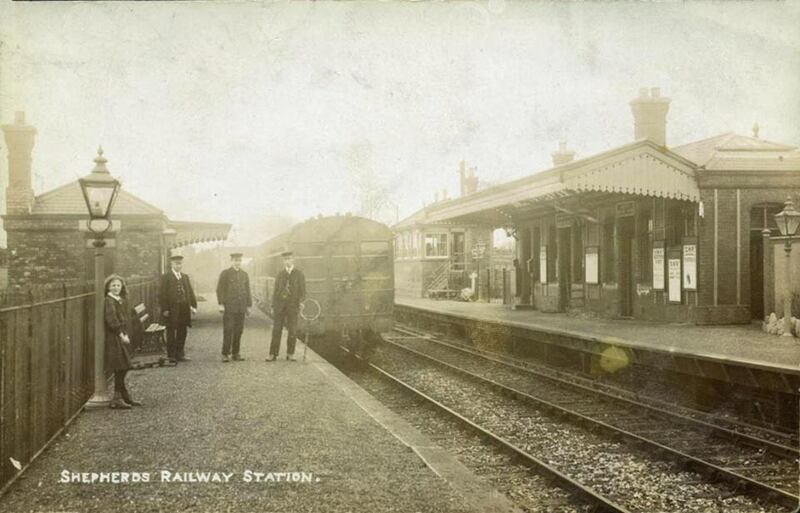 Both were experienced railwaymen who were very helpful to me. The variety of duties gave me a good understanding of railway working practices and I studied the Rule Books in great detail passing my first Rules Exam after six weeks at St. Agnes. I soon learnt that Monday was "clean up" day in the boxes (something not mentioned in the Rule Books) when floors and brasses were polished, lever handles burnished and stoves and frames blackleaded. 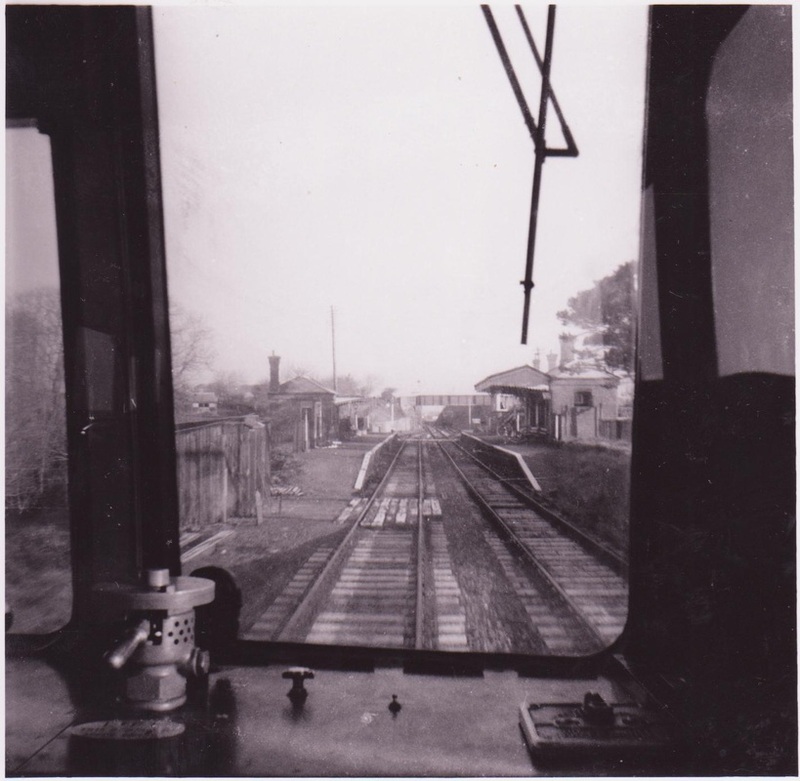 Regular signalmen took great pride in their boxes and later in my career as a relief signalman I always made sure I maintained the standards in the many boxes that I visited. 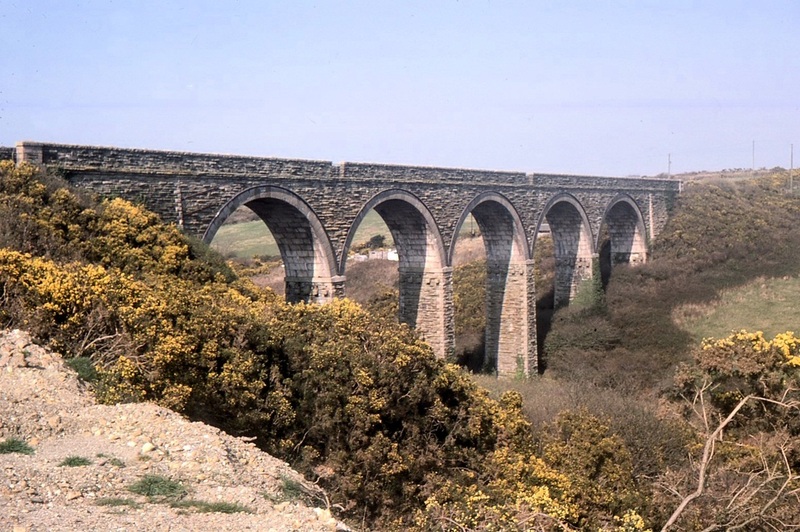 During my early days at St. Agnes I used to cycle to and fro from Camborne although often, after early turn, I'd hitch a lift on the train to Chacewater and catch a main line train home. 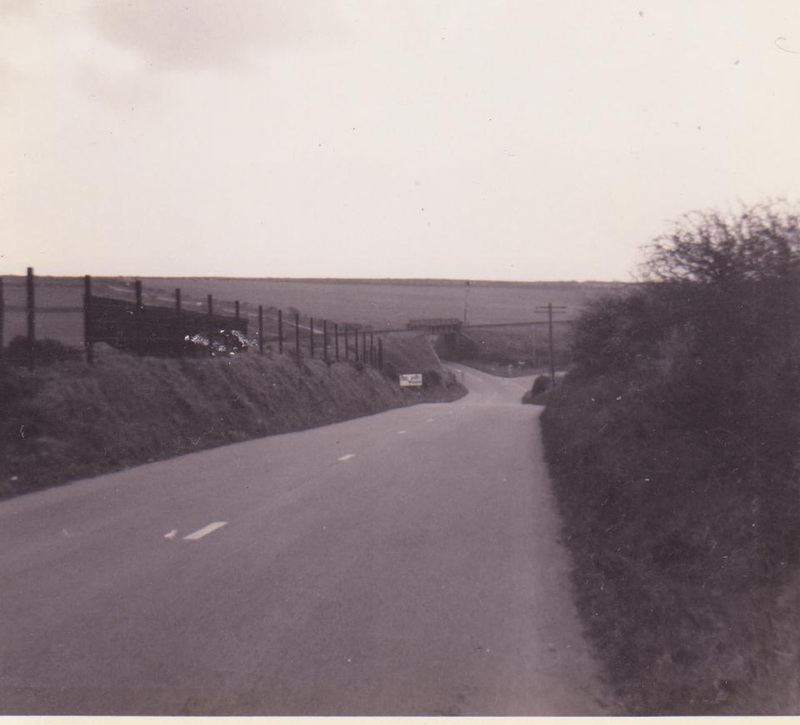 Later, journeys to the boxes in my area (Probus to Penzance + branches) were made on various motorbikes and later still, in the "comfort" of a Reliant 3-wheeler...It was always good to relieve at St. Agnes as it was my first railway job. St. Agnes box was built of brick with the usual wooden sliding windows on the upper level. 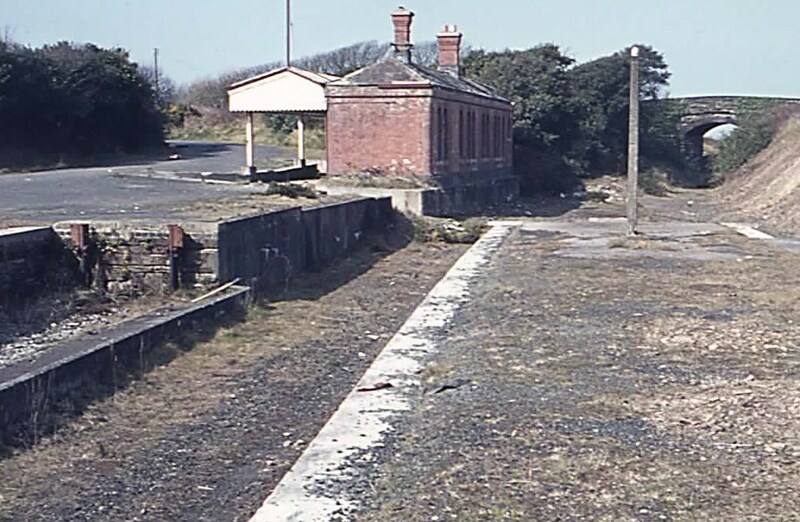 It was situated at the Chacewater end of the island platform and was fitted with a 30 lever frame although by the end I believe only 24 were in use-7 controlling signals, 6 controlling discs, 5 controlling points and 6 controlling facing point locks. 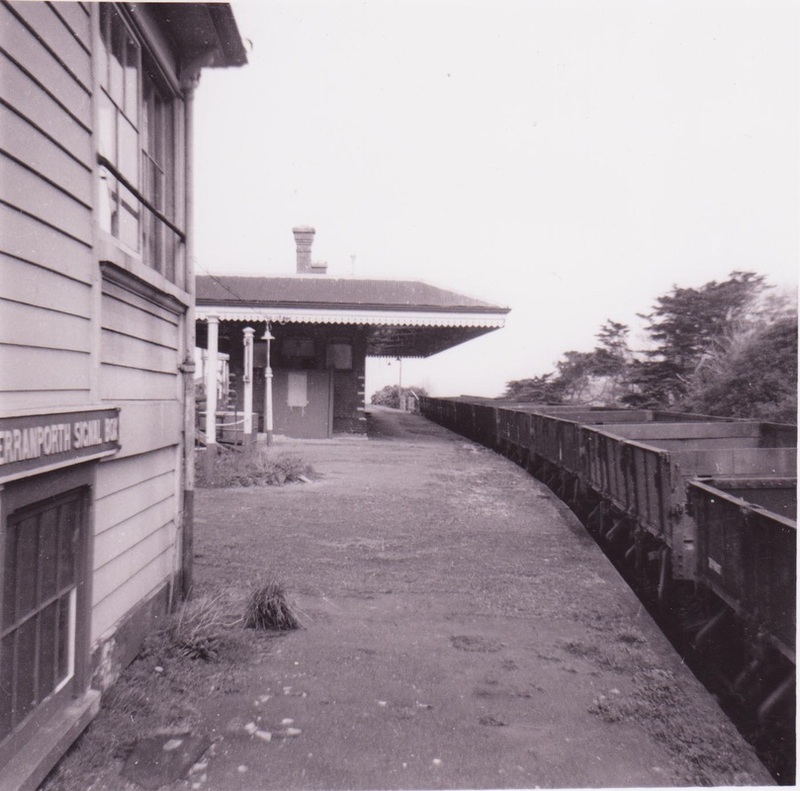 The stairs were inside and the box contained all the fittings for the signalman's comfort apart from a toilet-you used that in the station building. 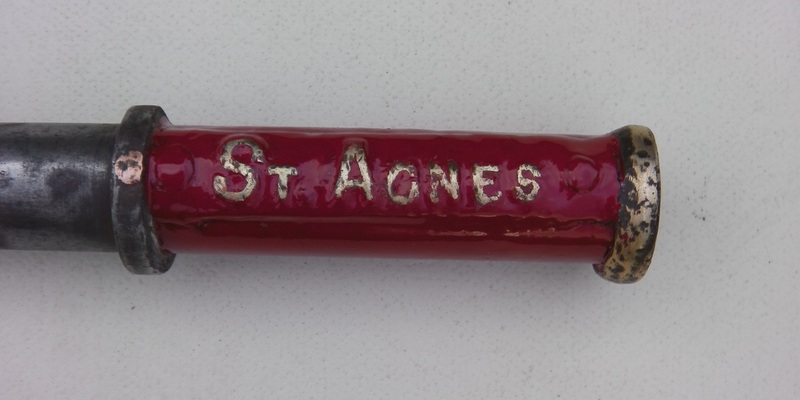 There were two electric train staff instruments; one for the St. Agnes-Chacewater section and the other for St. Agnes-Perranporth. 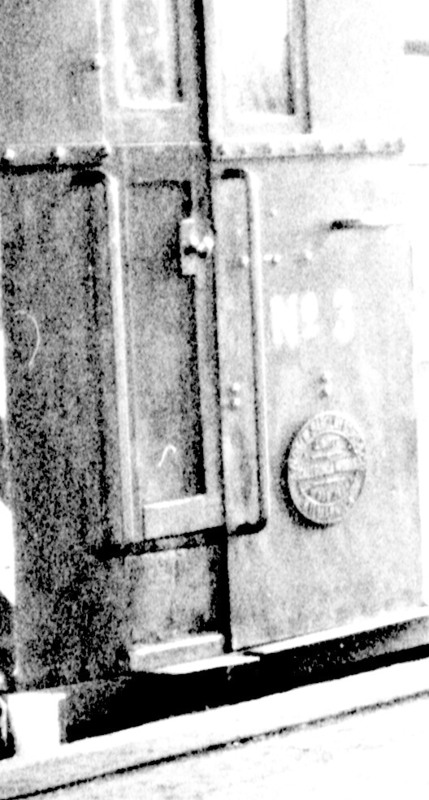 There were also two occupation key boxes to control the movement of the gangers' motorised trolley. 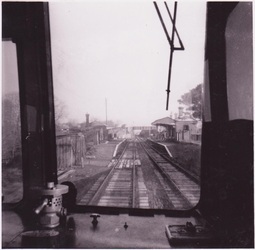 With a regular service running on the single line branch it was impossible to leave the trolley on the running line so the gangers were given an occupation key for the relevant section. 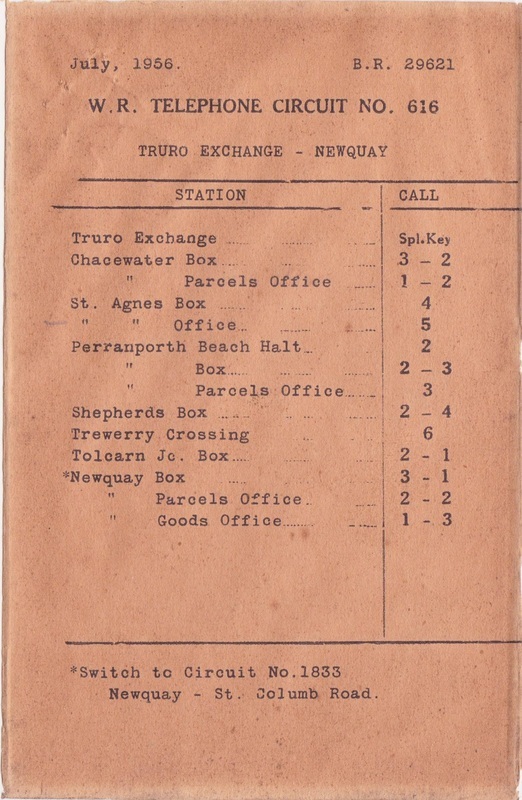 This could only be released from St. Agnes box by the joint actions of the signalman at St. Agnes and his colleagues at the other end (ie. 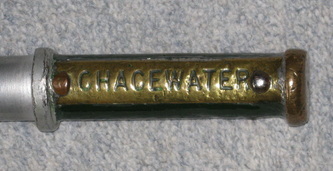 Chacewater or Perranporth). 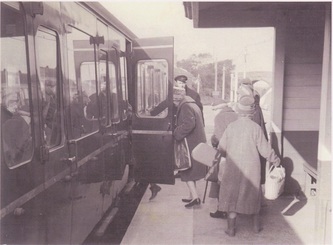 The action of releasing the occupation key disabled the train staff token machines and prevented a train from entering the section once the trolley was authorised. 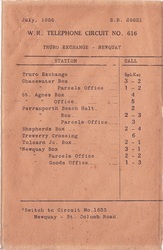 At various places within the section there were boxes for receiving the occupation keys. When the trolley arrived at one of these points it would be manhandled clear of the running line using a special "turntable" which was carried on the trolley. Once all was safe the occupation key would be inserted in the box and the train staff machines at the adjacent signal boxes would be enabled thus permitting the resumption of normal services. 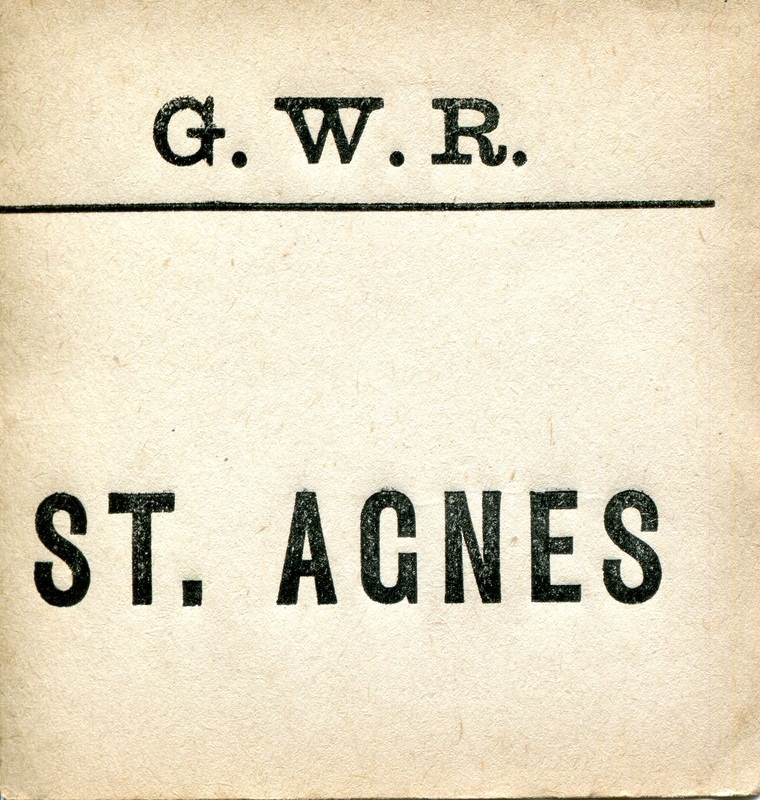 When the gangers wished to return the trolley to the track they would contact St. Agnes by phone and, provided the line was clear, obtain permission to remove the key from its box and replace the trolley on the track. 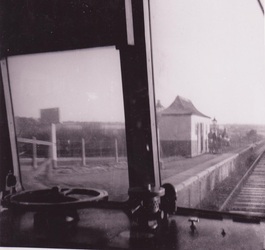 Once the occupation key had been returned and replaced in the signal box normal working could be resumed. Latterly the E. T. S. machines were replaced by more modern token instruments which were easier to handle. 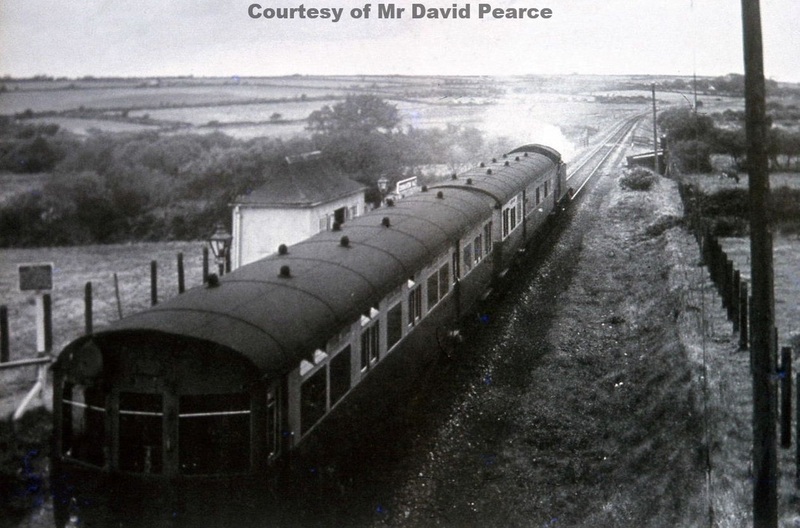 Regular passenger services consisted of anything from 2-4 coaches usually hauled by 45/55xx tanks although sometimes 57xx panniers from Truro Shed were pressed into service and proved capable performers. 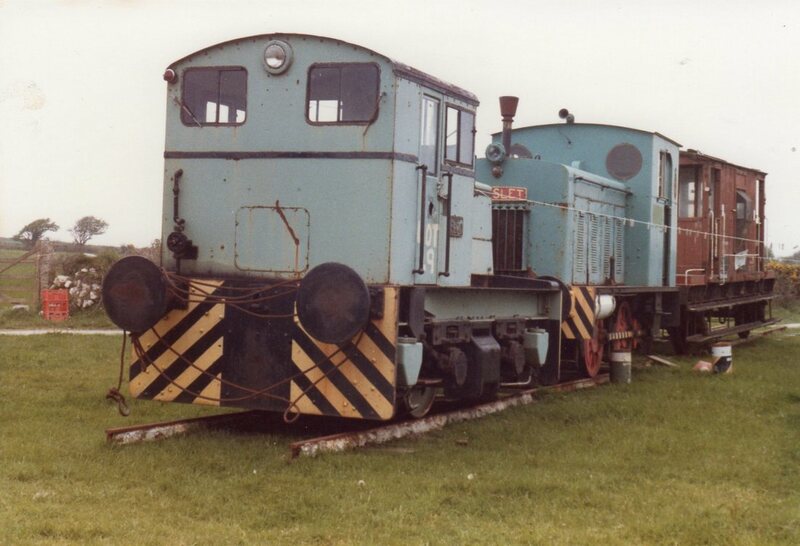 In the early 60s D63xx diesels took over to be replaced by dmus in the months before closure. 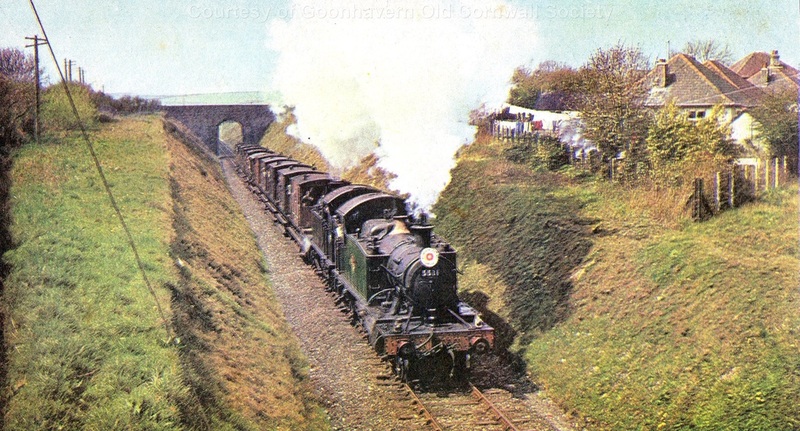 On some occasions the branch freight was worked by a 63xx 2-6-0 tender engine perhaps as a way of getting the loco back to Newquay to work traffic on the line to Par. The goods was shunted daily in steam days. Traffic was mainly coal which was weighed and distributed from the yard plus assorted vans with a variety of cargoes. 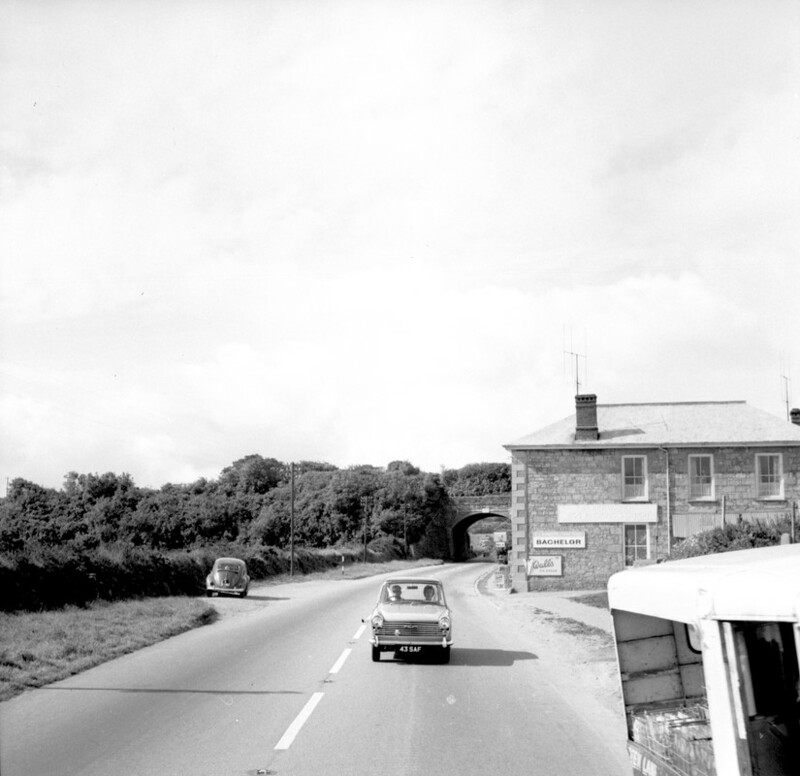 On one occasion in 1958 a whole farm, equipment and livestock, was transported in a special to a destination in Wales. In later years the back road served a ShellMex depot and during the summer months camping coaches were berthed in the cattle pens siding. 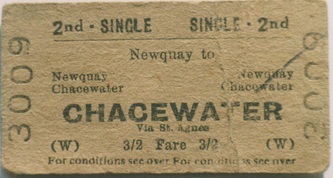 The Chacewater- Newquay had a unique atmosphere and was operated by a dedicated team who took great pride in keeping the service operating. However, as always, there was an assortment of characters who delighted in playing the odd practical joke or two.....or more...! 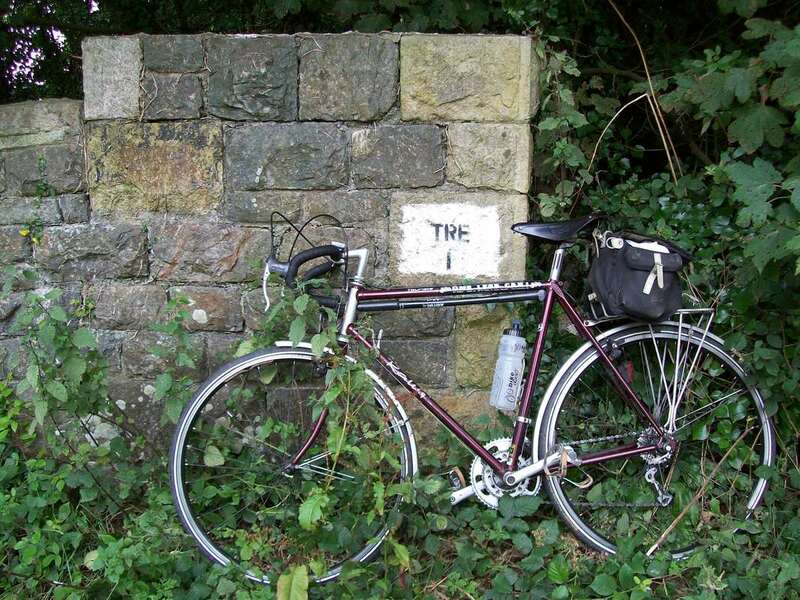 One morning, in mid winter I cycled to St. Agnes to open up for the early shift at 6am. I went to the box and unlocked the entrance door at the foot of the stairs, opened it - to be greeted by a terrific crash. On leaving the previous night one of the aforementioned regular signalmen had tied a bucket to the top of the steps in such a way that when I opened the door...down it rattled. 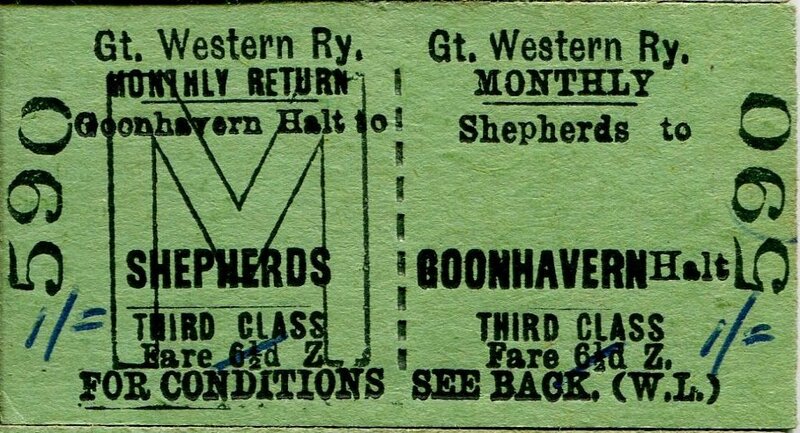 Late one evening I was in the booking office checking the day's ticket sales when I was startled by a commotion from the parcels room next door. I went in to investigate and tripped over a dead fox placed there by one of my colleagues! The same person once went to change staffs with the crew of a Truro bound train and simultaneously tossed a stinkbomb onto the footplate. However, the loco men soon got their own back. 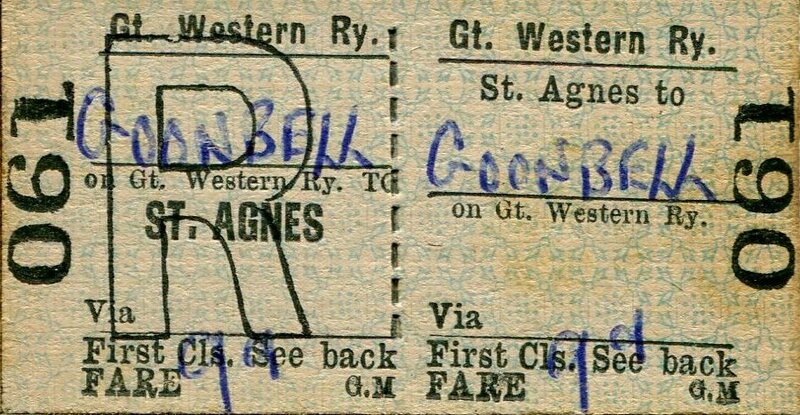 On the return working as they approached St. Agnes they warmed up the train staff in the firebox before innocently handing it back. 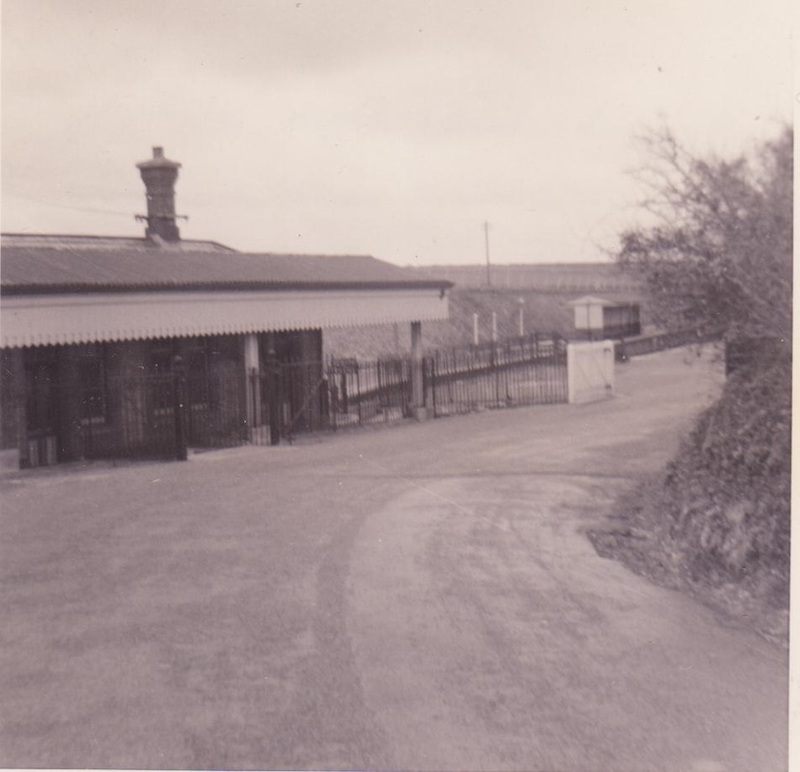 Henry Morgan, who contributed so much to the history of the branch, was the stationmaster at Perranporth. He was also responsible for Shepherds and St. Agnes and was well known for enjoying a tasty snack. 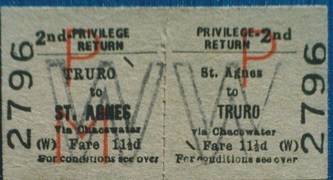 Whenever he visited St. Agnes staff were aware that the odd sweet would disappear from the drawer in the booking office. One week we placed some tempting chocolate squares in the drawer which duly disappeared following Henry's routine inspection. Unknown to Henry the chocolate contained a well known brand of laxative.! 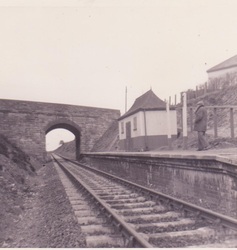 An unusual feature at St. Agnes, possibly due to the installation of a passing point there mid term in the life of the branch, was the provision of catch points at each end of the loop. 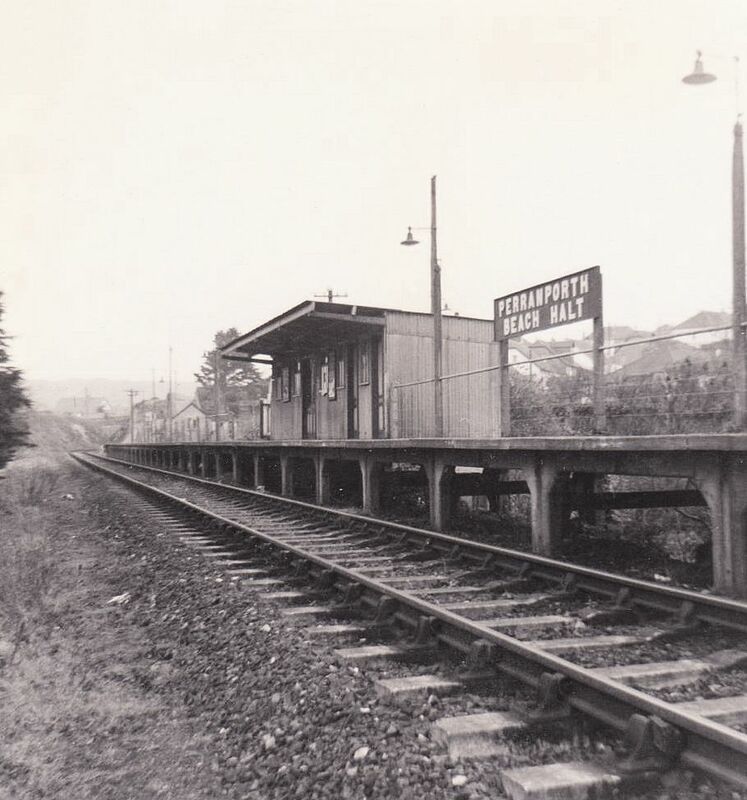 This enabled home signals in both directions to be pulled off to permit trains to enter the station simultaneously. In all other crossing stations I've worked one train had to come to a stand at the platform before a train from the opposite direction could be admitted. I was told that there was another location on the Western Region where a similar arrangement applied but never investigated further. One day a Newquay bound train was ready to leave the station. The driver saw the guard's green flag but failed to check the signal with the result that loco 5562 was derailed on the catch point. 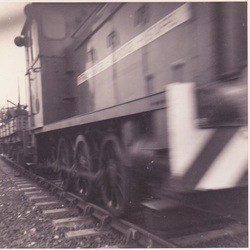 The breakdown train attended and the loco was rescued by a 63xx mogul. I believe some buses maintained a service that day-something almost unheard of at that time! As well documented elsewhere the branch closed on 04-02-63 after a life of only 60 years. 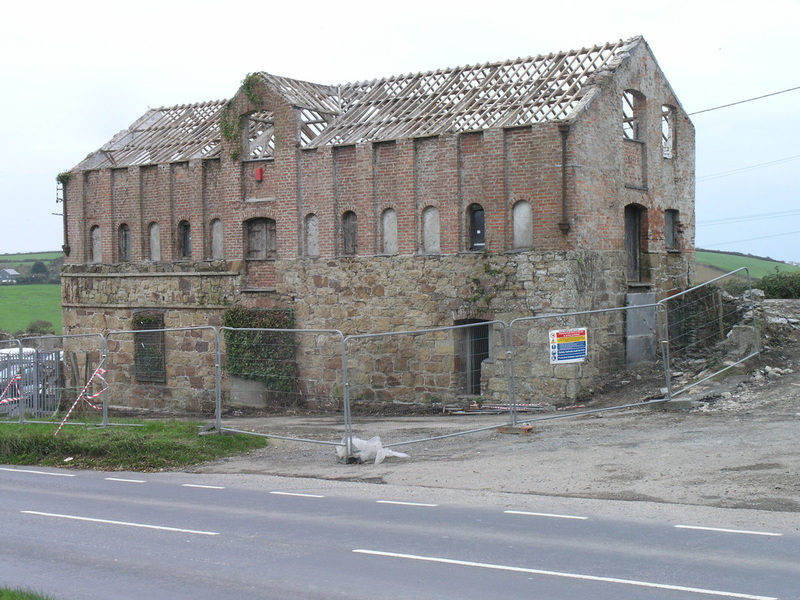 St. Agnes station building survives in commercial use. 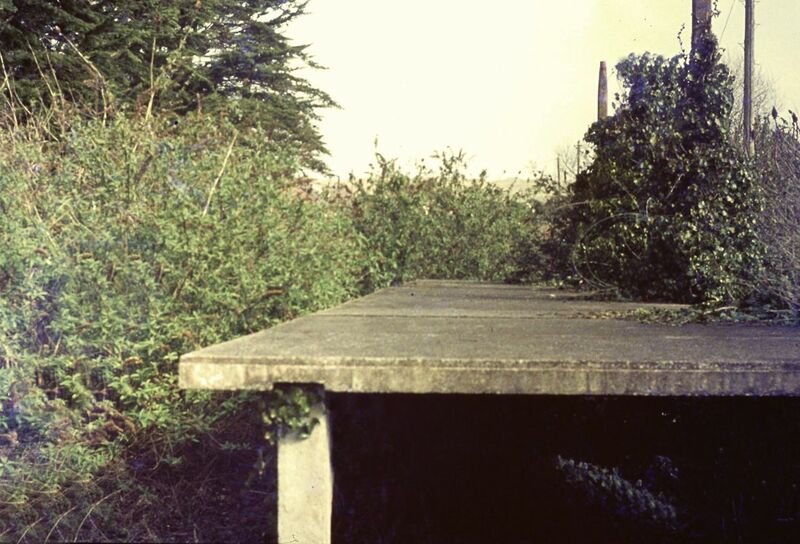 And now for a treat - Laurence Hansford found his camera not up to Life Saving Demonstrations at the local beach and returned to capture these sad but never to be forgotten scenes. The view from the narrow road bridge across the line at the north end of the station. Note the otherwise empty track bed with track panels stacked beyond the signal box. In the yard lie the tools of destruction, the cranes etc. In the foreground stands one solitary signal. 23rd August 1964 Copyright Laurence Hansford. Walking through the station heading southwards we note most of the buildings are still intact though the signalbox is just a shell. 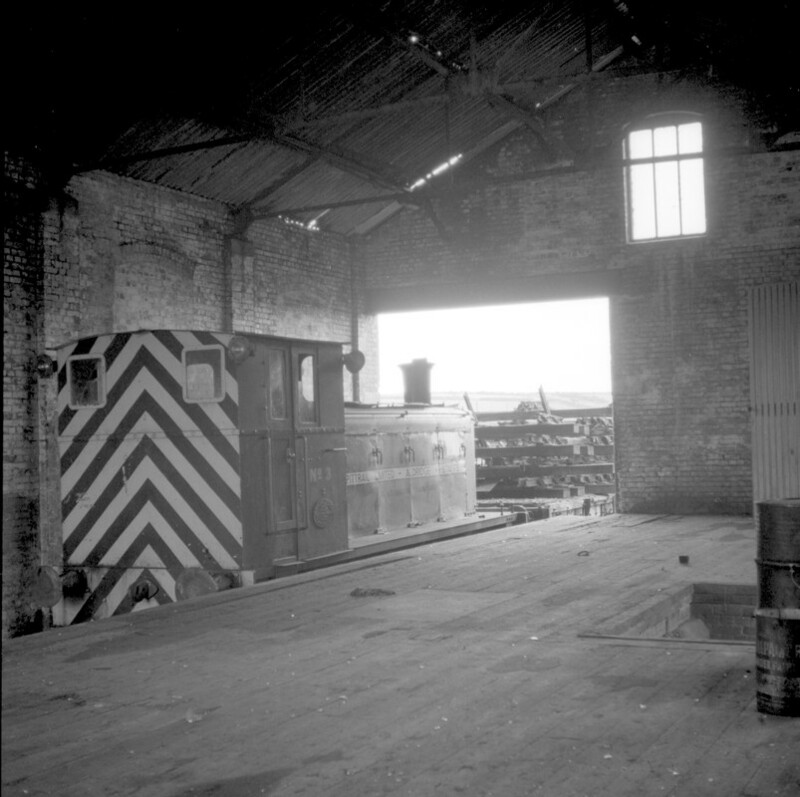 In the goods shed the contractors shunter enjoys some shelter - it work is done. To our right lies the cattle dock which also held the camping coach for some summers. 23rd August 1964. Copyright Laurence Hansford. 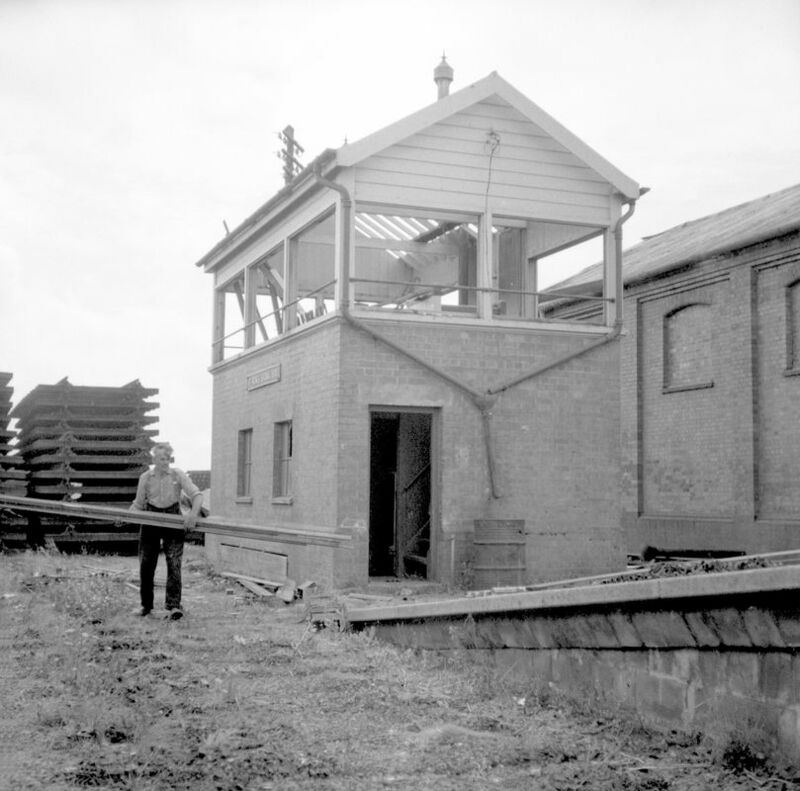 The signalbox is under attack. Slates have gone from the roof and a gentleman is making off with some useful looking timber. 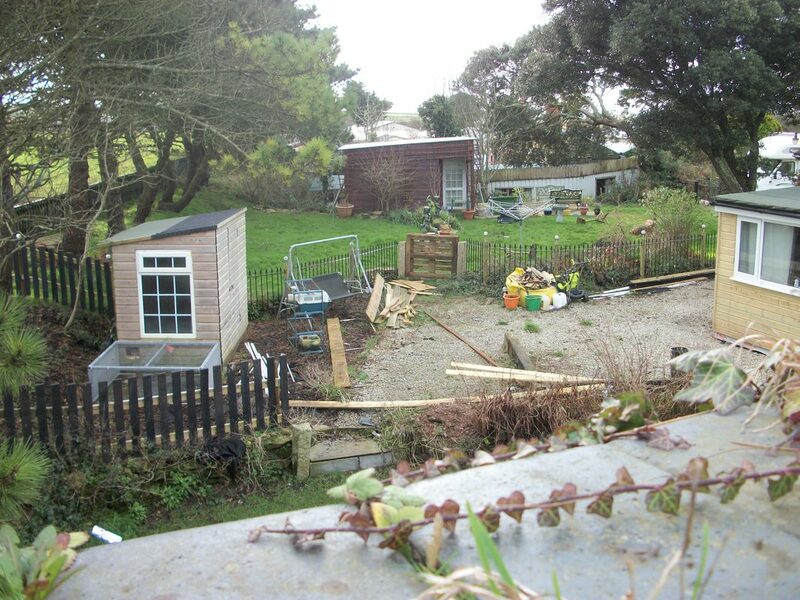 It is the weekend and so Laurence speculates that with the contractors away this gentleman may be doing a little tidying up for his own benefit! 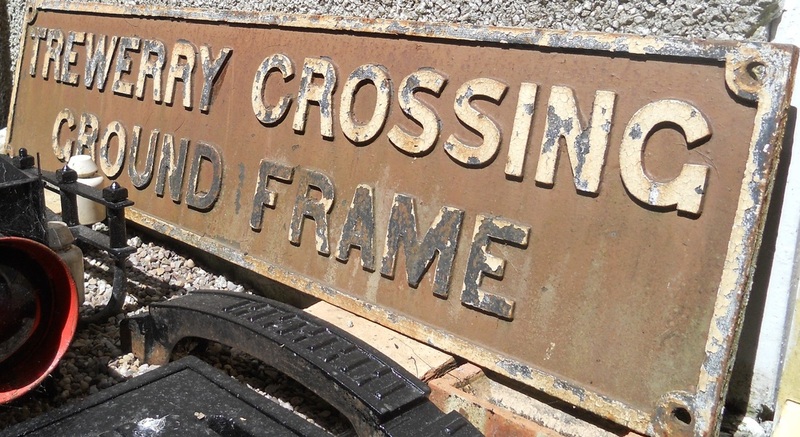 The signalbox nameboards have thankfully survived. 23rd August 1964. Copyright Laurence Hansford. 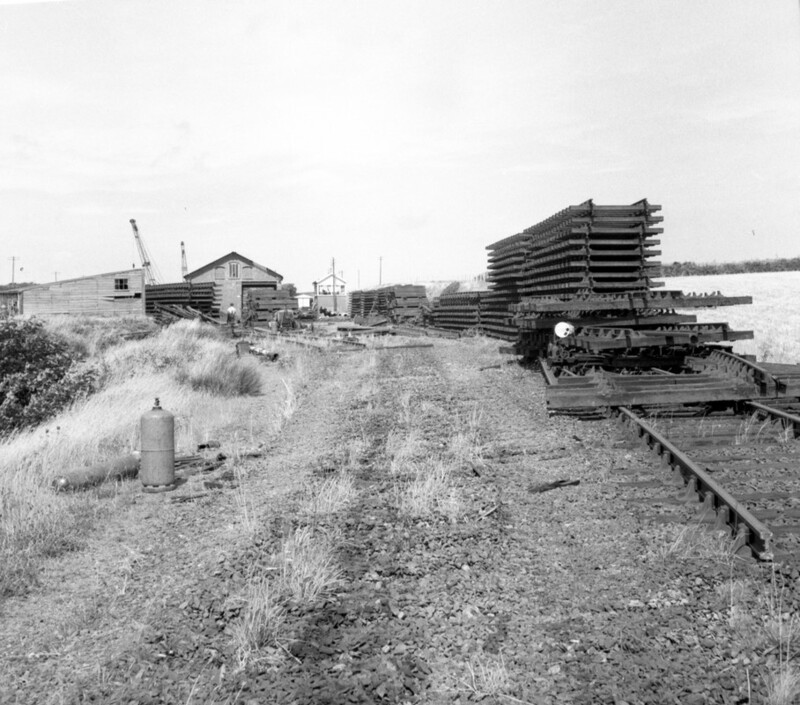 Looking towards the south and the bridge over the B3277 piles of track await collection. 23rd August 1964 Copyright Laurence Hansford. 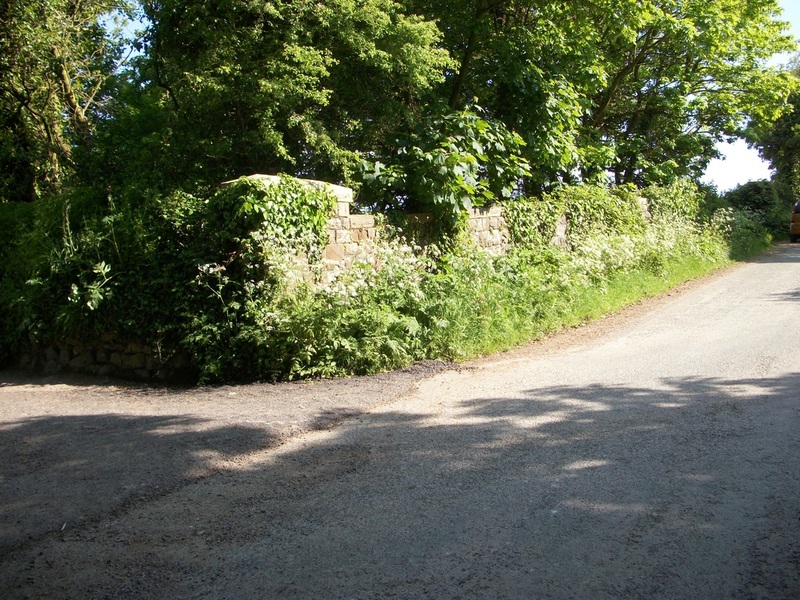 The bridge over the B3277. 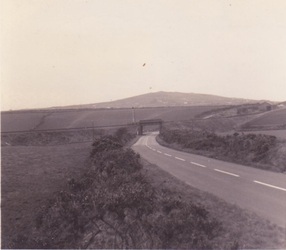 The road on the right hand side goes to Mount Hawke with a cross roads serving the coastal route to Porthtowan to the right. Just above the safety barrier on the right hand girder can be seen a slight dip in the horizon - this is where a cutting took the line through the hill towards Mount Hawke.. Note all the track has been recoverd back to here which suggests that the operation from Blackwater Junction was of removal back towards St Agnes station where we find the shunter has been stabled. 23rd August 1964. Copyright Laurence Hansford. Track pilled high with a little left for lifting. Part of a ground disc is trapped in the wreckage. 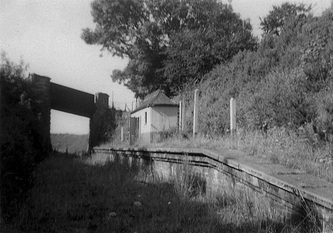 The signalbox overlooks the sad scene. 23rd August 1964. Copyright Laurence Hansford. The windowless signalbox still has its telephone pole but no wires. 23rd August 1964. Copyright Laurence Hansford. The shed the contractors shunter rests - its work done. 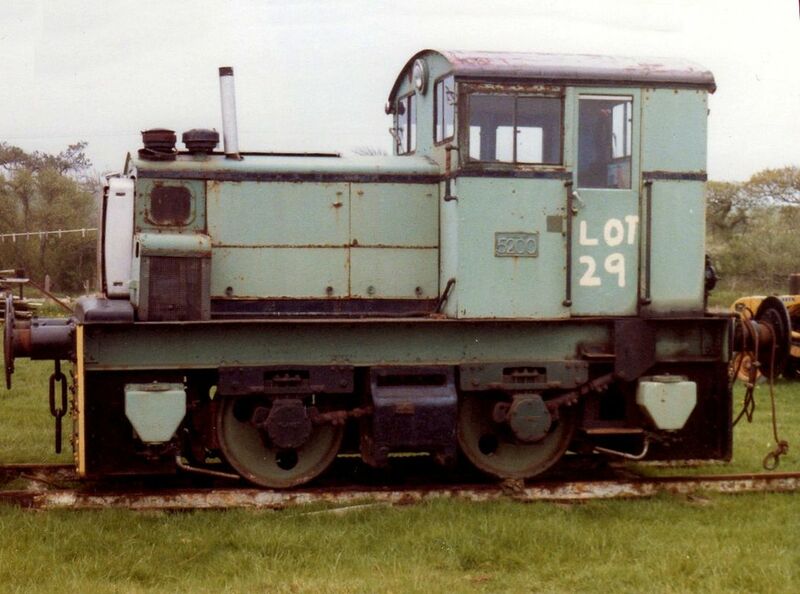 Diesel Loco No 3 owned by Pittrail Ltd Aldridge Staffs 23rd August 1964. Copyright Laurence Hansford. One wonders if this gentleman was doing official work on a Sunday. 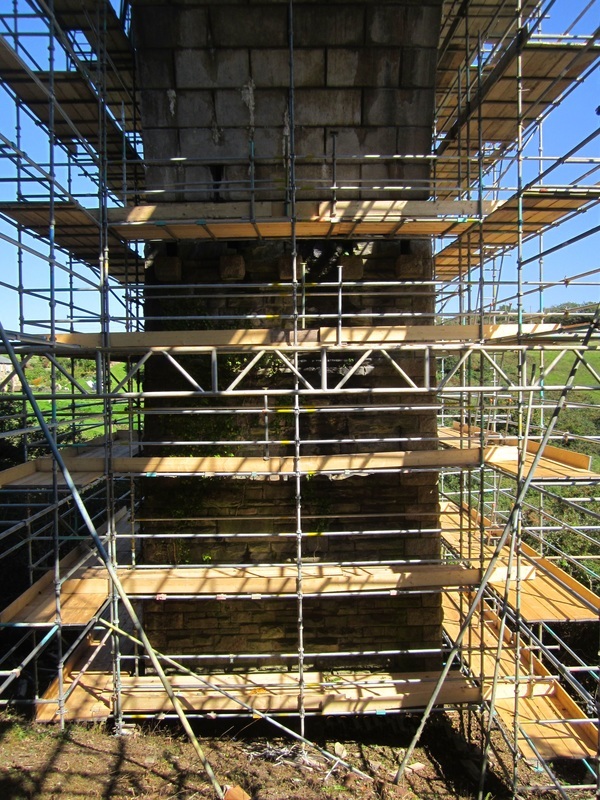 No scaffold, no ladder, no helmet. 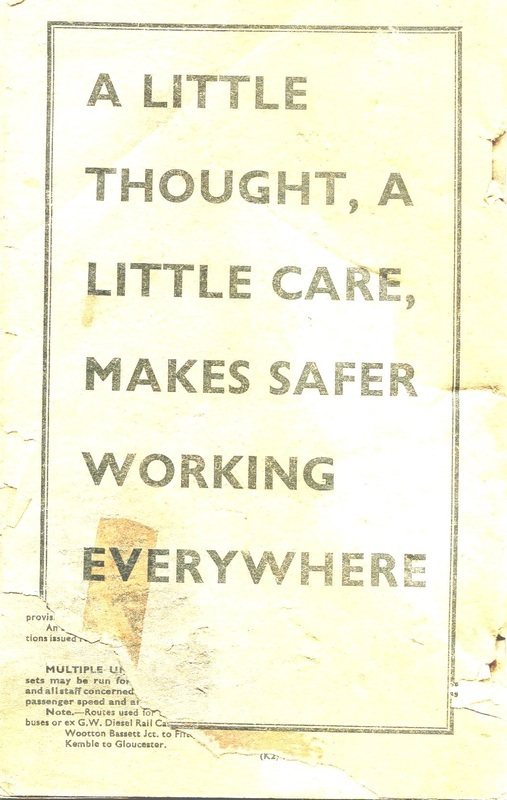 What would the H & S E think of this these days? 23rd August 1964. Copyright Laurence Hansford. 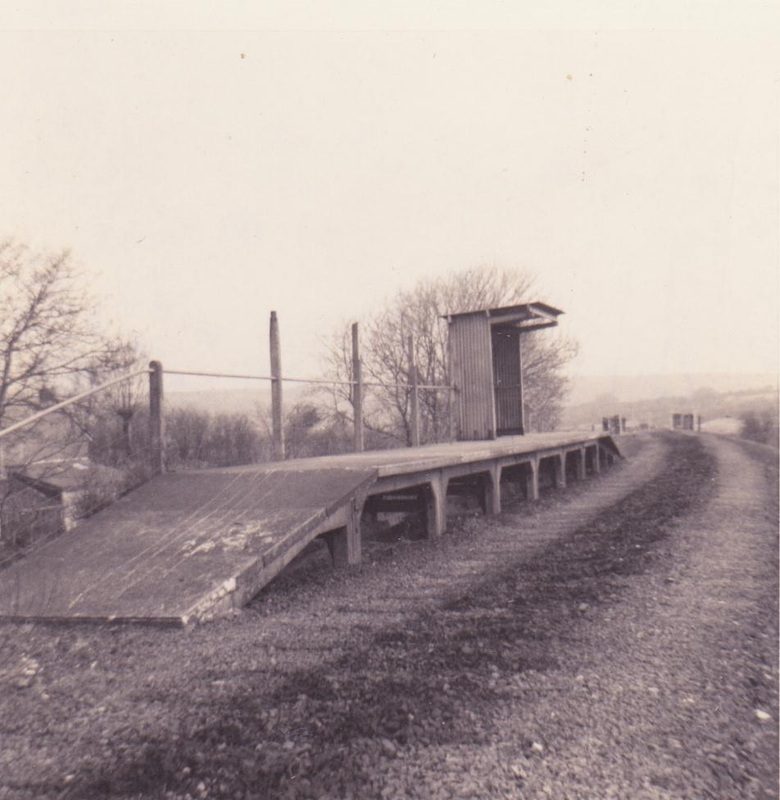 two and three quarter miles to Chacewater but never again will passengers use this platform for Mount Hawke, Chacewater or Truro. Beyond the bridge the route heads to Newquay. 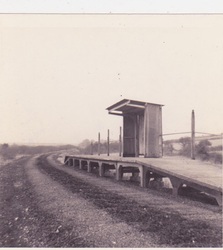 The platform shelter stands ready for use. Over the fence to the right during WW2 an American tented camp lay. 23rd August 1964. Copyright Laurence Hansford. 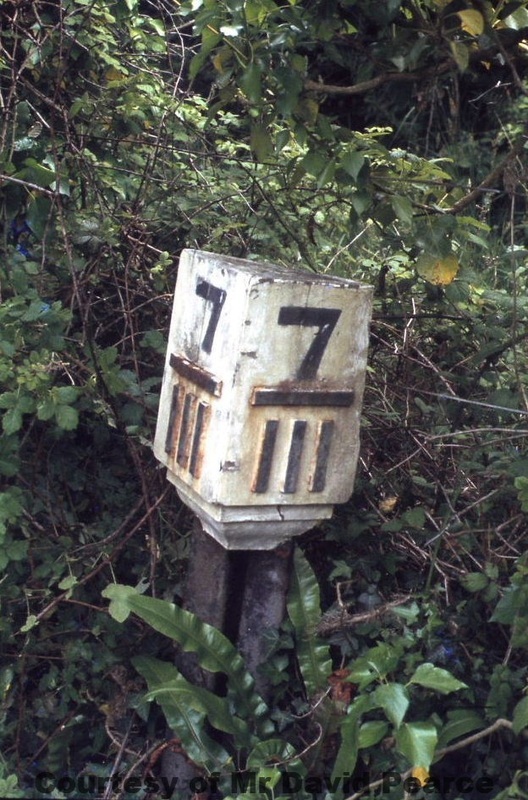 For some strange reason this signal was the last to be felled. A shame it was though I believe if it were still there it would be in a' bedroom'. 23rd August 1964. Copyright Laurence Hansford. N.B. 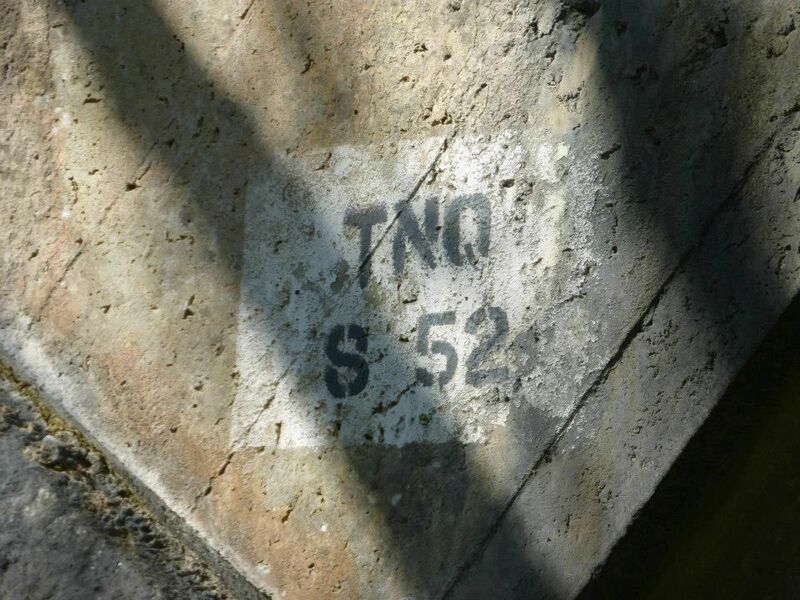 This is the signal which 5562 passed at danger. 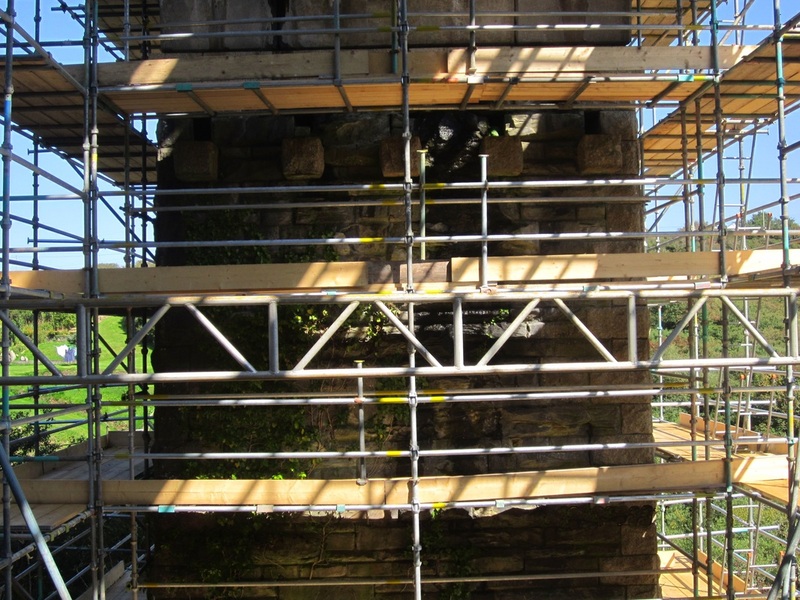 damage to the station wall has only recently been covered. Any old iron - a pile of old chairs. St Agnes station. 23rd August 1964. Copyright Laurence Hansford. A very sincere thanks to Laurence Hansford for allowing us to see and use his invaluable collection. Now everything has gone and we return to the trackless station. The view looking south from the road overbridge. Mileage position of the bridge. 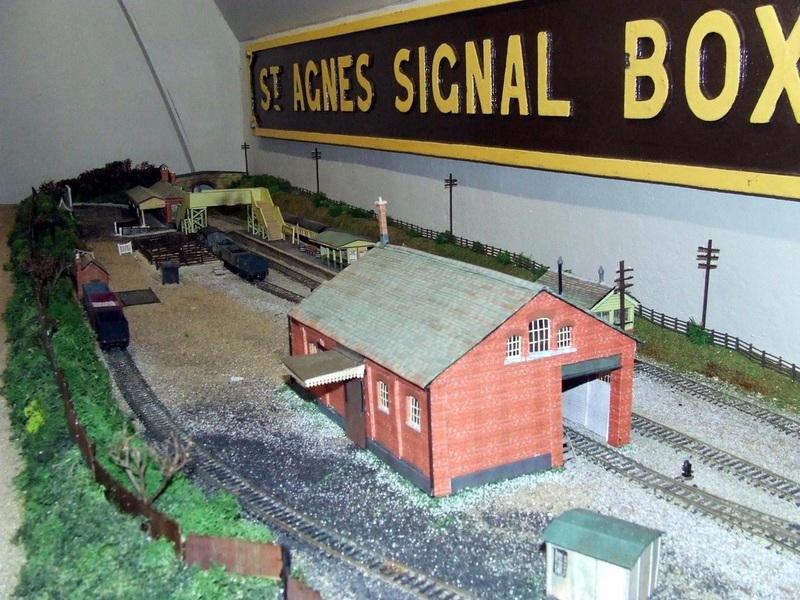 In 205 St Agnes Museum introduced a new railway display. At its centre is a 00-gauge model of St Agnes Station in the 1950s, built by Mike Hockley of Falmouth, and perfect in every detail. 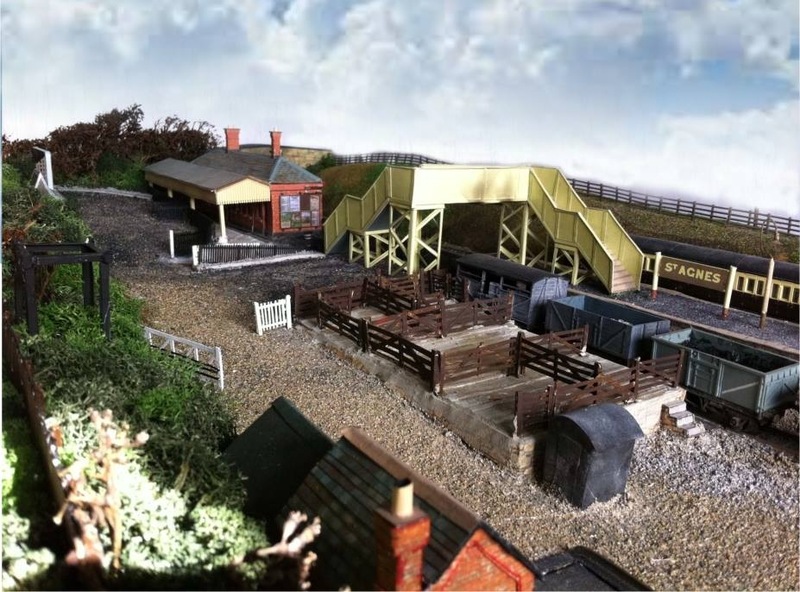 It includes the main building, with its Waiting Room and Station-master's office, footbridge, animal pens, cycle shelter and signalbox. The display is complemented by a 20 minute film of the branchline in the last days of its life. Above the model is the 6' long cast-iron sign from St Agnes signalbox bought at auction in 2014. The Museum is open daily from 10.30 to 5.00, and admission is free. We hope you will enjoy our exhibition. Liz Thompson. If you are down on holiday or just local this display is well worth a visit - parking nearby, or use Hopleys 315 bus from Redruth station, they will drop you at the Museum. 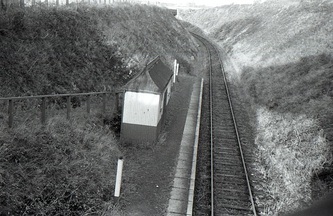 The Halt from another angle on the 2nd February 1972 . Copyright Roger Winnen. It is believed that the pagoda was buried under the infill. Goonbell through the arch of the long buried bidge. The scene captured by Roger Winnen almost nine years after closure 2nd February 1973, Copyright. ​This picture has been obtained from Facebook although it is now understood to have been from an original photograph by Peter Gray. 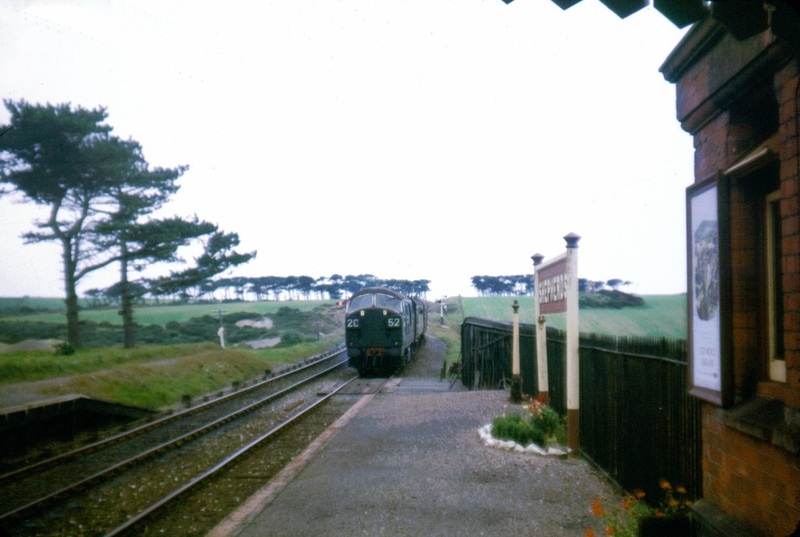 At first glance there’s nothing unusual about the locomotive - but I recently found a colour photo of it at Newquay taken later the same month revealing that under the typical early 1960s layer of grime 9635 was still in GWR green livery complete with large “G W R” initials on the tank sides! 9635 entered traffic in January 1946 and spent most of its life at Tyseley – I can’t find when it arrived in Cornwall, presumably allocated to Truro, but I don’t think it stayed for long. It departed for Exeter in March 1962 and a year later was photographed outside Swindon Works sporting its first repaint in 17 years. 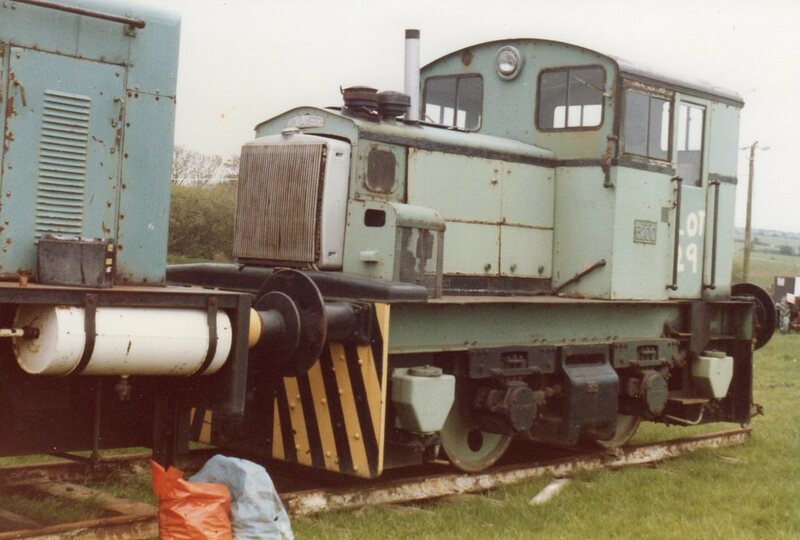 Perhaps not surprisingly by 1963 this appeared to be a quick cosmetic job only (the running gear looked untouched) and the outline of a ‘G’ was still clearly visible on the side tank alongside the BR emblem. The shiny paintwork – which the b&w photo suggests may unusually have been green rather than standard 57xx black – didn’t save it from withdrawal from Taunton shed just 15 months later, in June 1964. However its short stay in Cornwall must surely have been the last time the famous initials were (just about) visible on an engine in normal service there, unless anybody knows otherwise. Many thanks to Neil Phillips for assembling these fact about 9635 – it is a great pity that the locomotive is no longer around – however if you have the 00 model by Bachmann you can authentically run it on your Chacewater – Newquay model system. 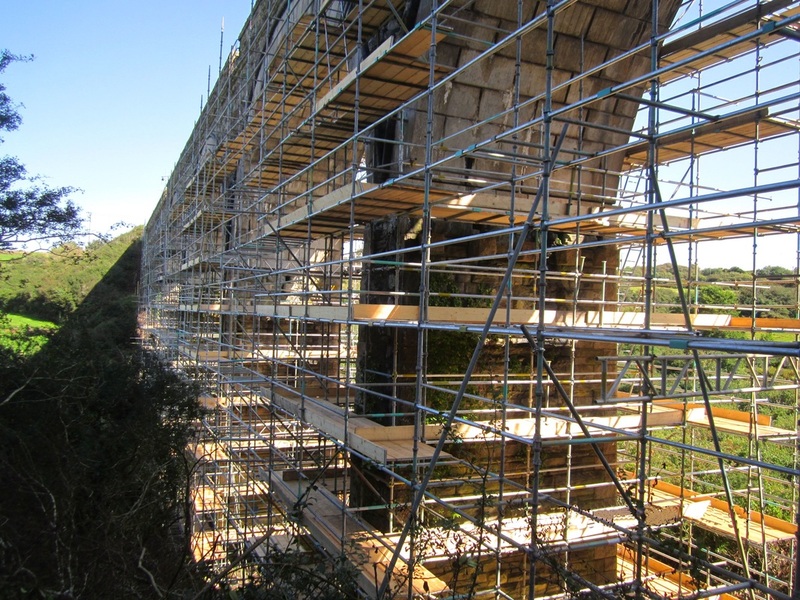 The approach to Wheal Liberty viaduct maintenance work. Copyright Mr Ed. Hooper. 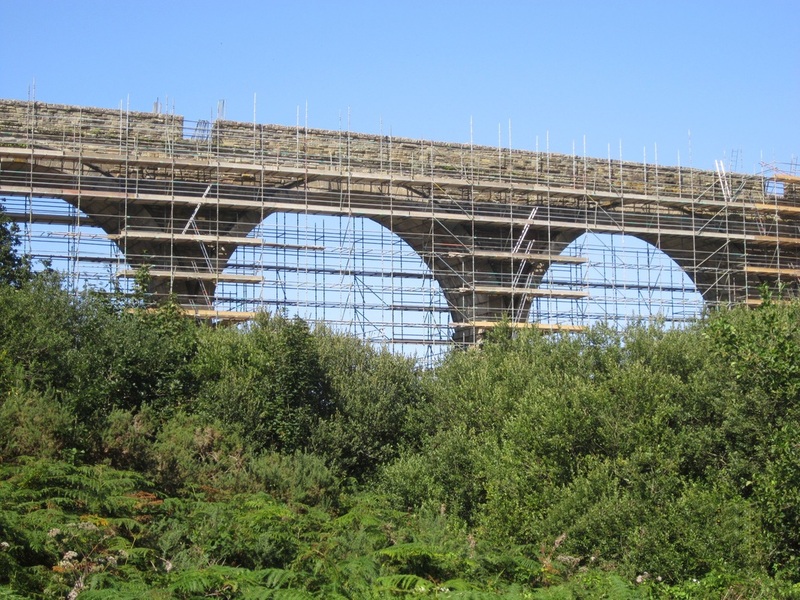 Wheal Liberty Viaduct caught in intermittent sun on the 12th march 2017 Copyright Ian Harvey. A view looking from a road over rail bridge about 135 yards beyond the east end of the viaduct . 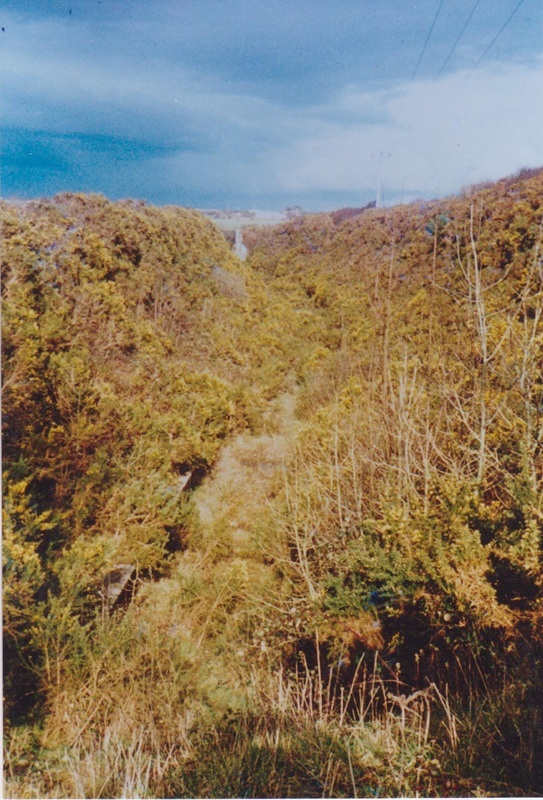 The line continued in a more or less straight line but bearing slightly right to enter a cutting in which Goonbell Halt was situated about 1,400 yards distant. 12th March 2017 Copyright Ian Harvey. 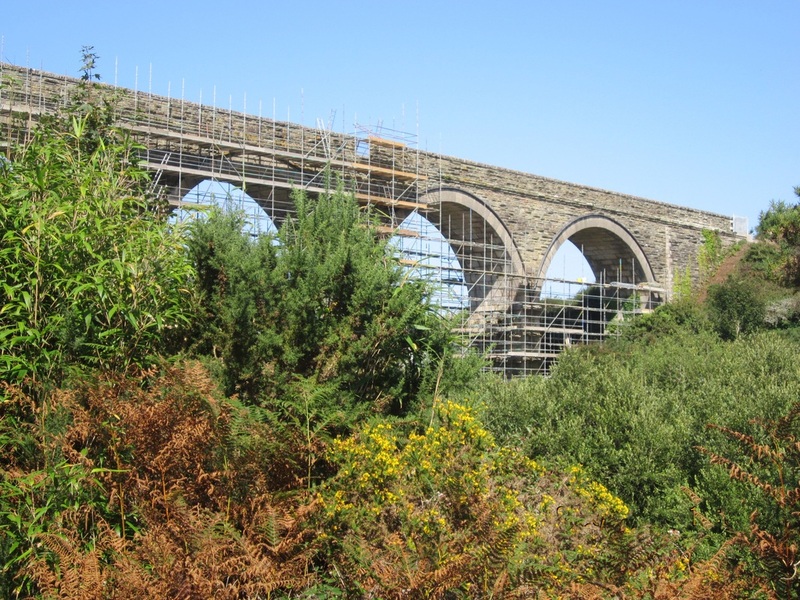 Note the viaduct has been securely fenced off - what a shame, it could have been incorporated into a cycleway had some forward thinking taken place before the route was sold off piecemeal. 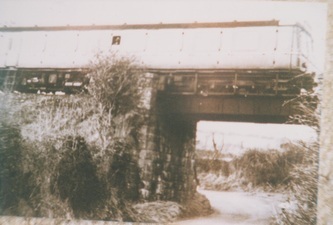 A side view of the bridge. 12th March 2017 Copyright Ian Harvey. 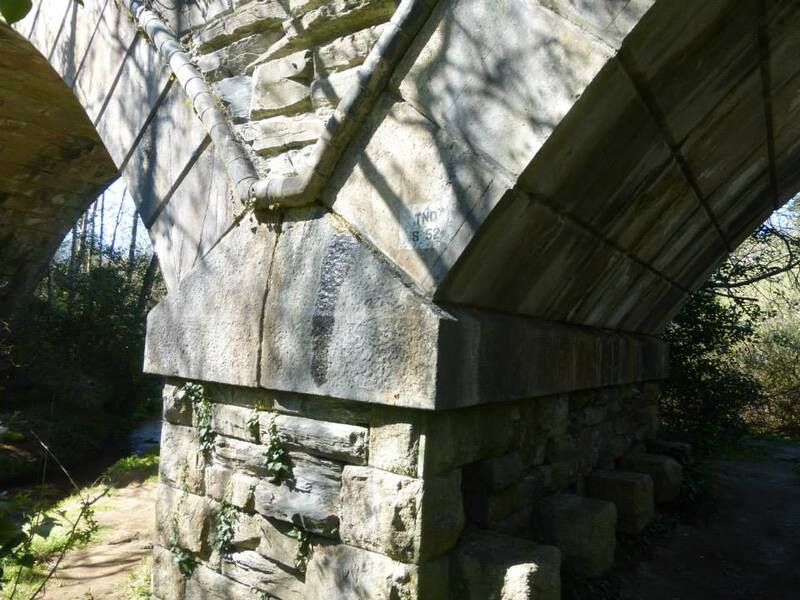 A close look at the portal of the bridge. 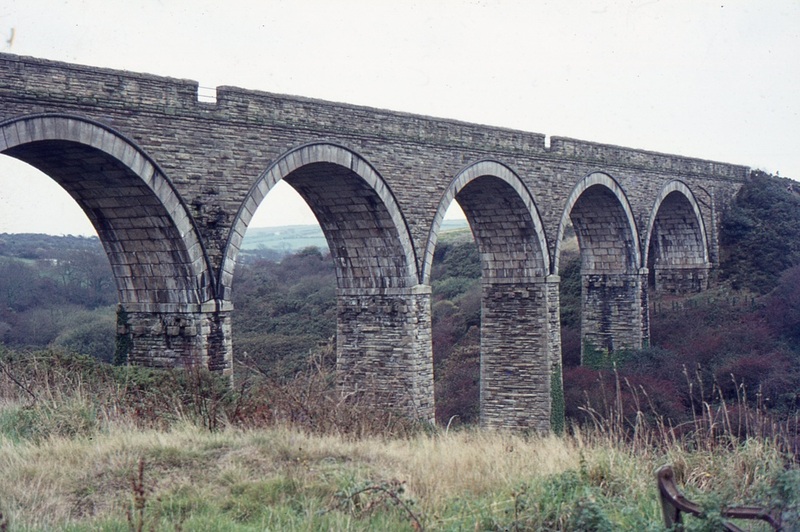 It looks as if over 50 years of Cornish weather has removed all the smoke stains. 12th March 2017 Copyright Ian Harvey. Ten years after closure Roger Winnen takes a look around. 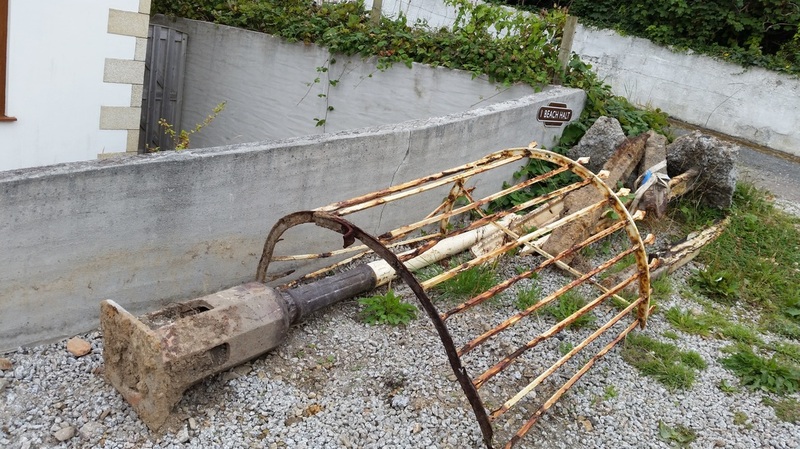 Remains of kissing gate and lamp from Perranporth Beach Halt. 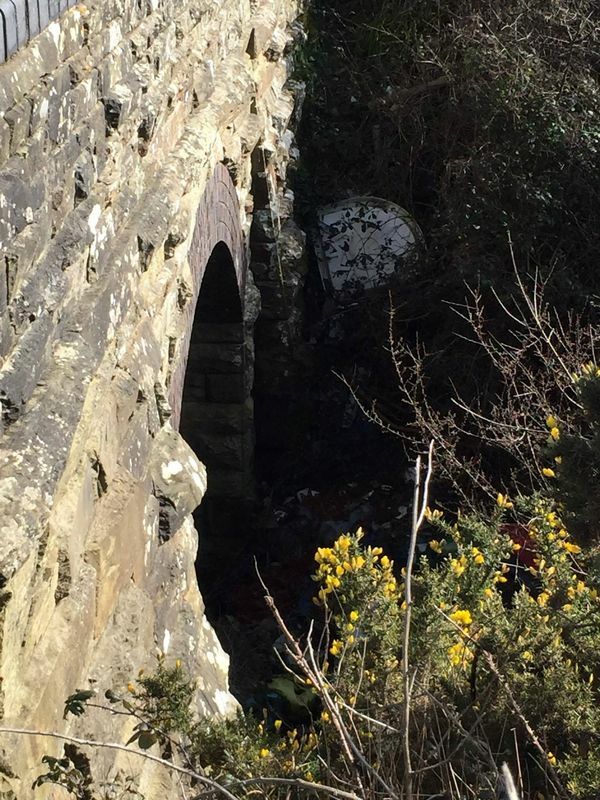 Also note a section of bridge rail - probably a fence or notice post. 26th July 2016 Copyright Dennis Berry N.B. They really need a padlock and chain for security. 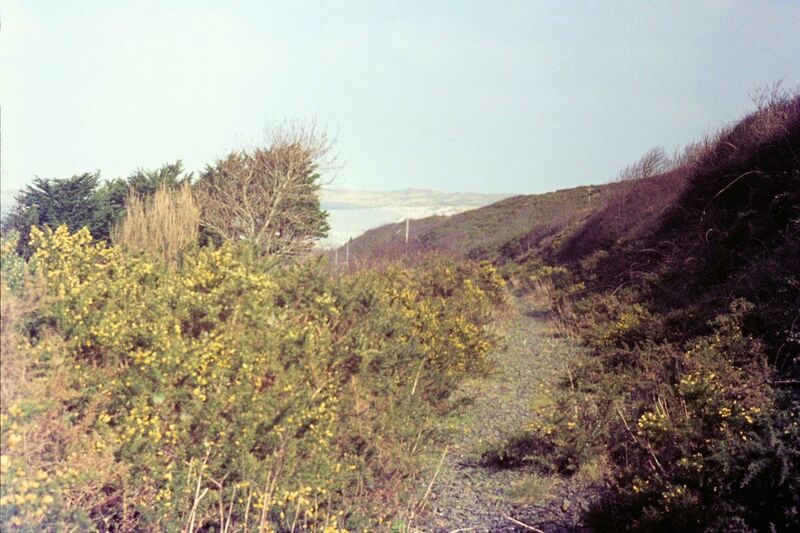 The Chacewater to Newquay line was always referred to by railway staff as the Perranporth branch. 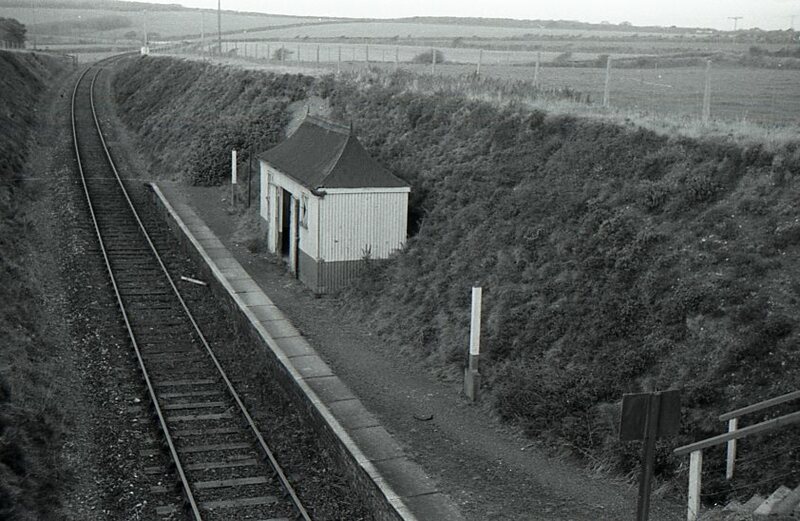 This distinguished it from the Par line (always ‘the Newquay branch’) , but also highlighted the main source of traffic on the line –the resort of Perranporth. 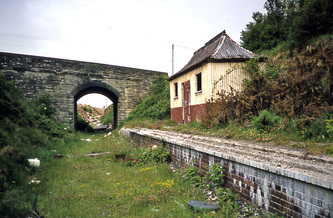 As is well known, the line opened in 1903 from Blackwater Junction to Perranporth. 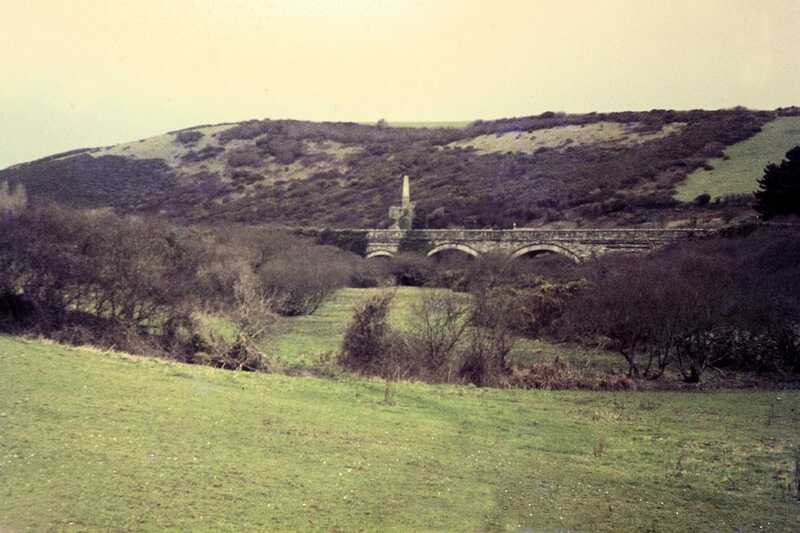 The onward section to Newquay fell into two parts: new construction through Goonhavern to Shepherds and the upgrading of the existing mineral line from Shepherds to Tolcarn. 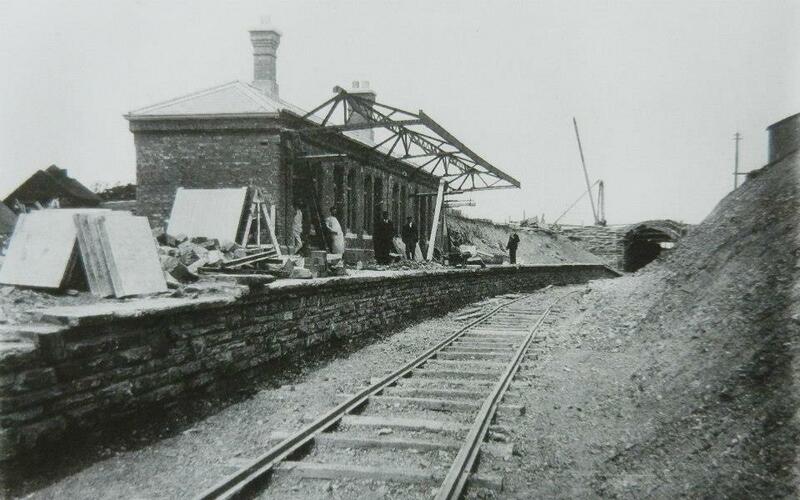 Newquay station was also being rebuilt and expanded to cater for the new traffic. 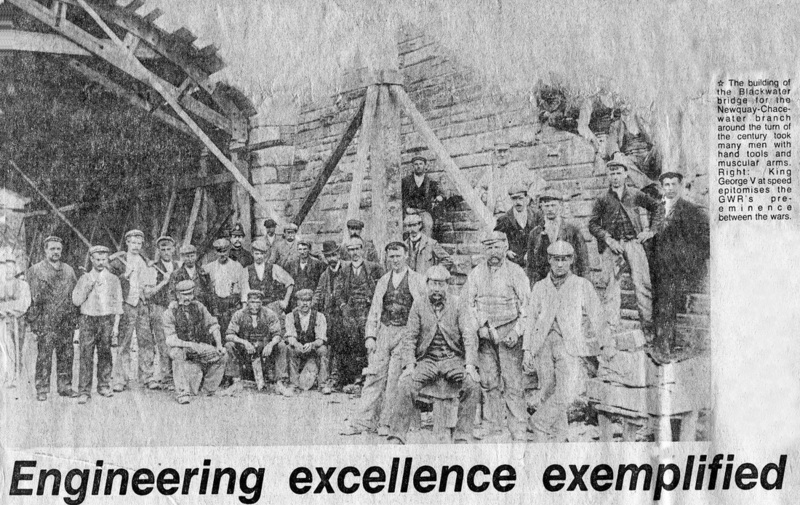 Perranporth to Shepherds proved a difficult task: mining subsidence delayed the work and completion was not until January 1905. 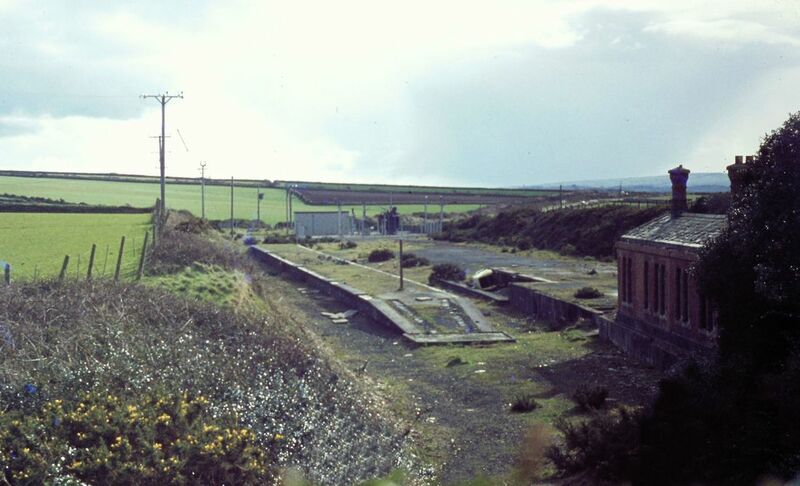 Perranporth station was a substantial island platform, constructed of timber baulks, with subway access to the approach road. There was a loop siding and a dead-end road in the yard. 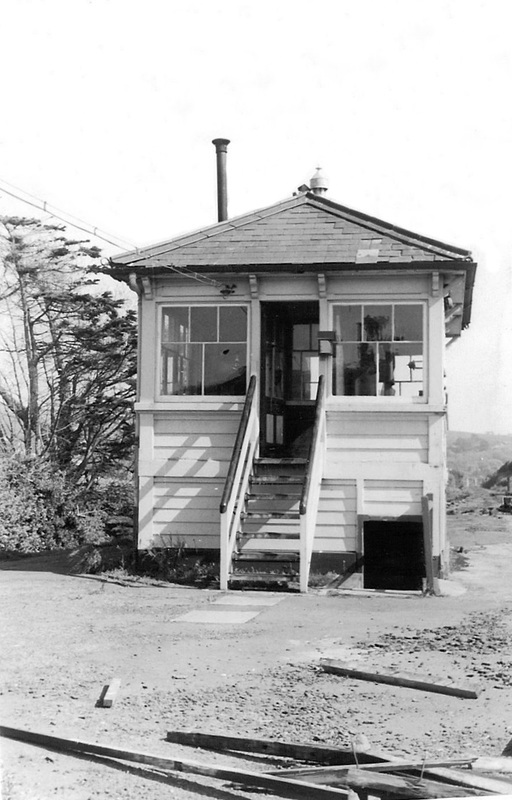 The signal box was of timber construction: it was intended for Yate, near Bristol, but changed to Perranporth. 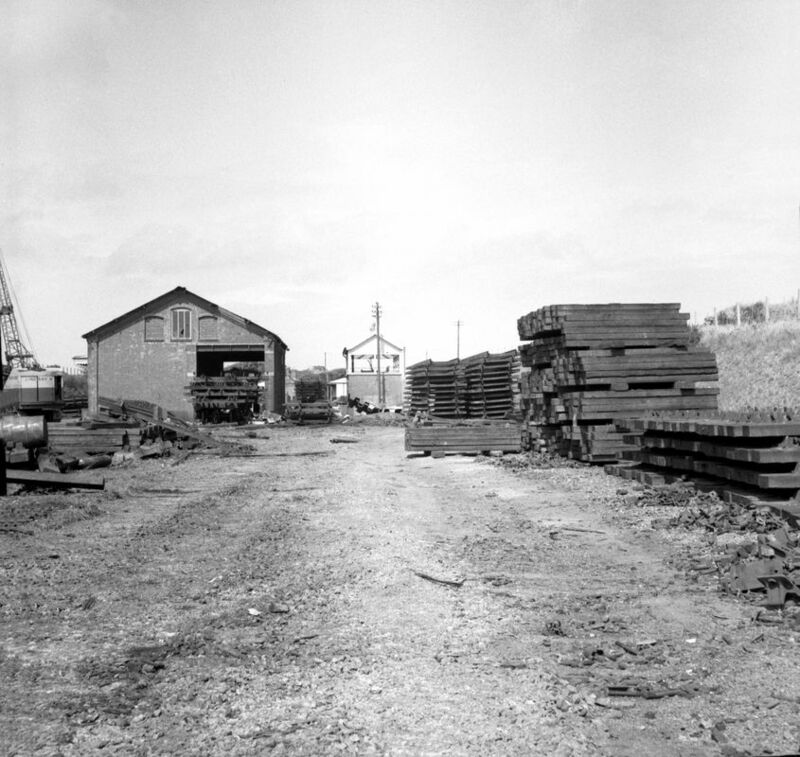 These wooden boxes were prefabricated and simply bolted together on site. 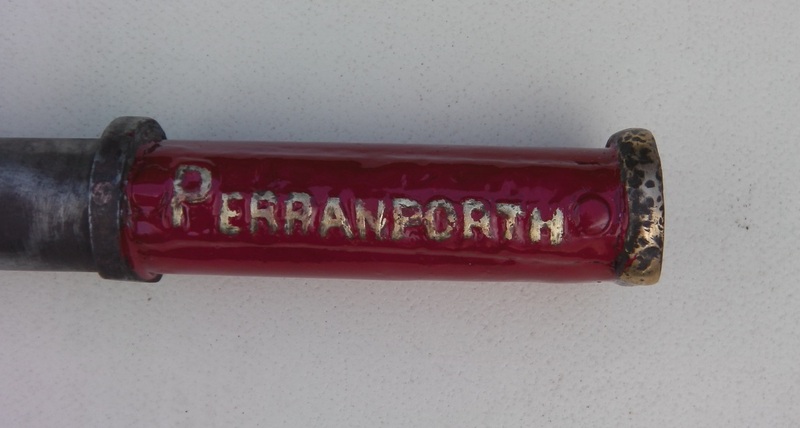 Perranporth box had a 23-lever frame, working distant, home, starting and advanced starting signals in either direction. Distants carried red arms and lights in those days and the lever in the box was painted green. In common with most other parts of the GW system, the distants ceased to be worked and became ‘fixed’ around 1912. 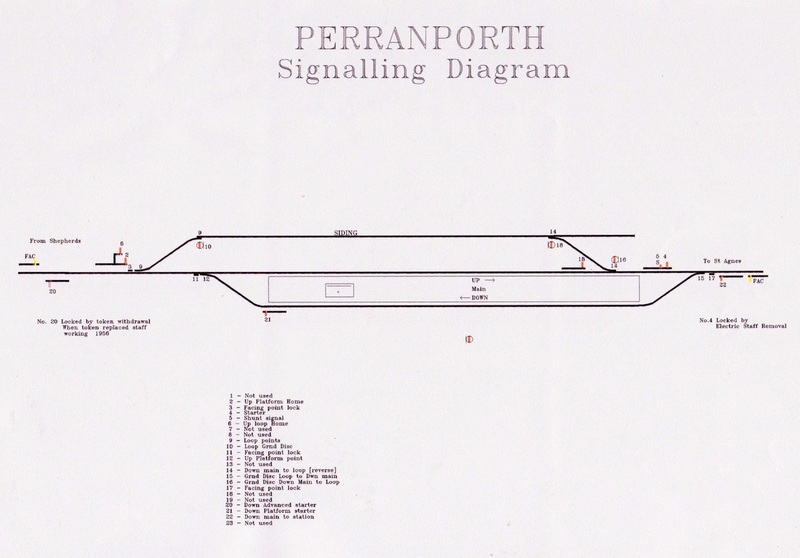 Other than the distants, nothing changed in the layout at Perranporth until the end. 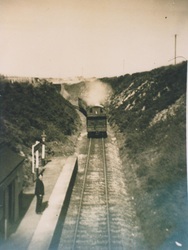 Railmotors provided the service until about 1920, when loco-hauled trains became the norm. 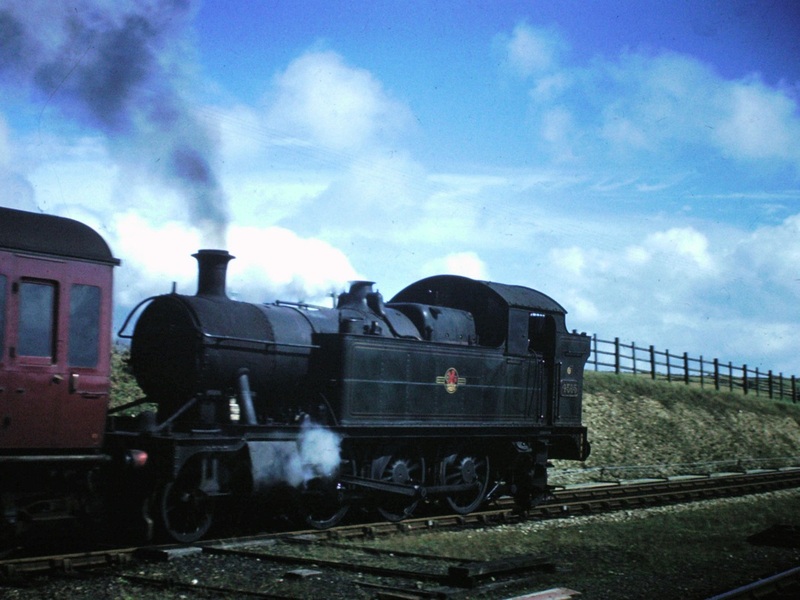 The regular motive power was ‘Metro’ class 2-4-0s based at Truro and at Newquay. These survived until the mid-1930s, when the usual 4500/4575 class small prairies took over. 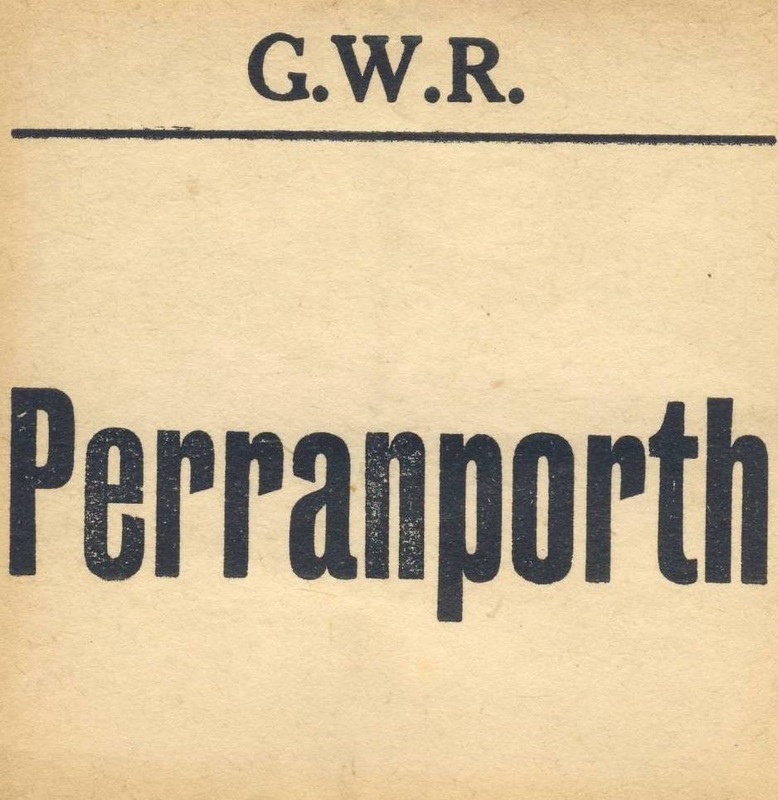 In postwar years Perranporth had a weekly Saturday through train to Paddington. The stock was worked to Newquay on Fridays (via Par) and two 55XX prairies ran through from Truro to collect it on Saturday mornings. 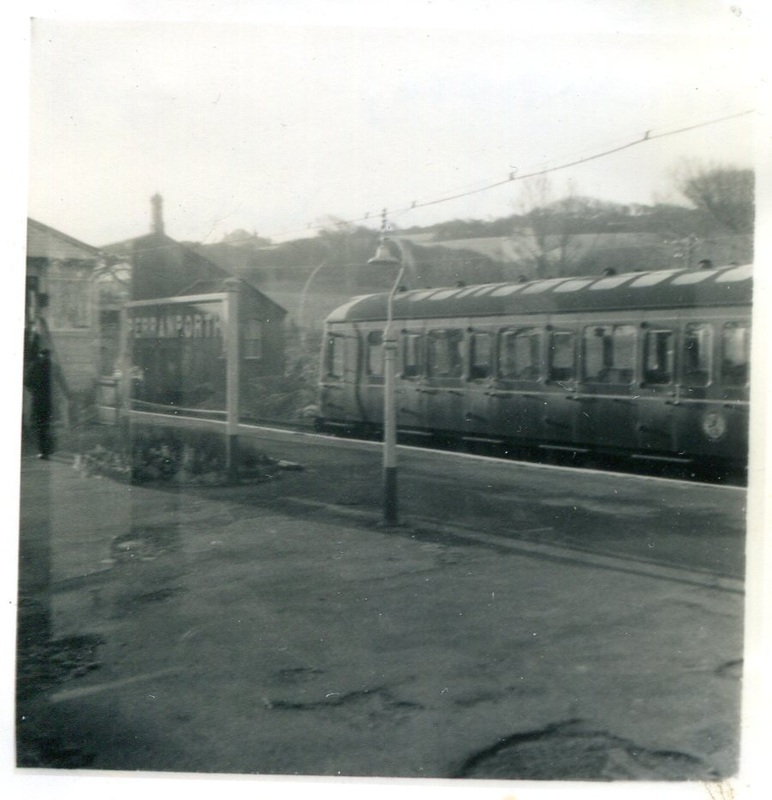 Leaving Perranporth at 0815 (in 1959) the train called at St Agnes (0828) and on to Truro, where the prairies would come off and a pair of 4-6-0s, usually a Grange and a Manor, would take the train on to Plymouth, where a ‘King’ came on. Arrival at Paddington was scheduled for 1555. 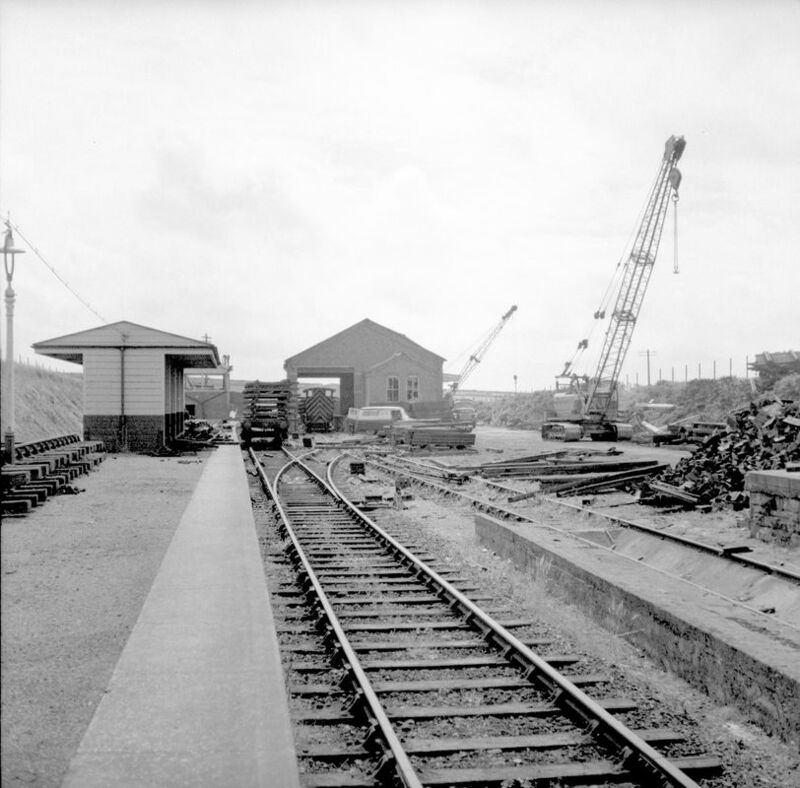 On July 9th, 1960, 5537 and 5562 of Truro shed hauled the ‘Perranporth’ to Truro, where 6805 ‘Broughton Grange’ and 7813 Freshford Manor’ took over. At Plymouth 6016 ‘King Edward V’ came on . (information from Woodley. R., The Day of the Holiday Express., Ian Allan 1996). 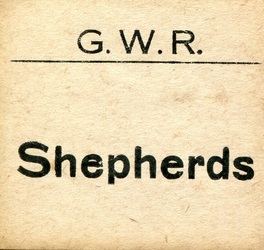 In postwar years the Perranporth stationmaster (latterly the redoubtable Henry Morgan) was also responsible for Shepherds, in addition to the local halts. Perranporth station and box were opened in 1903and served as the terminus for a time until the completion of the line through to Newquay in 1905. The box itself was situated adjacent to a water column at the Newquay end of the commodious island platform which was accessed via a subway. Unusually it was built of wood with steps on the outside. If memory serves me correctly it had a 25 lever frame with 20 in use-10 for signals, 3 for discs, 4 for points and 3 for facing point locks. 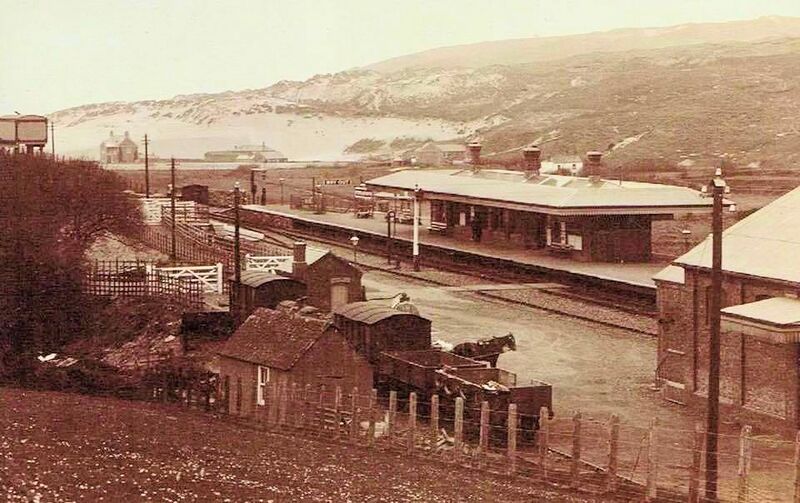 Most branch passenger trains crossed at Perranporth and the goods shunted coal wagons and miscellaneous vans into and out of the yard. 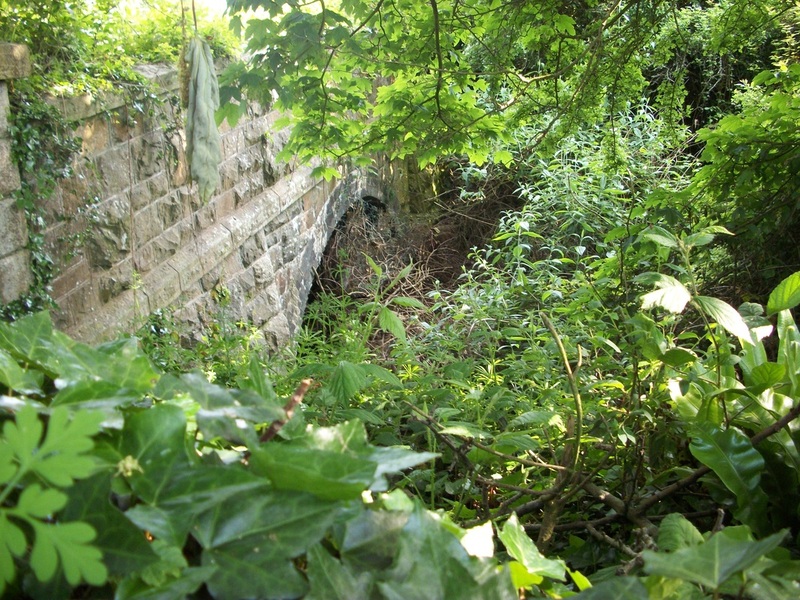 Under a section of track in one of the sidings was a concrete trough for use when cattle wagons were being cleaned out. 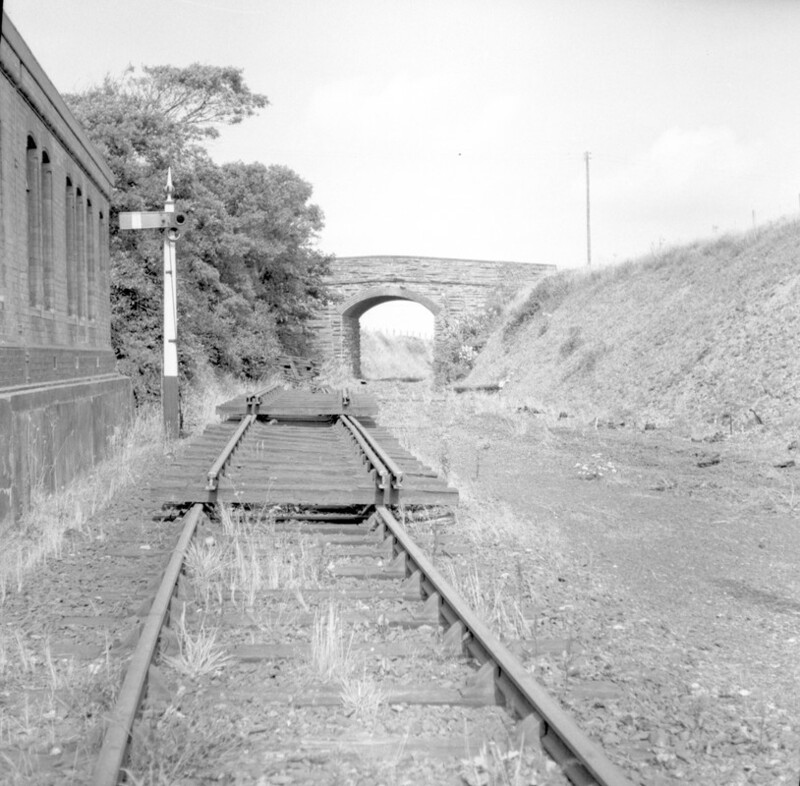 There was a boarded crossing over the platform line near the goods shed which enabled lorries to reverse up to the island platform to deliver and collect milk churns and other bulky items. 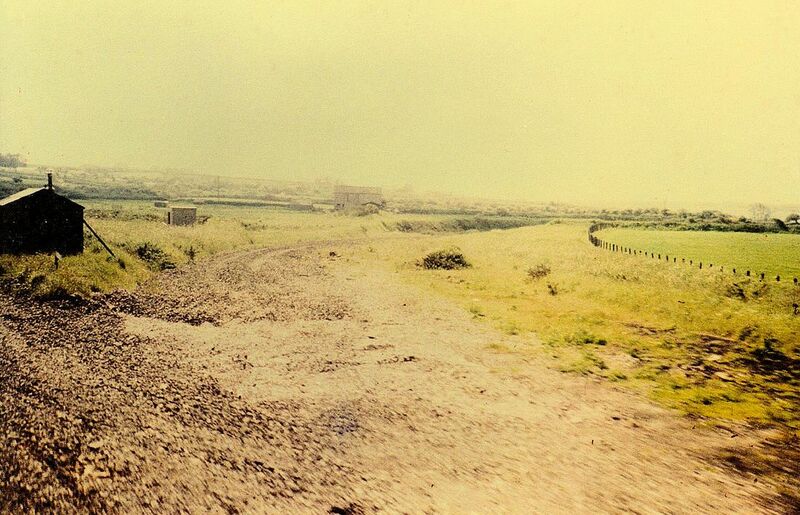 Variety came on summer Saturdays in the shape of the through Perranporth-Paddington train. the long train of chocolate and cream coaches was stabled at Truro and would come out headed by two 45xx locos which ran round and left for Padd. at 8.15am, picking up at Beach Halt (unadvertised) and St. Agnes before changing engines at Truro for the main line run to London where arrival was at 3.55pm.. 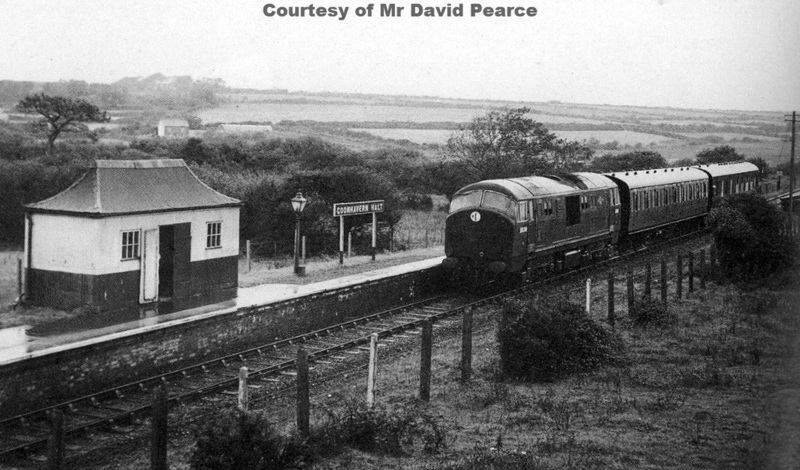 The down working left Paddington at 8.25am and was combined with a Penzance portion which split at Truro at 3.45pm. One 45xx loco was sufficient for the Perranporth portion which called at Chacewater at 3.55pm, St. Agnes at 4.05pm and arrived at Perranporth at 4.20pm. 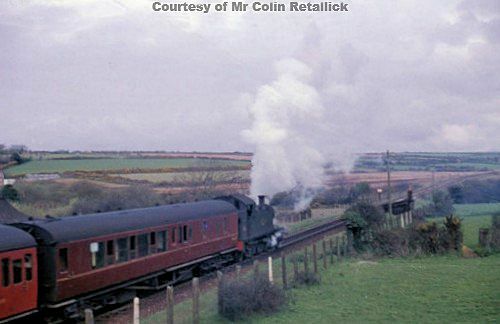 I also recall that some trains from Newquay reversed at Truro and ran through to Falmouth. 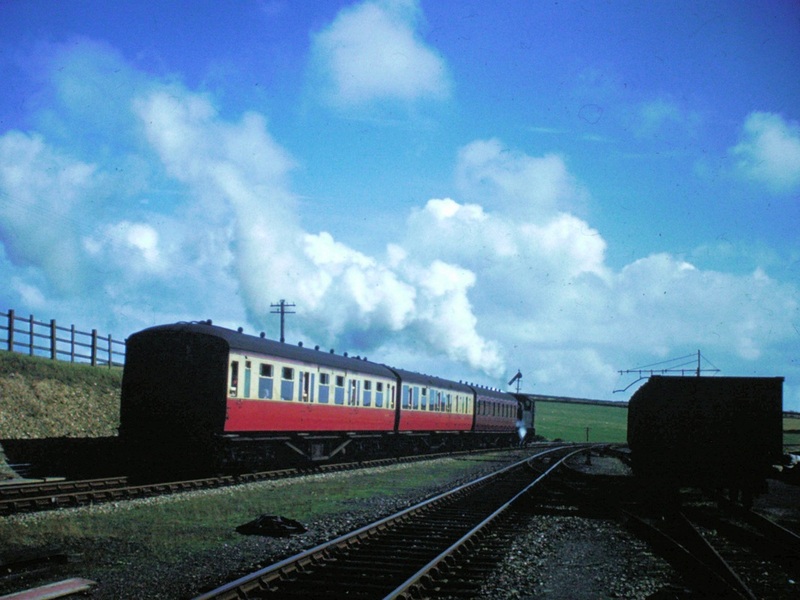 The return fare from Newquay to Falmouth in the late 1950s was 4s 6d (22 1/2p). 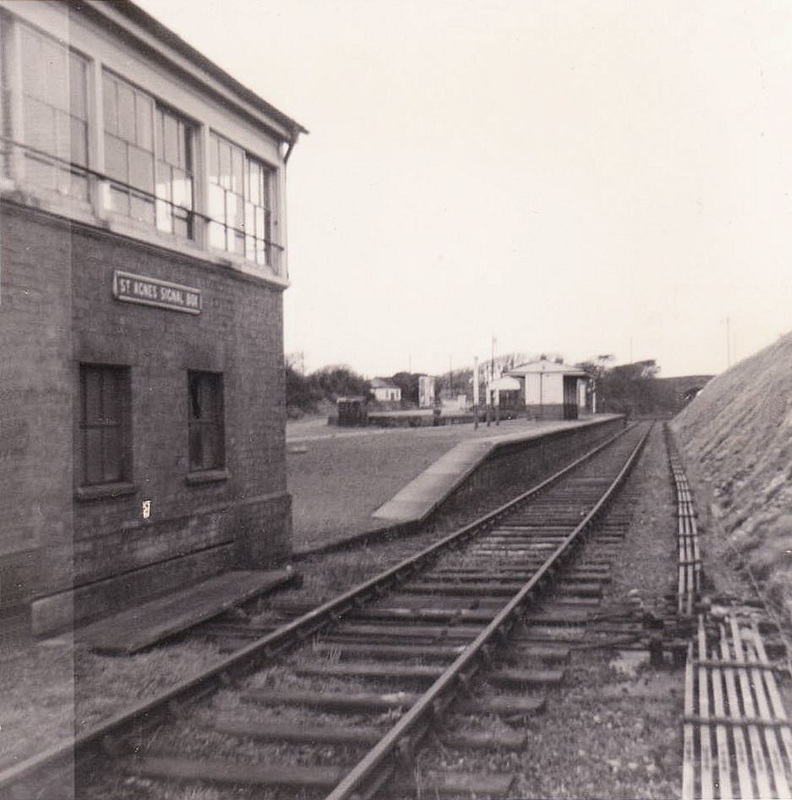 During my time relieving at Perranporth I was often the first to arrive in the morning and the last to leave at night combining signalling duties with station work until the other staff arrived. On one occasion I rode my motorbike over from Camborne and arrived at Perranporth at about 6am. 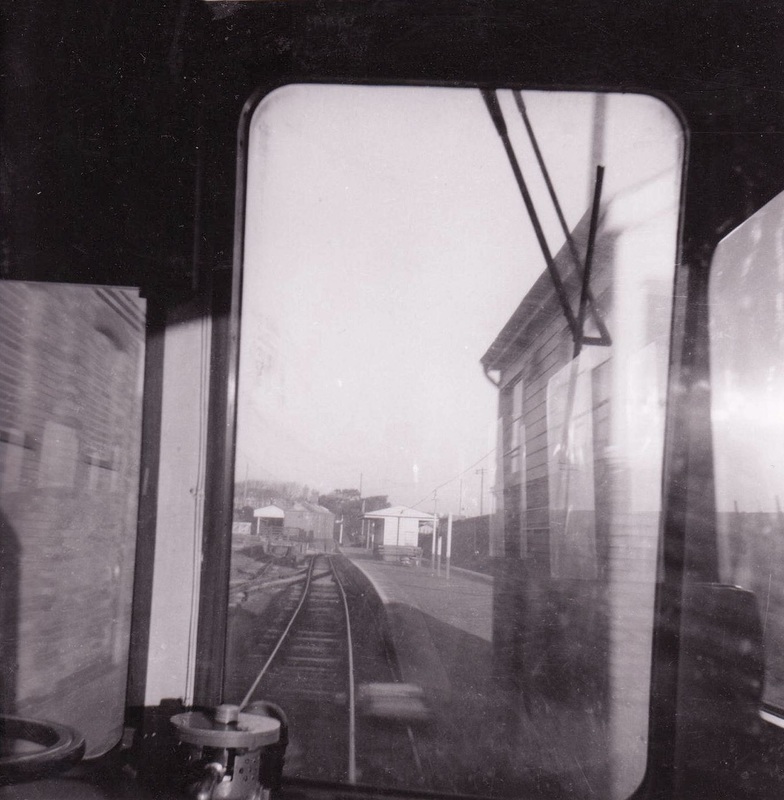 I switched in the box ready to accept the first train and went down to unlock the parcels office. When I opened the door I found that the previous night's signalman, Glen Pedlar, had prepared a surprise for me---a coffin (empty) balanced on two chairs lay just behind it! Those were the days when the railways were common carriers, you accepted everything that turned up. On another occasion I was the only remaining member of staff in the evening when a down train came in. The guard said there was a parcel in the van for Perranporth. The "parcel" turned out to be a goat! during its journey the goat had unfortunately eaten its label so there was no clue as to its final destination or who was going to collect it. Furthermore it needed milking. 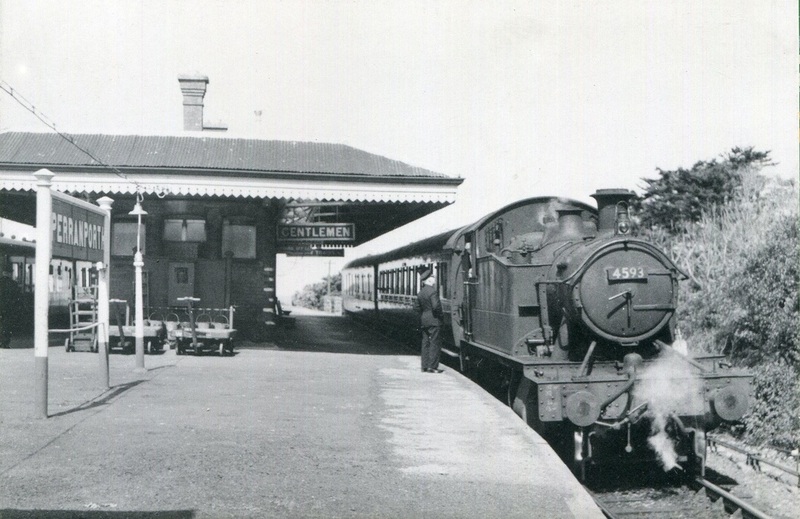 Luckily the fireman of a Truro bound goods waiting at the platform was experienced in such matters and kindly obliged, taking away the milk in his tea can. When I left work the goat was still with me so I put it to bed for the night in the shed near the weighbridge and, as it appeared to enjoy a paper diet, left it with a few out of date timetables to eat. 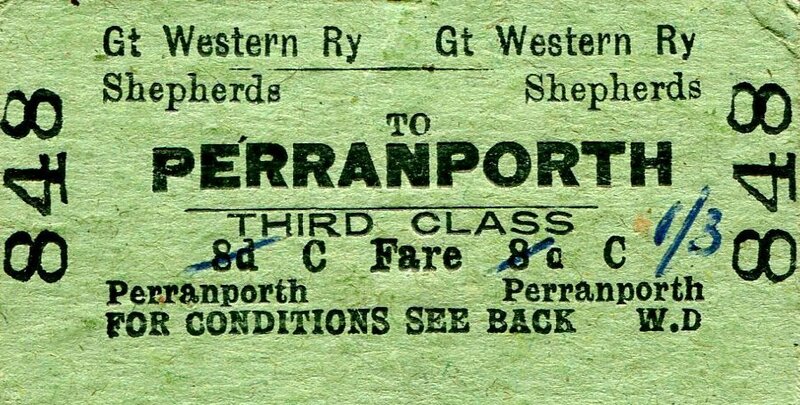 Next morning there were enquiries and the customer collected his goat safely unaware of its experiences during its shift at Perranporth. 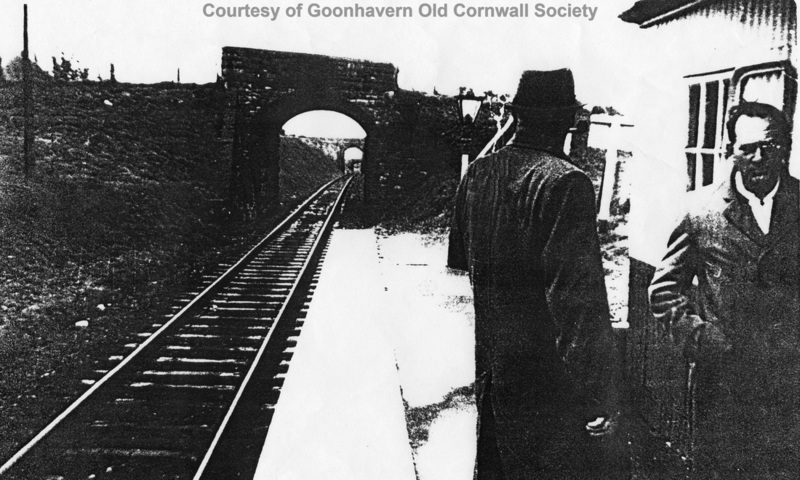 Henry Morgan, a great champion of the Chacewater-Newquay line , was the much respected station master at Perranporth. He was very proud of his station, his uniform, his office desk and his proficiency as a St. Johns Ambulance man. This, of course, created opportunities for practical jokes. 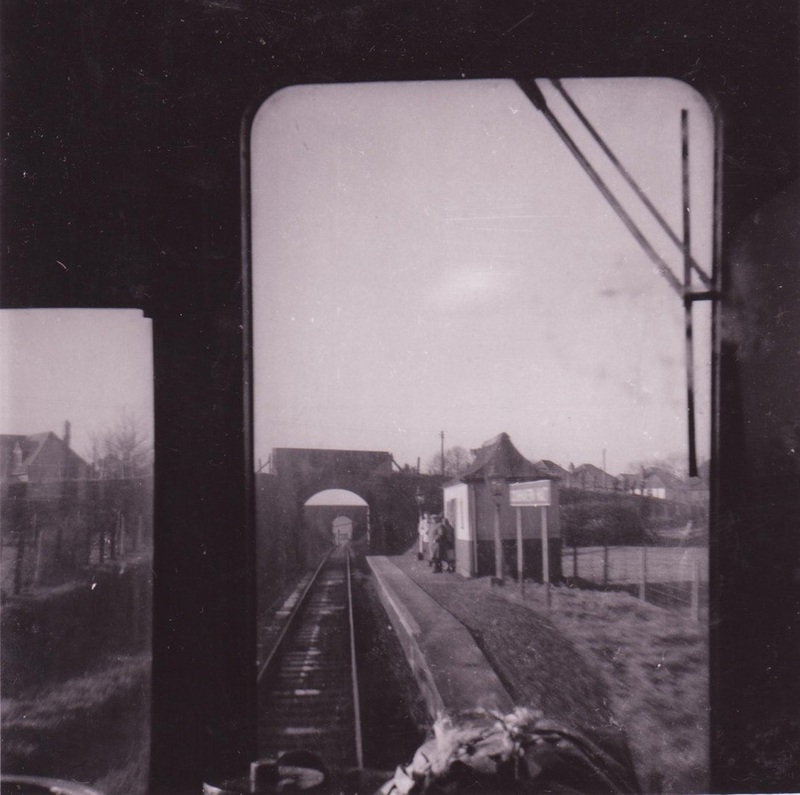 One day itching powder found its way onto the band at the front of the stationmaster's cap just where it came into contact with his bald head-we enjoyed the results of this experiment for almost a week afterwards. 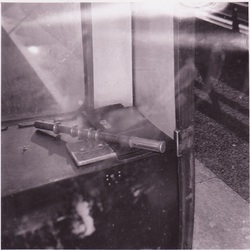 Early on another morning dummy "dogs doings" were left on the platform right outside the station master's office door. Henry emerged, stepped gingerly over it and announced that it should be removed at once. Eddie Woon, the porter, keeping a straight face duly rushed over, picked it up with his fingers and ran up to the signal box where we had a good laugh. Soon Henry appeared to see Eddie cheerfully eating a piece of cake using the same fingers that had handled the offending object. Henry's training in first aid and hygiene took over and, while praising Eddie for his prompt action, ordered him to put the cake down and insisted on supervising him while he thoroughly washed his hands. 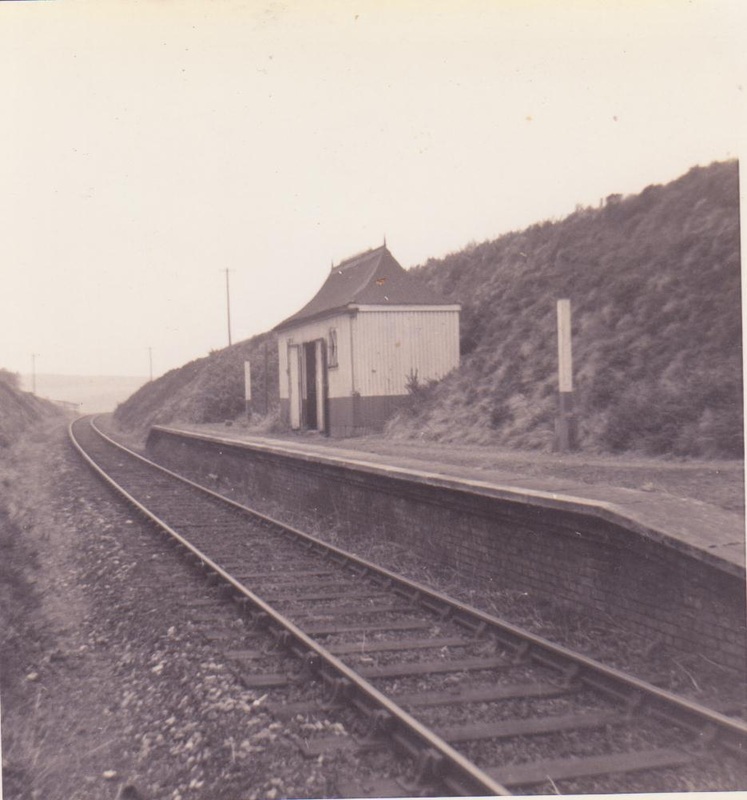 Despite the best efforts of Henry Morgan and others Perranporth station and box were closed with the rest of the branch on February 4th 1963. 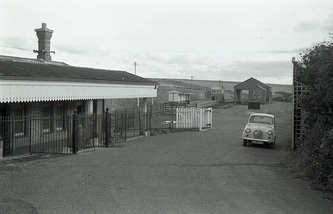 However, Beach Halt, which was more convenient for the beach and town, remained open throughout the summer as a lorry served luggage in advance depot to maintain previously advertised services. 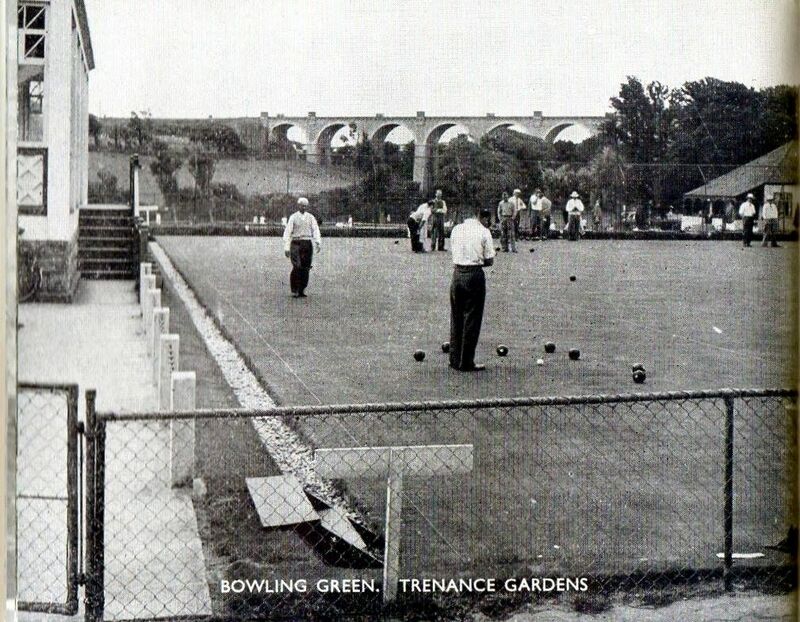 Beach Halt lay on a 1 in 45 gradient and a freshly stoked up 45xx pulling away and stoked up for the climb held happy memories for those players at the adjacent bowling club, immaculately clad in their whites. 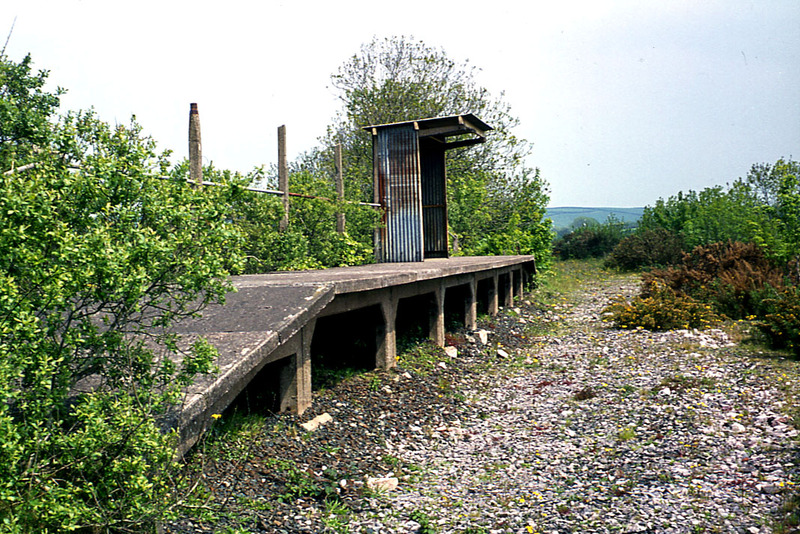 Perranporth Beach Halt, or at least its platform, still lives on as Falmouth Town. 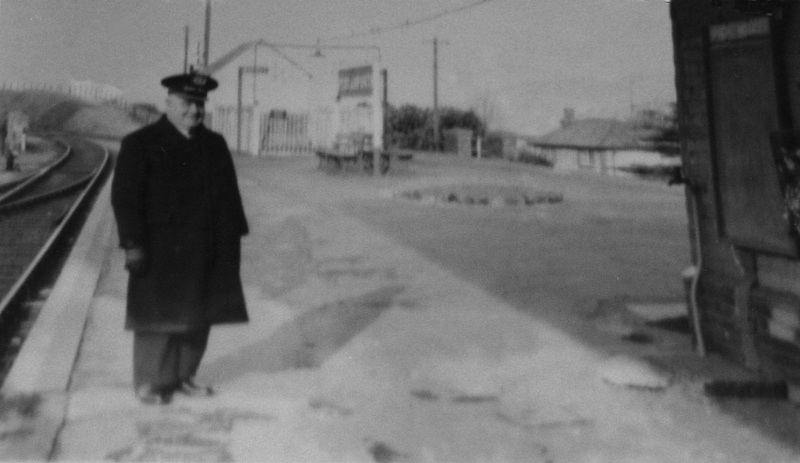 The late Henry Morgan, looking very smart pictured on the up side of the platform at Perranporth. The owner of this print is unknown. 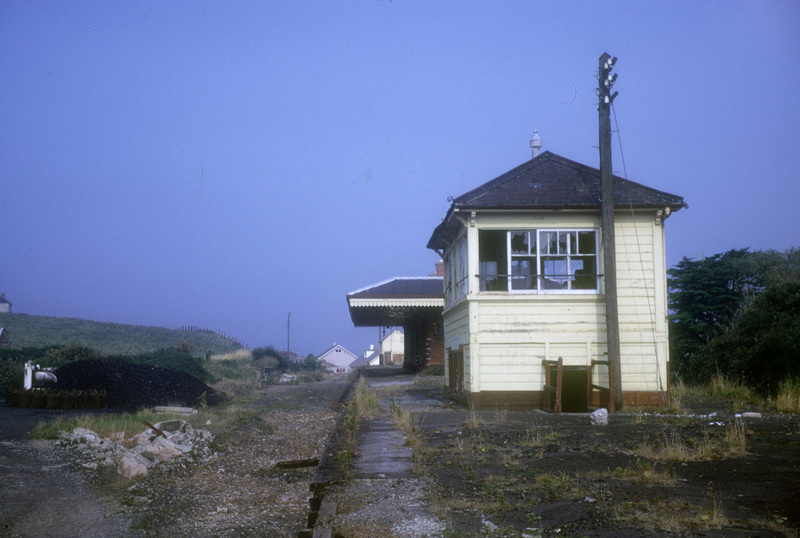 A nice colourful addition Perranporth signal box, this picture taken in September 1966 by Doug Nicholls, Copyright. 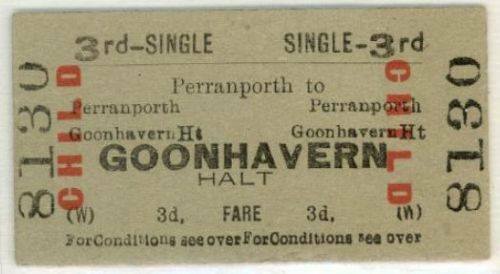 The train is headed by a 45 or 55 class loco and is making its way from Goonhavern towards Perranporth which will be the next stop on route to Chacewater and probably Truro. 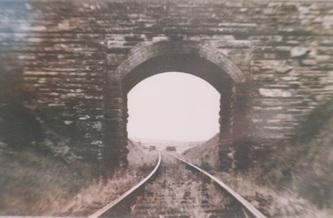 This is a view from the north side of the viaduct, a clue to the position of the photographer is the road seen through the rightmost arch. 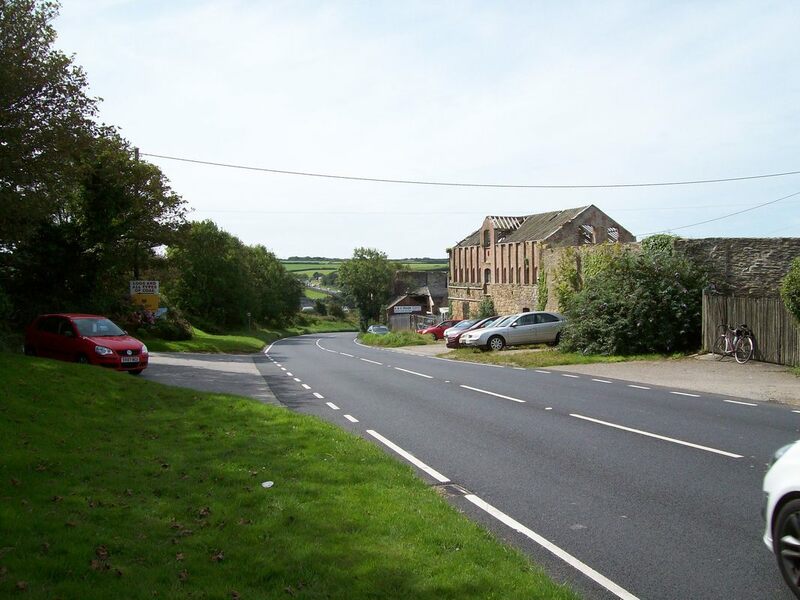 This is Church Hill on the A3075 road. 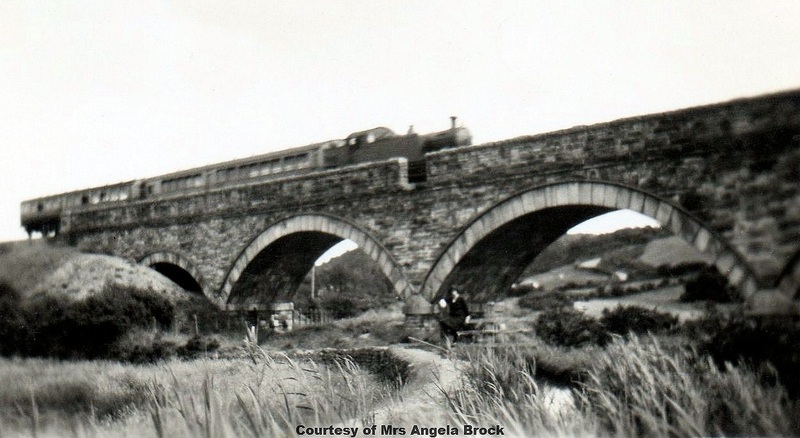 Our sincere thanks to Angela Brock for allowing us to publish what is almost certainly the only picture, ever, of a train on this viaduct. Copyright. 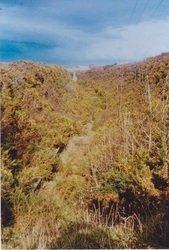 A view looking down onto the Perranwell Viaduct - the line is climbing from left to right towards Goonhavern. A facebook picture. 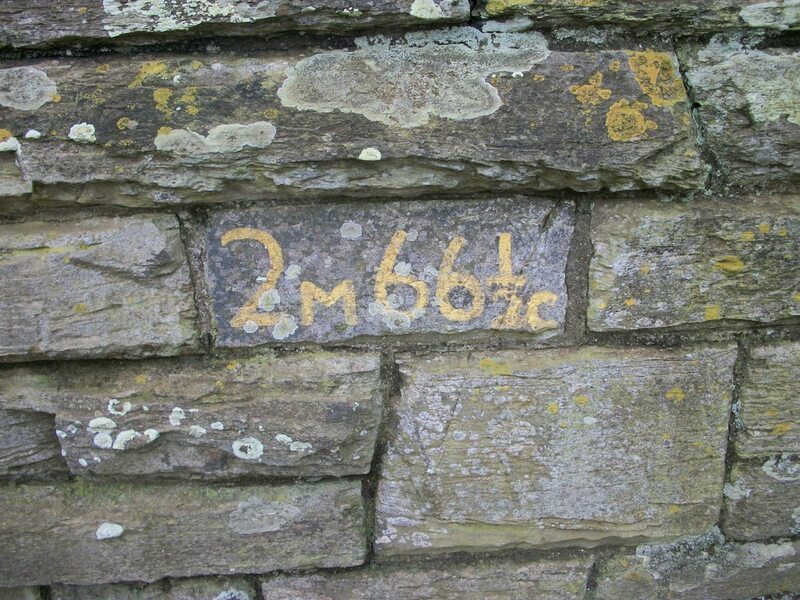 Detail of markings on Perranwell viaduct. Copyright Derek Brooks. 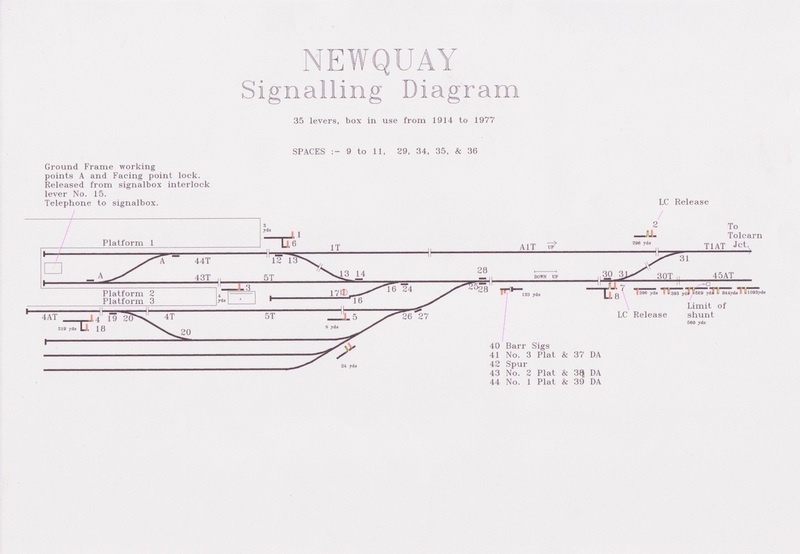 It is suggested that TNQ Means Truro to Newquay line and the S number is structure number. Network Rail remains responsible for this structure. 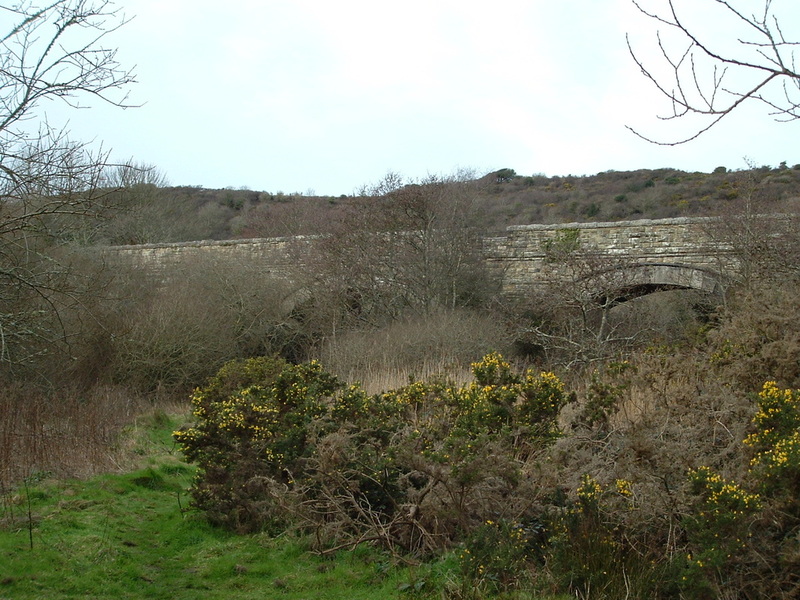 A relatively recent picture of the only remaining bridge at Goonhavern. This was the first overbridge coming from the Perranporth direction. 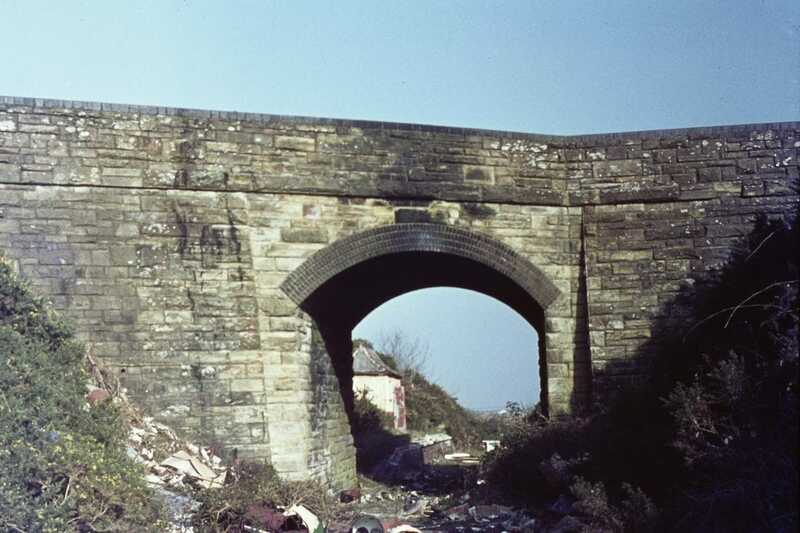 Perranwell Road Iron Railway Bridge Circa 1998 Copyright Derek Brooks Goonhavern OCS. Here's a good website for looking at old pictures of Goonhavern and district. Now hears a first. 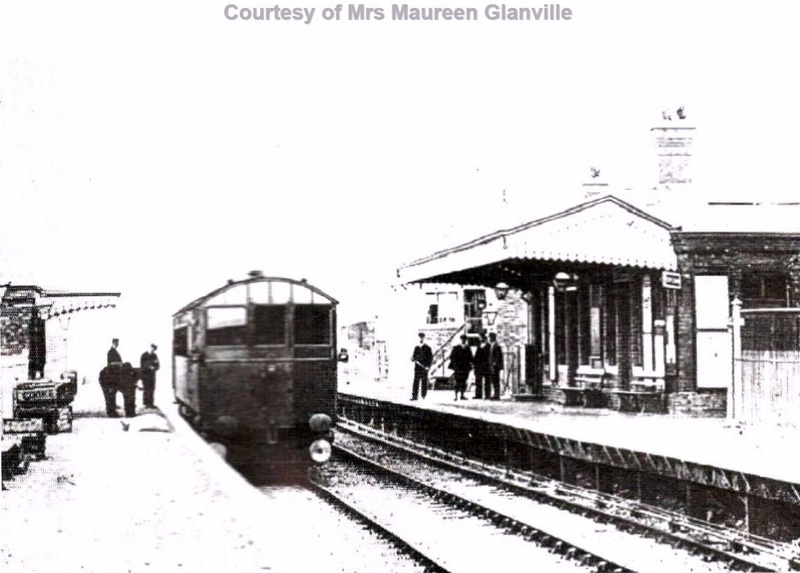 Yes the first train through Goonhavern in 1905. The locals are out in their Sunday best to greet it and many thanks to the unknown photographer for recording the scene. Copyright Goonhavern Old Cornwall Society courtesy the Recorder Derek Brooks. 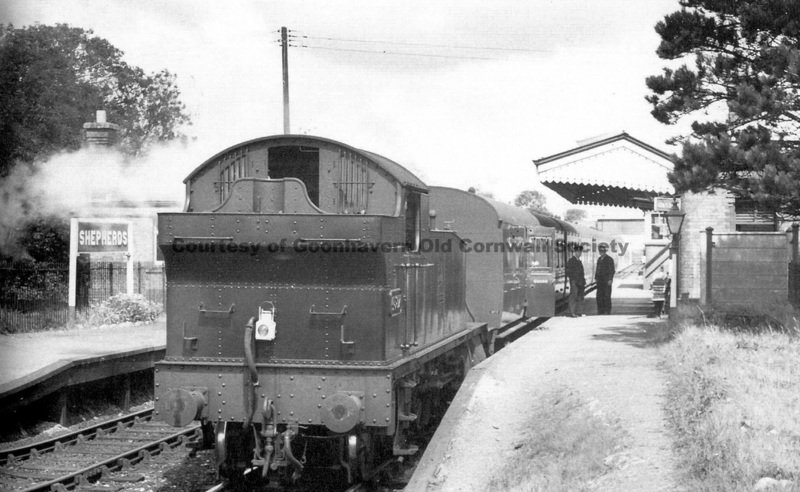 A lovely shot courtesy of the Goonhavern Old Cornwall Society as a class 45 tank pauses at the station. 45's and 55's were the mainstay of the motive power on this line for much of its existence. Copyright Mr David Pearce. 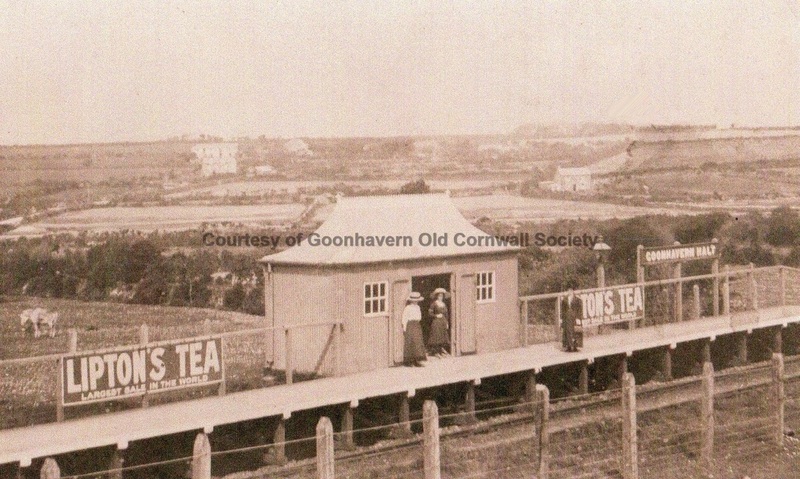 A lovely shot of Goonhavern Halt in the 1920's with enameled advertising plates. Note the ladies in their long dresses. 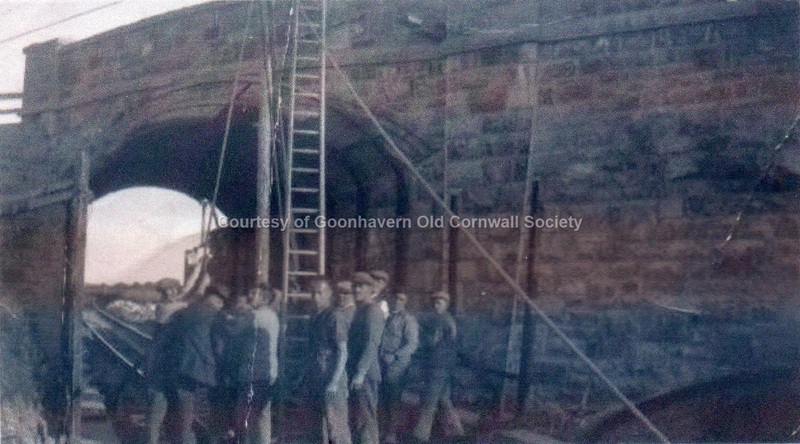 This picture courtesy of the Goonhavern Old Cornwall Society. Goonhavern Halt in 1957. 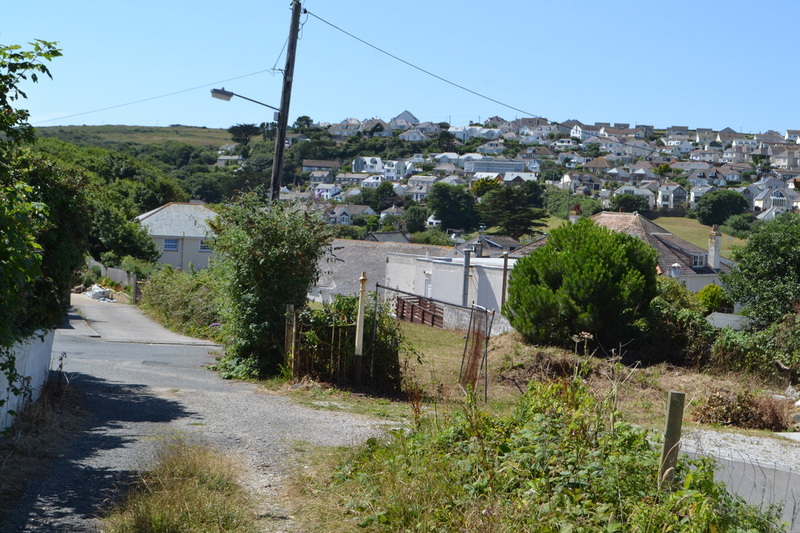 We're looking towards Perranporth and it would seem that that is where the next service is expected. The gentleman on the right doesn't look too happy about his trip to Newquay. Copyright. 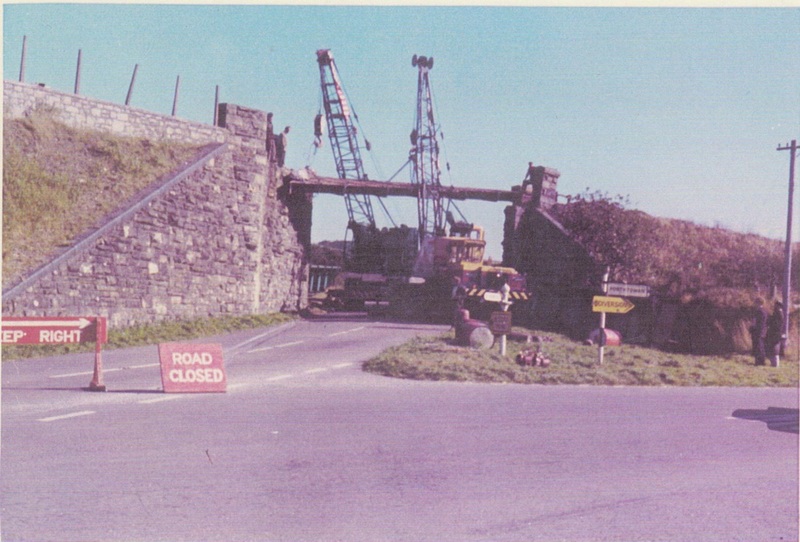 This picture is captioned Harry Commons working on Goonhavern Bridge Circa 1953. Eight men with the addition of the foreman, wearing his hat, are needed - quite who Harry Commons is in not known. 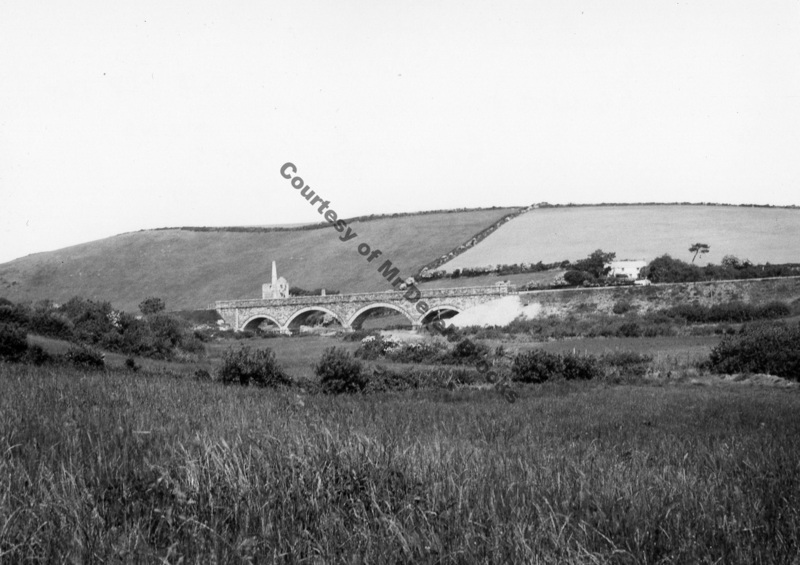 Goonhavern Halt 5 Jun 1920 - Copyright Colin Retallick Note, the distant mine engine house, seen to the extreme right was that of Wheal Albert- the building still stands but the chimney has been removed. 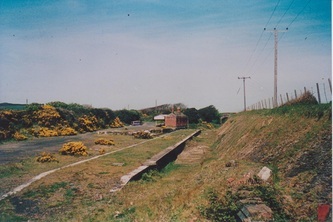 Also the area to the right of the running line was a siding used for the delivery of pit props until 1919 - it had only recently been lifter when this photograph as taken. 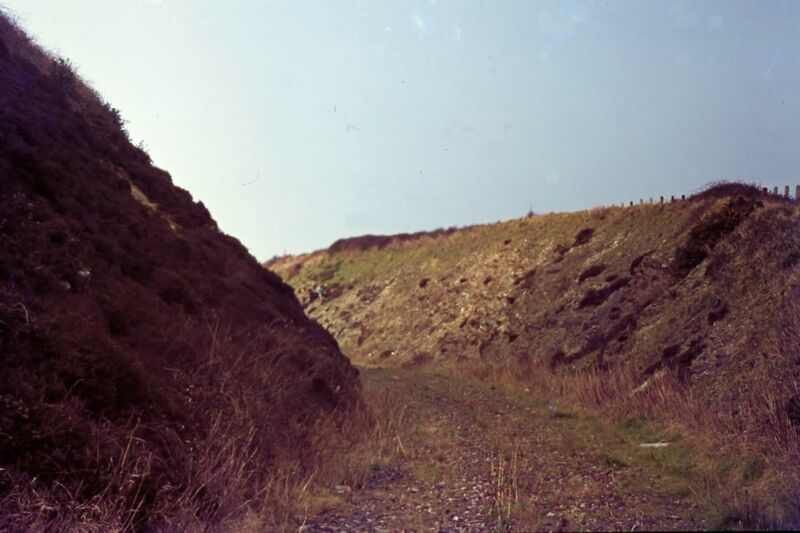 A very similar but wider view of the picture above of Goonhavern. From the Goonhavern Old Cornwall Society collection courtesy Derek Brooks Recorder. 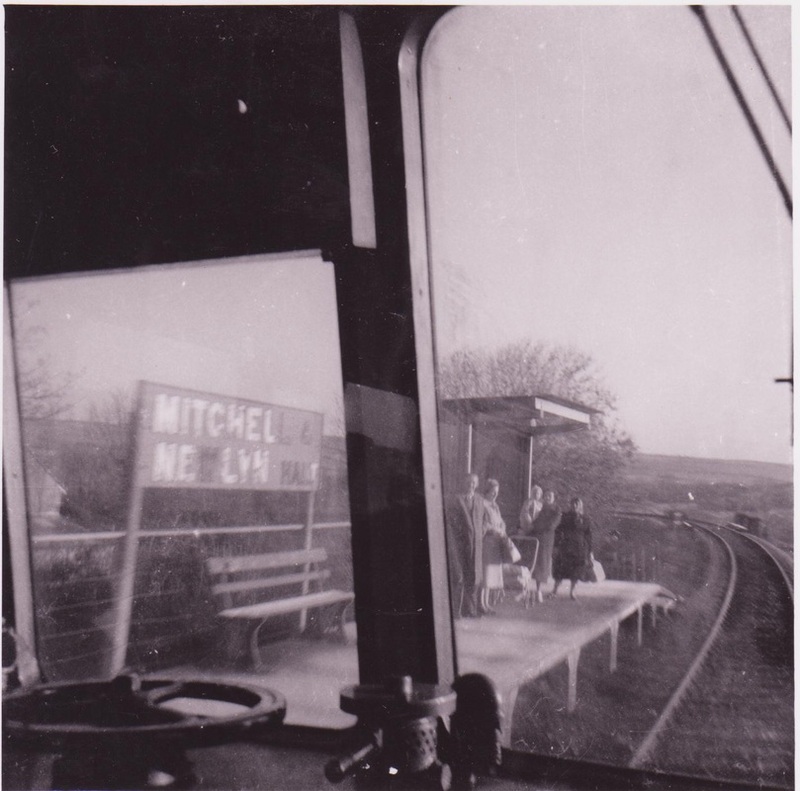 The Plymouth Railway Circle Cornwall Mineral lines Railtour near Goonhavern on Saturday 28th April 1962. 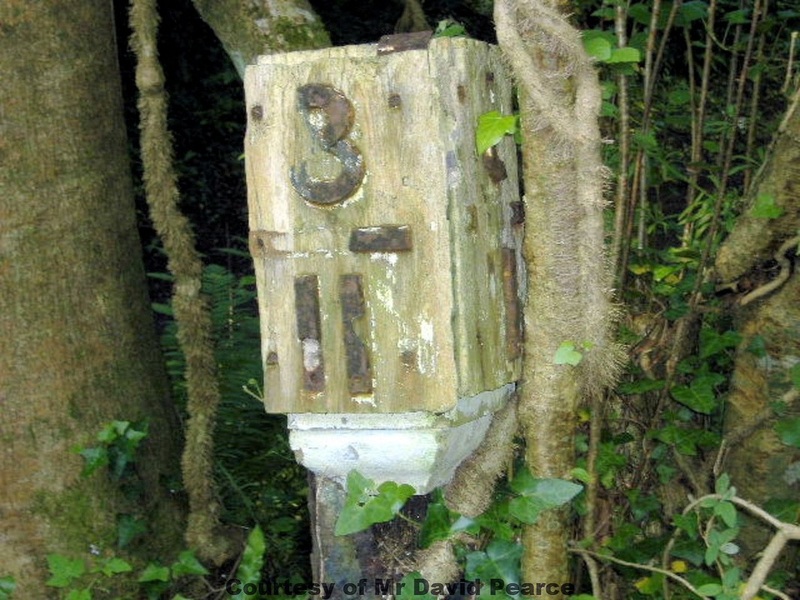 This picture was kindly provided by Derek Brooks, Recorder of the Goonhavern & District Old Cornwall Society. Copyright. 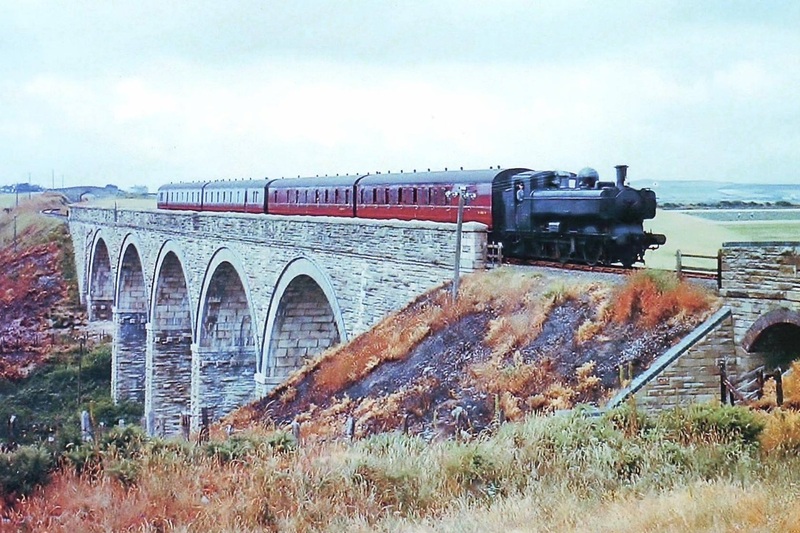 See the Steam Railtours Section for comprehensive cover of this railtour. 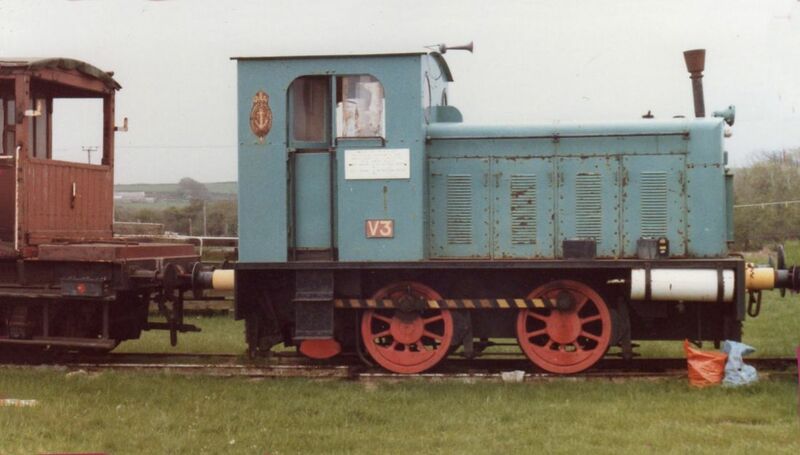 A class 22 63XX diesel replaced steam for the last few months of the lines existence. 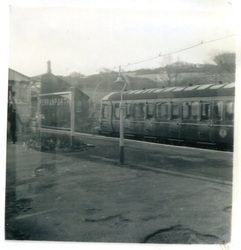 Here a train from Newquay slows for the stop at Goonhavern. Copyright Mr David Pearce. 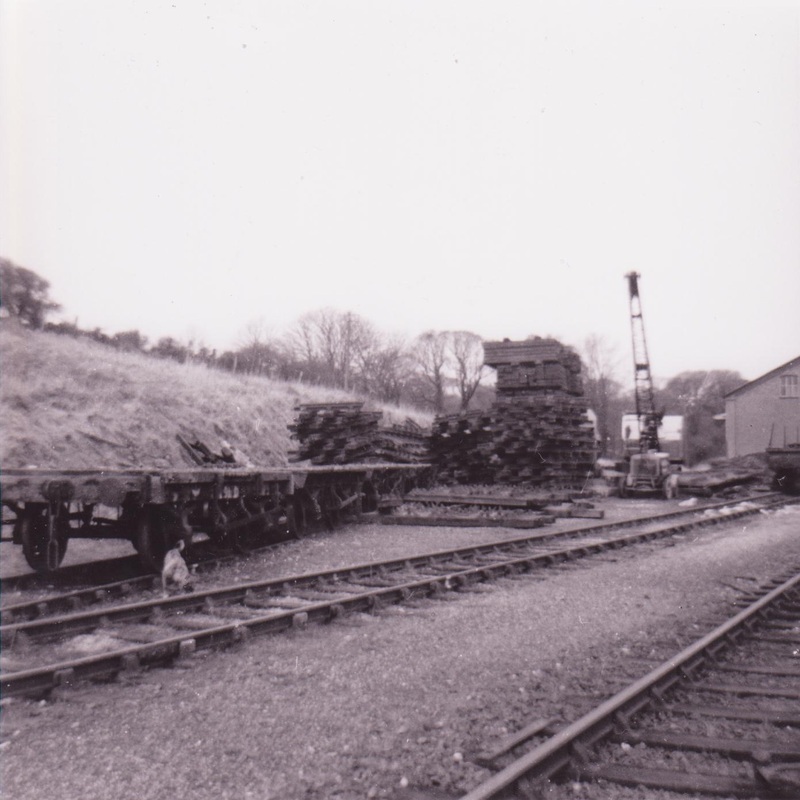 ​Alan Harris asks what became of the Hunslet, here is the answer: HE 3133 of 1949 was previously one of the s.g. shunting loco’s at RNAD Ernesettle (see my Plymouth’s Hidden Railways book for more on this location). 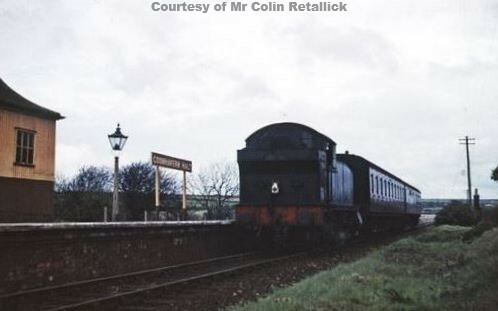 When the Cornwall Railway Museum at Zelah closed it moved to the Bodmin & Wenford in January 1987, thence to Chris Grove at Bere Ferrers on the Gunnislake branch in 1991 where it remains today. Many thanks to Paul Burkhalter for the above information. 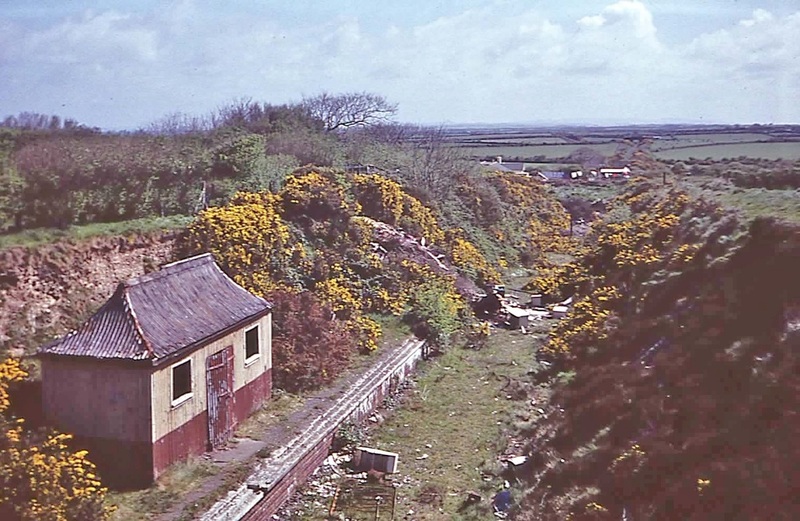 Named after a neighbouring farm, Shepherds was a wayside siding on the mineral tramway built by Squire Treffry of Fowey and running from Treloggan near Newquay to Treamble, serving lead and tin mines there. It opened in 1849. 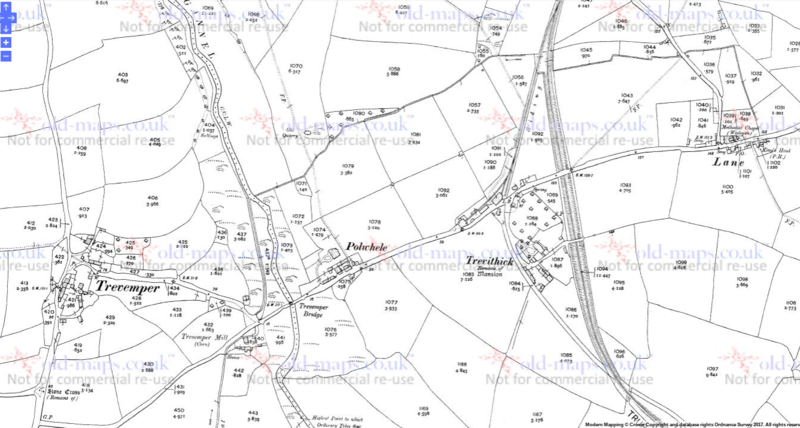 At this time there were several mines working around the area, most notably East Wheal Rose. 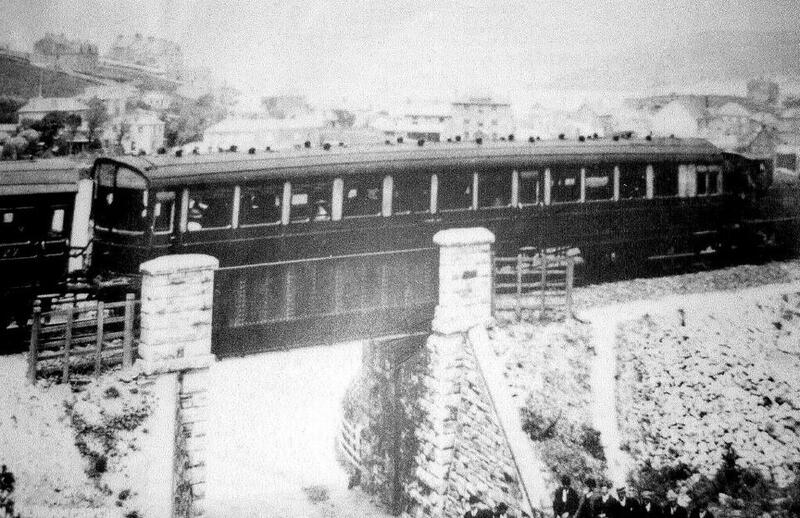 The line was upgraded for use by locomotives on June 1st, 1874. 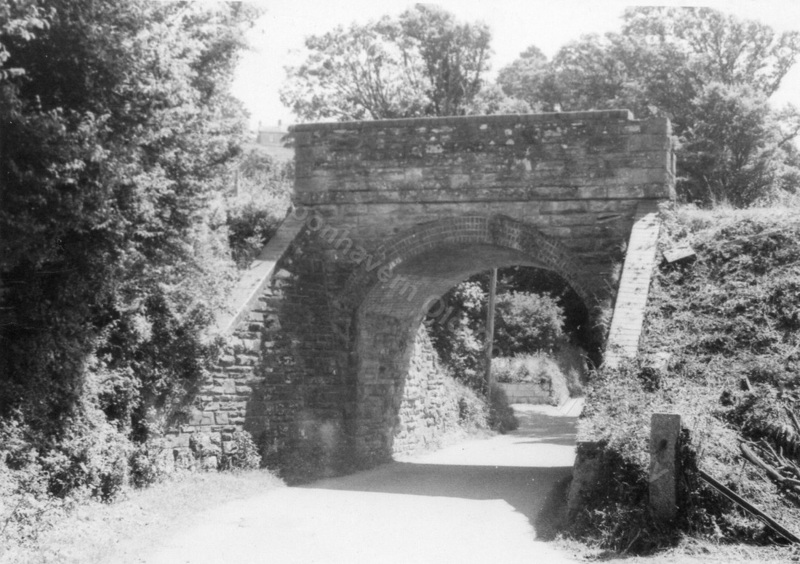 Treffry’s tramways later became the Cornwall Minerals Railway and was absorbed by the GWR. 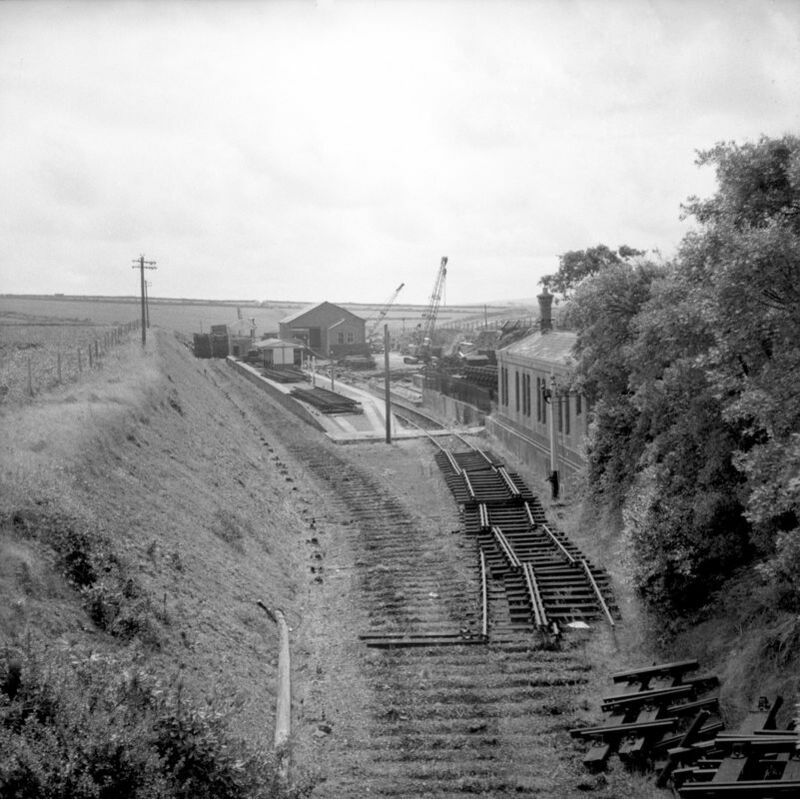 The GWR wished to forestall a move by the London and South Western Railway westwards into Cornwall. 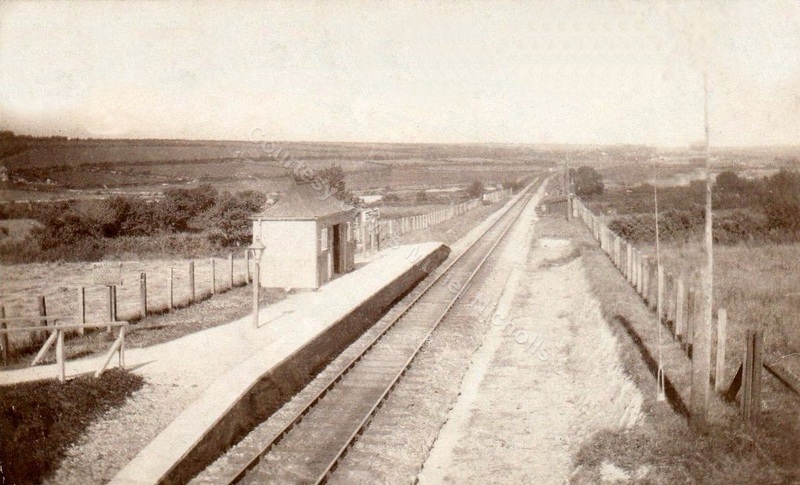 The LSWR had opened their North Cornwall line in 1890 to Wadebridge and Padstow, so a development of the Par to Newquay and Treamble branches was envisaged. 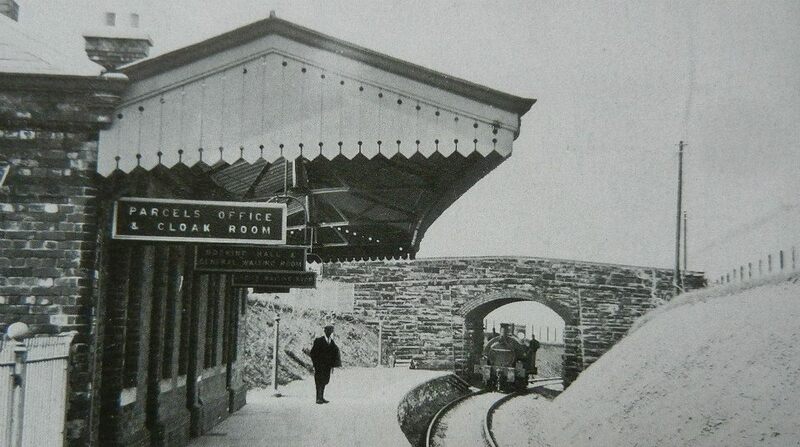 Shepherds station opened in 1905, when services through to Newquay began. 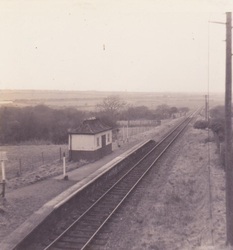 The station, though remote (there were some railway houses adjacent, but nothing else except the farm) was a crossing place with two platforms of the same timber construction as that at Perranporth. 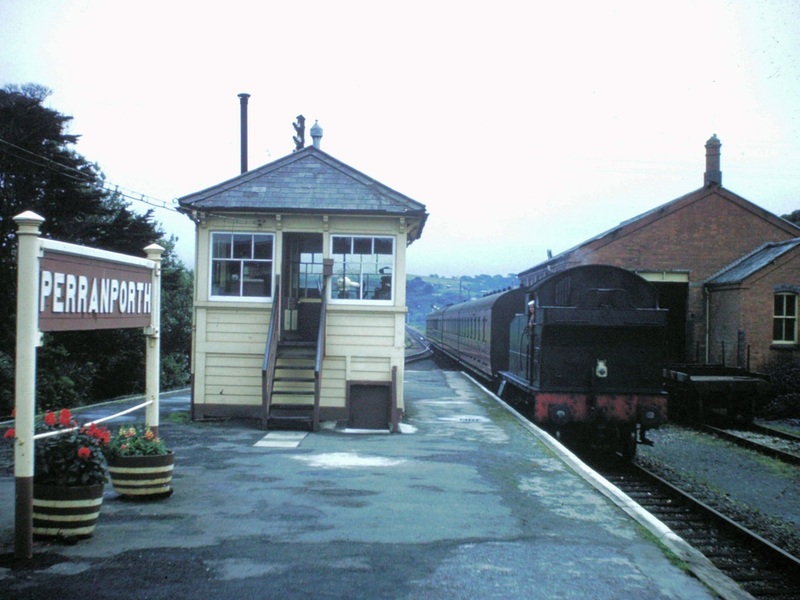 The signal box was a standard Great Western ‘type 7’ of brick, with a 23-lever frame, same as Perranporth. 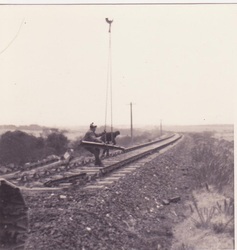 The Junction for Treamble was on the up side and the branch was worked under ‘One Engine in Steam’ regulations, with wooden train staff. 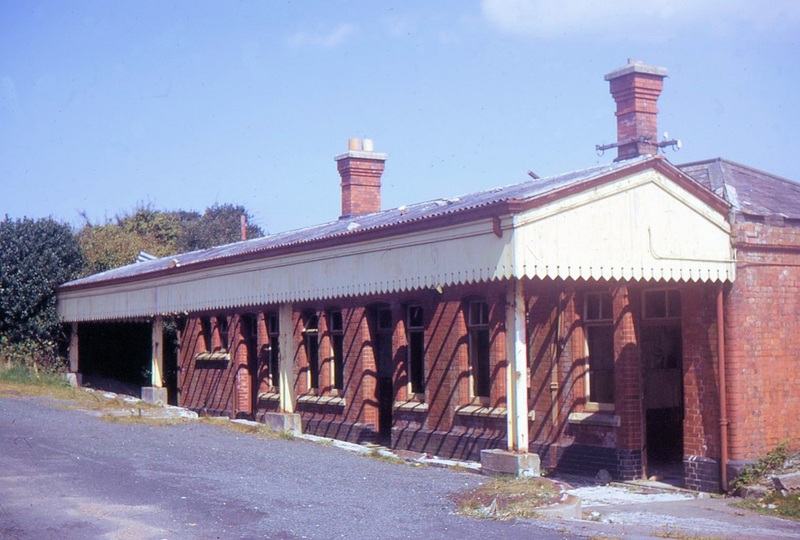 The station buildings were of the standard GW pattern of the Edwardian era, found all over the system. 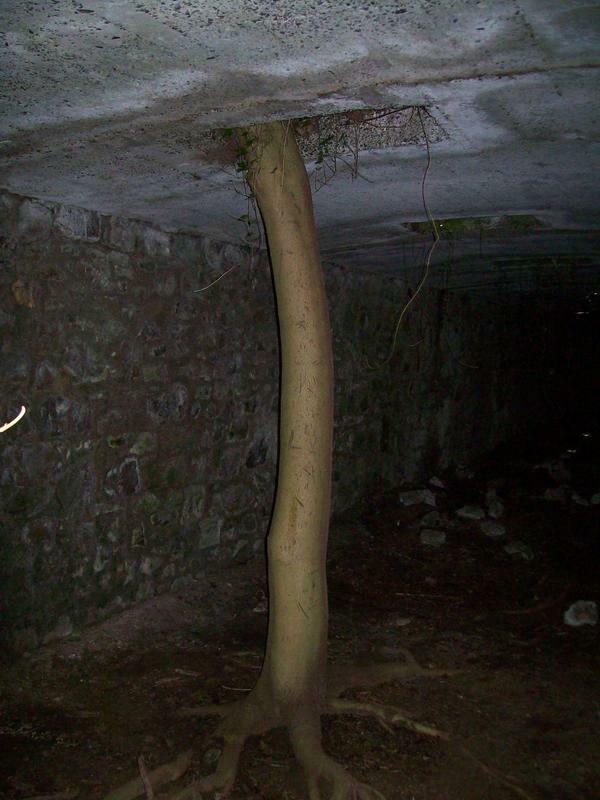 Even the standard clump of Great Western trees was provided (they survive today). 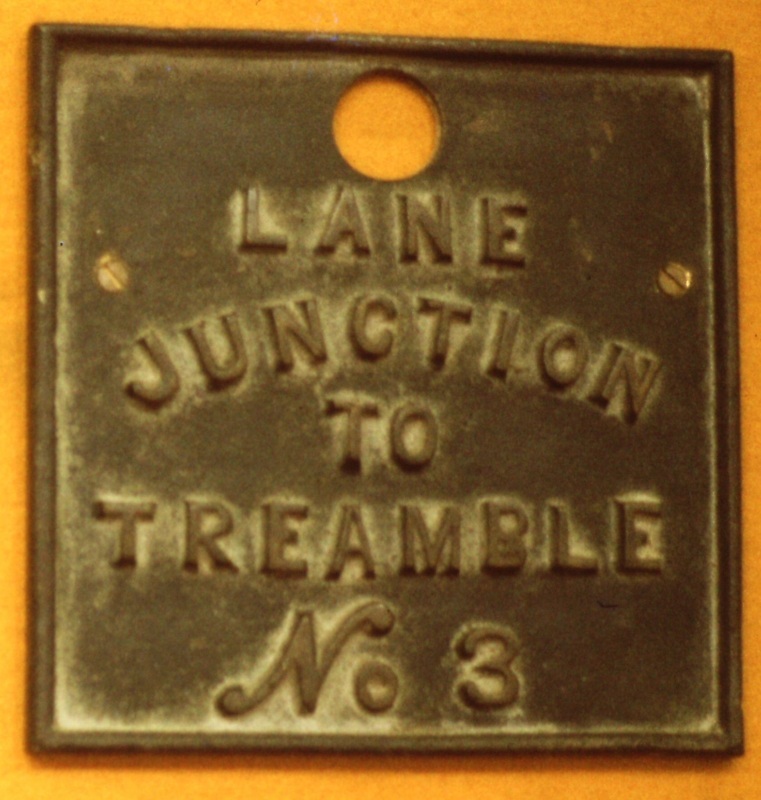 Treamble was lifted in 1917, but re-instated in 1925. Traffic after the first world war seems mostly to have been sporadic, at best. 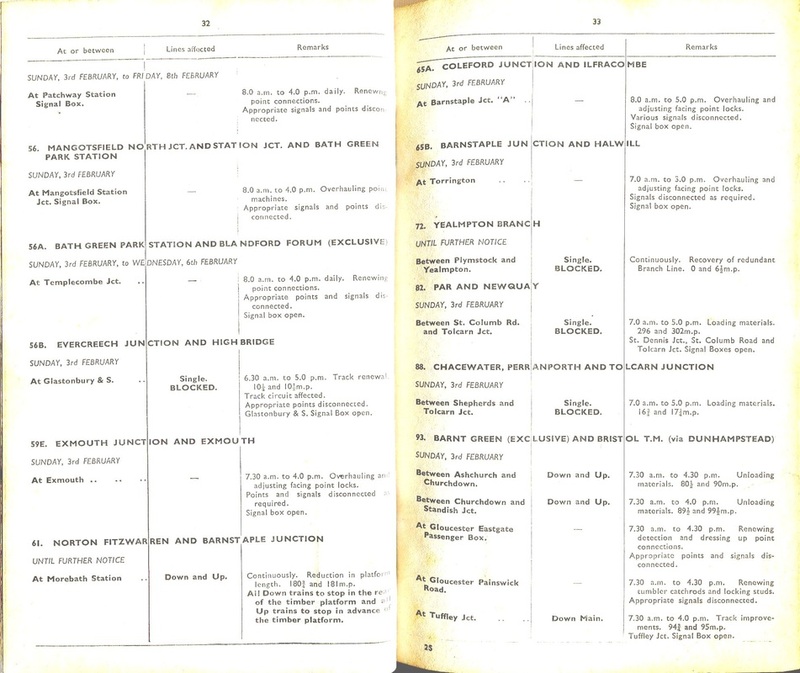 The 1926 working timetable shows a daily trip, but by the 1930s it was ‘..to run as required’. 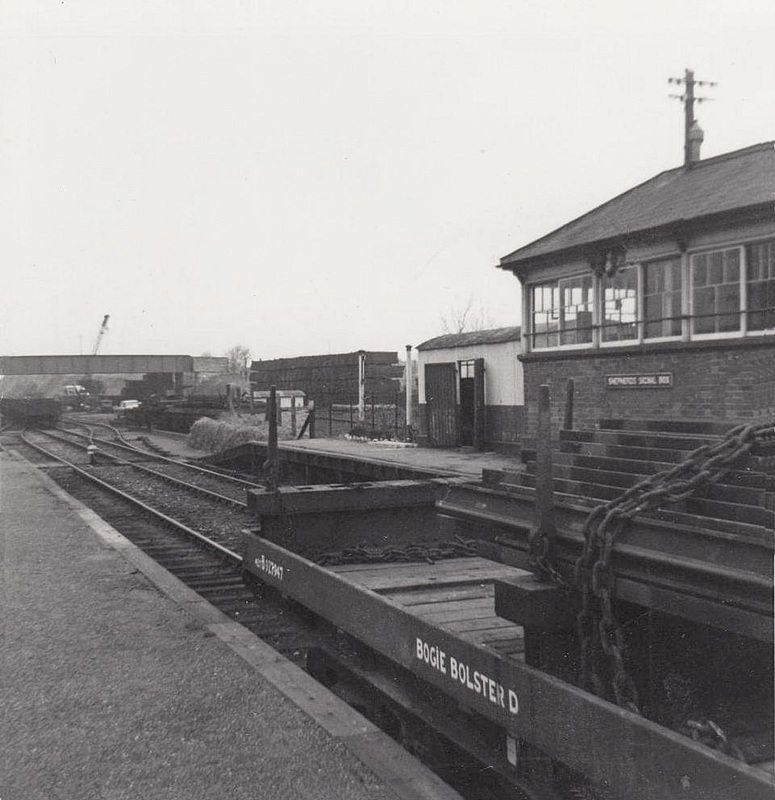 After world war two there was virtually nothing and official closure came in 1952, although some of the line was used for the storage of redundant wagons for a few years after that. 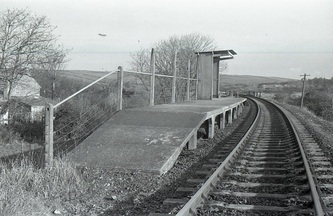 The descent at the Newquay end of the station was steep and for safety reasons, the points leading to the siding at the Newquay end of the up platform were ‘spring points’ –set for the siding in order to deflect backward runaways. 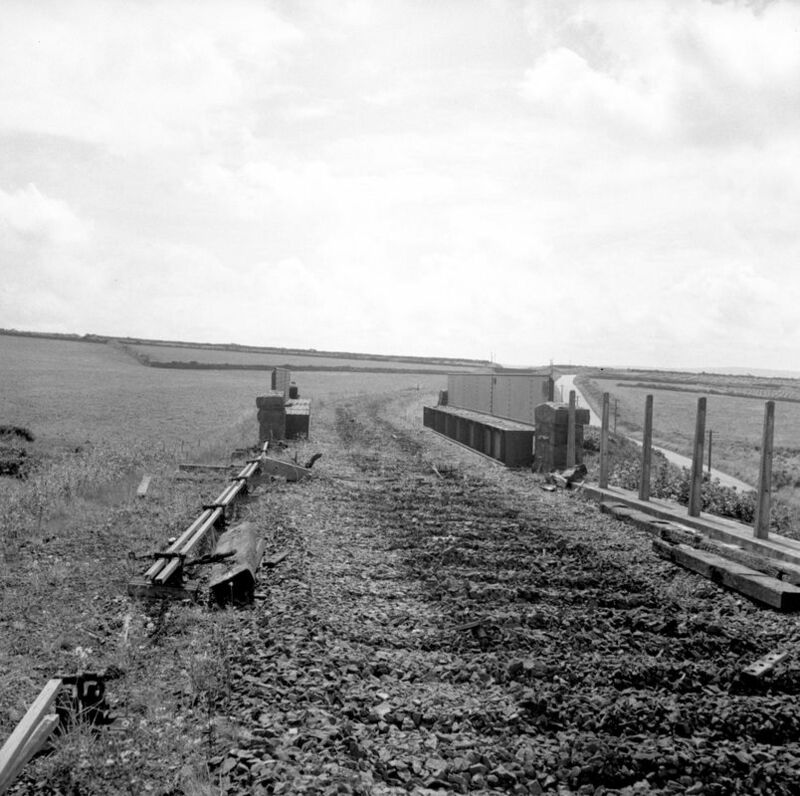 The siding formed a long loop, with the points at the Newquay end operated from a ground frame. 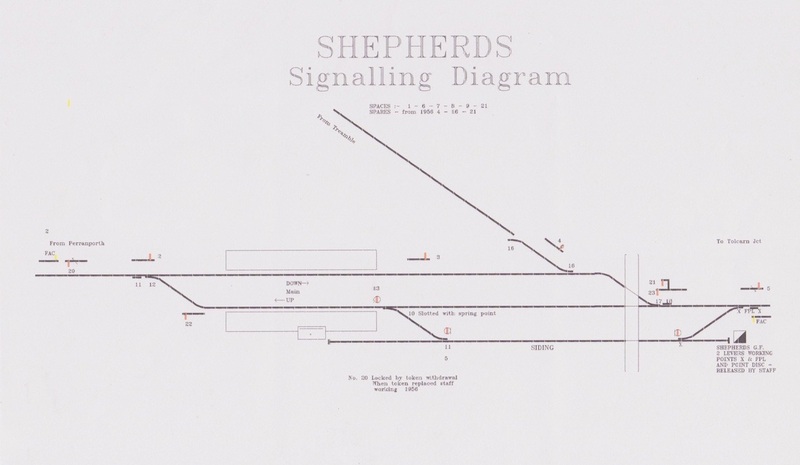 Local freight and passenger traffic was never much: the significance of Shepherds was as a crossing place on the long single line section and as the junction for Treamble. During world war two there were one or two troop trains using the Treamble branch as access to the Penhale training area, but otherwise the war passed the Perranporth branch by. 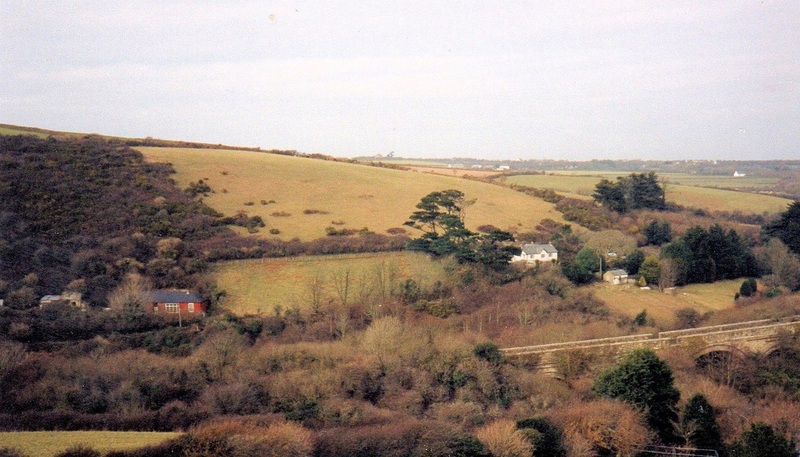 There were none of the expansions and additions which occurred on the branches on the South Cornish coast. 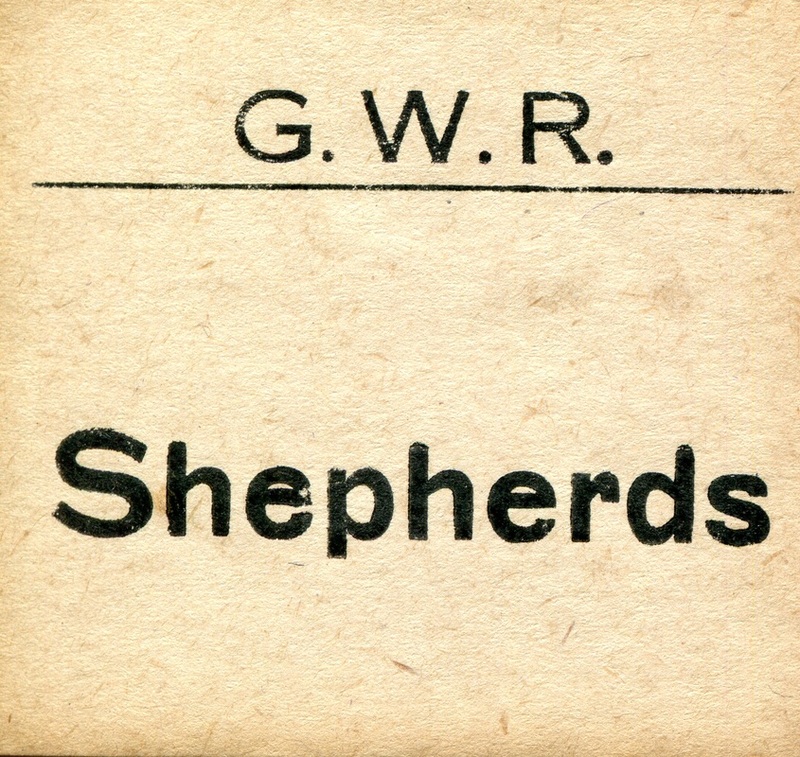 Shepherds housed a Camping Coach from the 1930s onwards: it was (along with all others) withdrawn during world war two, but had returned in the 1950s. 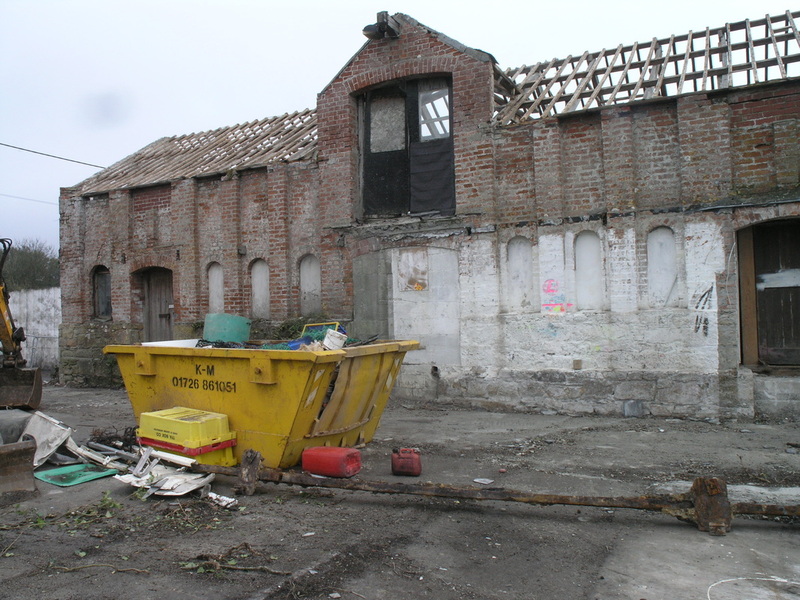 With only three significant buildings of brick, Shepherds station soon disappeared after closure: today the site is a muddy farmyard. 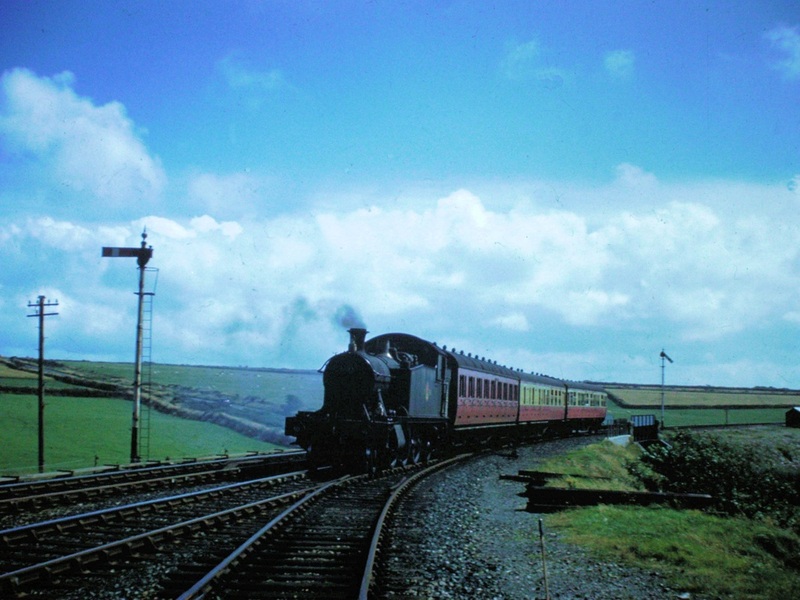 It is September 1962 - the line has just months to live as a class 22 approaches with a Newquay bound service. This 'gem' from John Thorn. Copyright A further note. 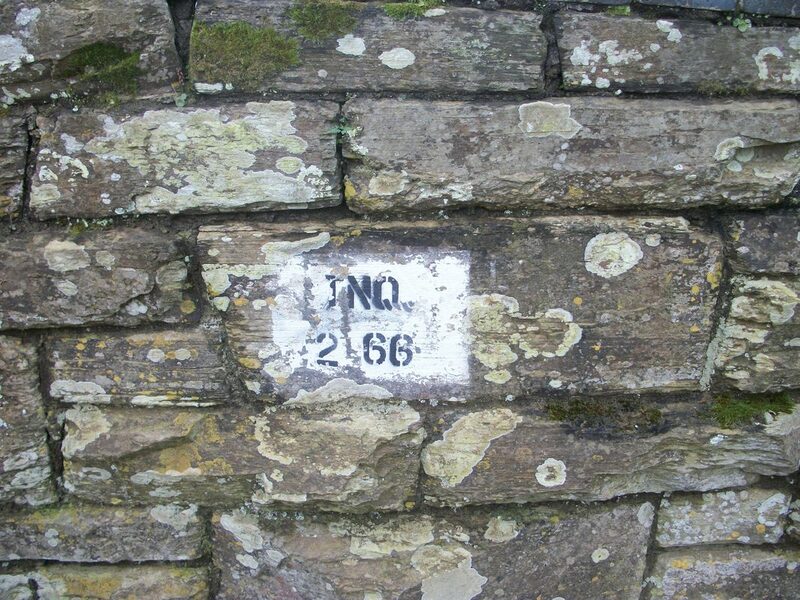 Many thanks to detective work by Neil Phillips we now know that the loco is D6324. 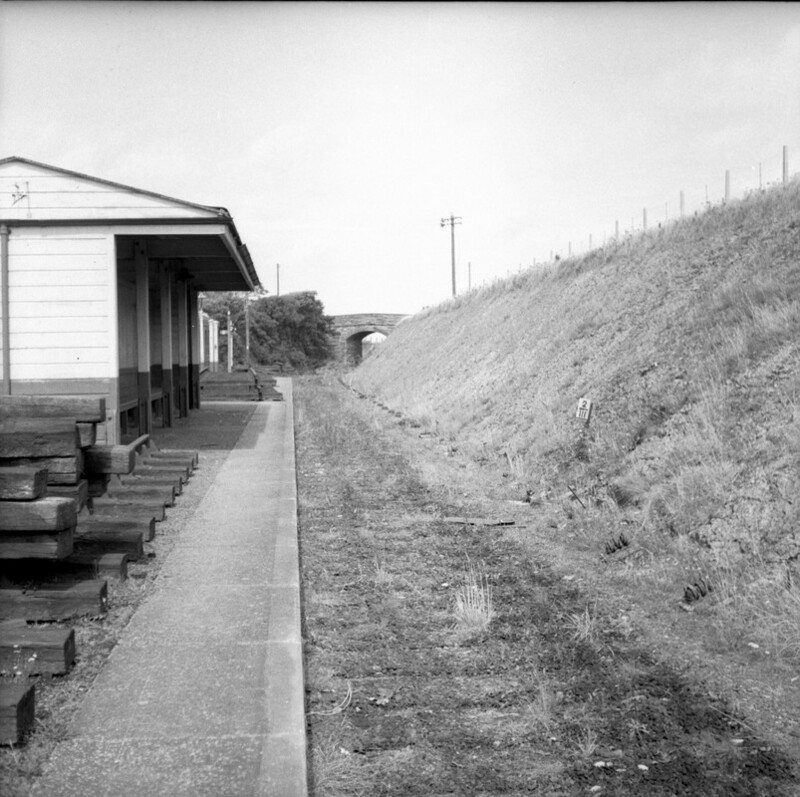 Shepherds station looking from the road overbridge. 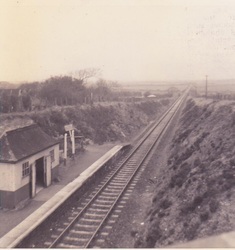 Whilst the metals of the loop and main line are well polished it doesn't look as if the Treamble branch off to the right has seen much use. Although note a few wagons can be seen being stored. As can be seen the line towards Truro which as been a steady climb from Trewerry and Trerice having levelled off for Shepherds station continues its climb towards Lanteague and Goonhavern. Copyright Mrs Maureen Glanville. 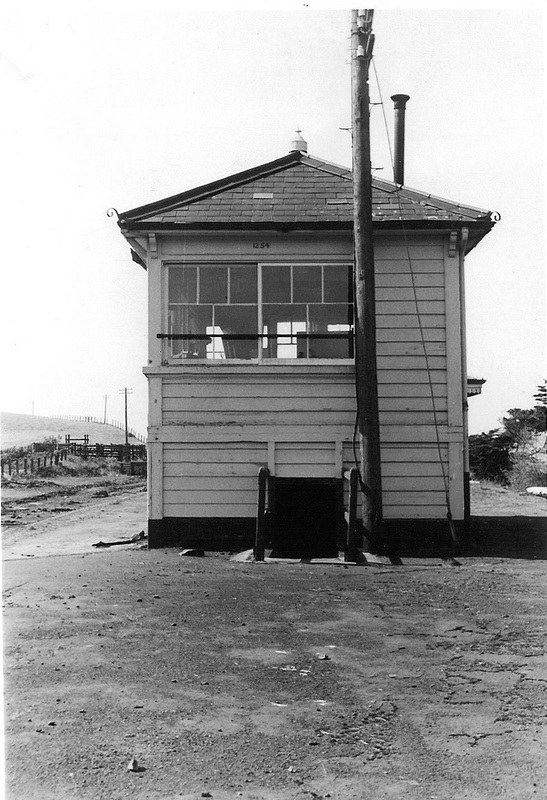 The Shepherds Signal Box that I knew was opened with the station in 1905. 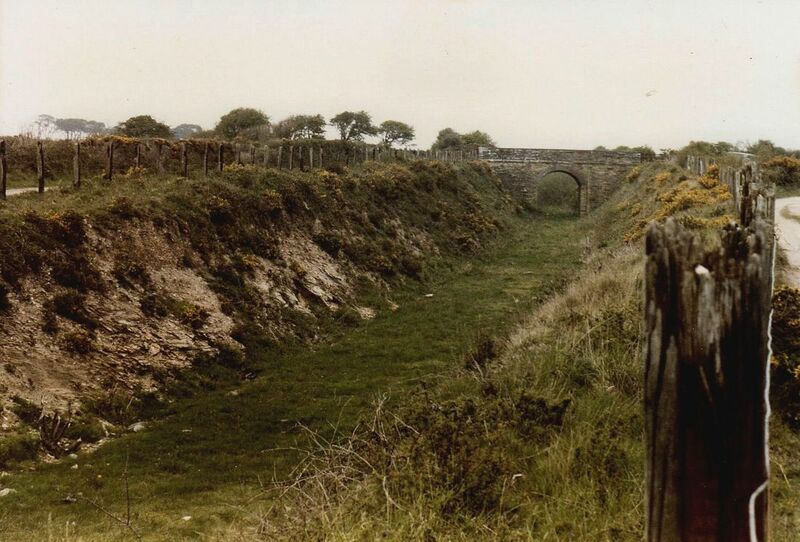 However there was much earlier railway activity in the area in the shape of the Newquay Tramway, the Cornwall Mineral Railway and the branch to Treamble and Gravel Hill. 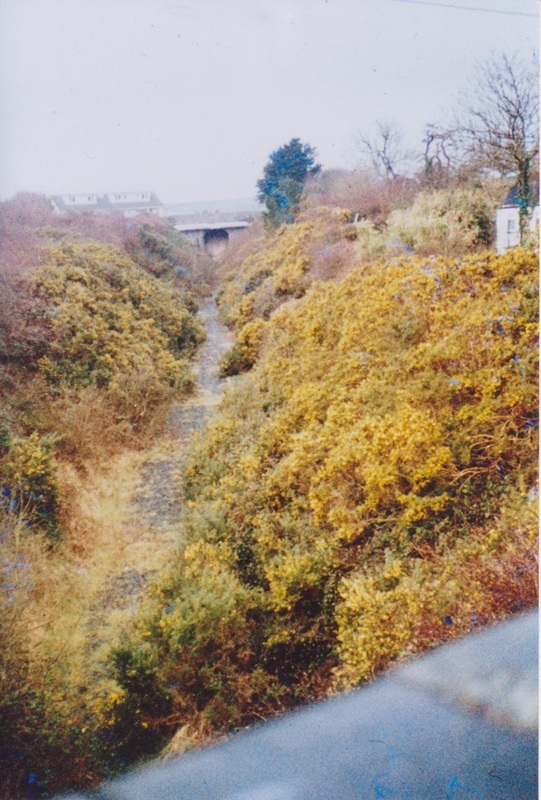 The chequered history of the Treamble branch ended with final track removal in 1956 so when I worked at Shepherds only the track bed at the Newquay end of the down platform remained. The substantial signal box was situated on the Chacewater bound platform and was of the usual design with brick base, wooden sliding windows and exterior steps. Inside were the usual stove, oven, chair and desk. Although I seem to remember the frame was large enough for 23 levers only 14 were in use, 8 for signals, 2 for discs and 4 for points. 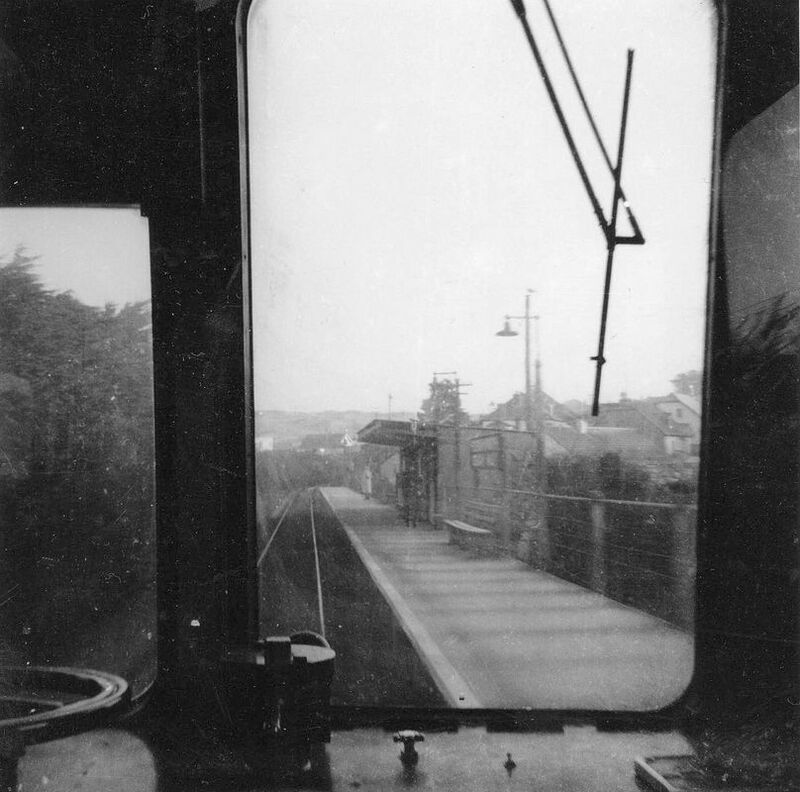 There were the electric train staff instruments, later replaced by electric token instruments to control the single line sections to Perranporth and Tolcarn Junction respectively. Signalmen used the station toilets. 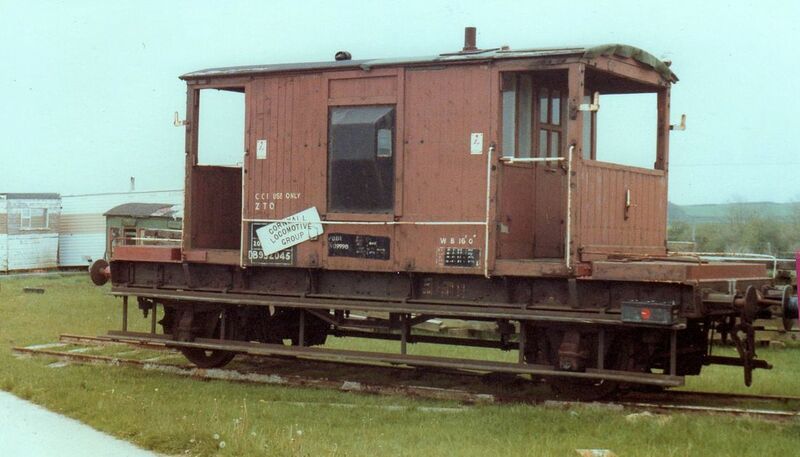 I was told a camping coach was berthed in the cattle dock siding during some summers but I never saw one. There was rarely any traffic for the goods yard and very few passengers, perhaps understandable as the station was "in the middle of nowhere". Indeed, travelling on my motorbike from Camborne in the dark to my first ever shift there early in the morning I briefly got lost and had to ask the driver of a milk lorry for directions! 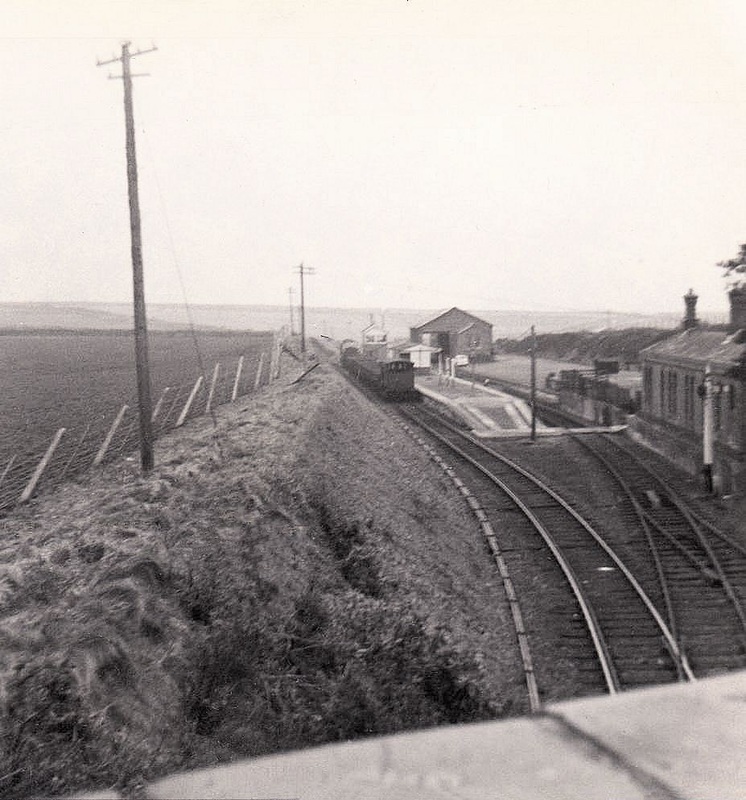 There was an adjacent farm and a couple of railway houses, one of which was occupied by the regular signalman. Despite its isolation the station was fully equipped with solid buildings with awnings on both platforms. Signalmen were the only staff on duty so when I relieved there, in addition to operating the box, I had to carry out the normal station work. 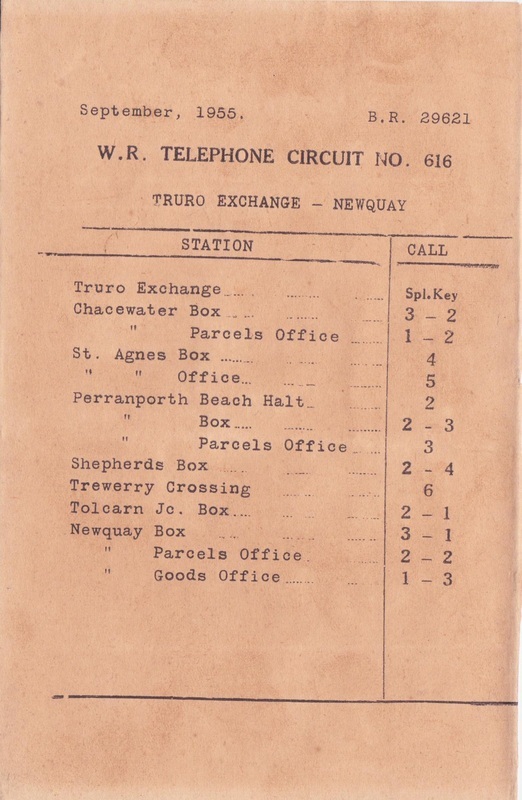 This involved issuing tickets (usually privilege returns to Truro for the regular signalman and his family), tending the trains (rather busy when two crossed) and cleaning the booking office, waiting room and toilets. There were also flower beds and tubs to weed and lamps to be lit which all helped while away the time between trains. I could also chat with other signalmen using the railway phone lines. 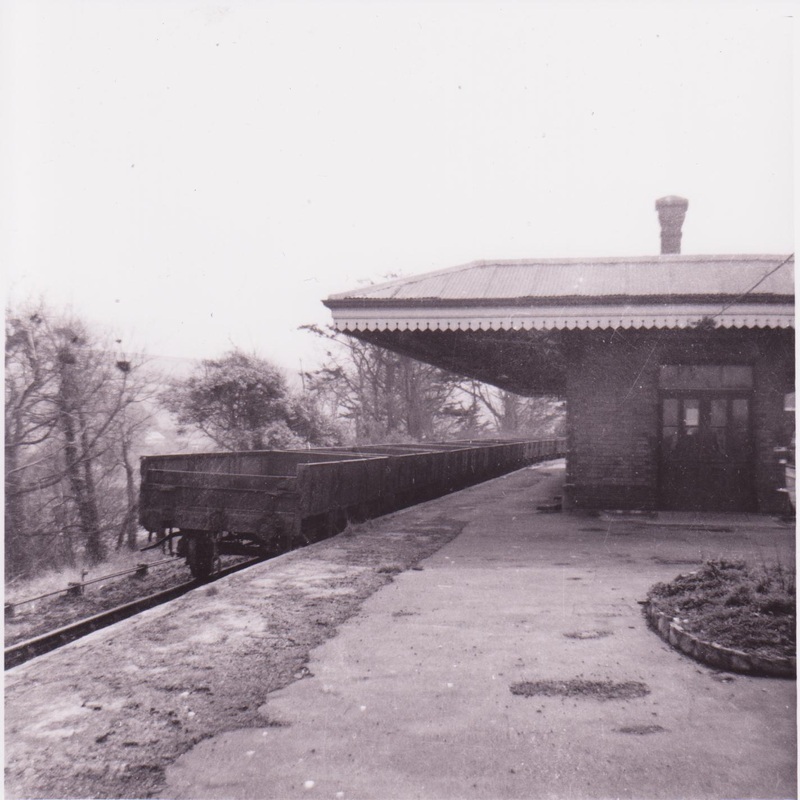 Closure came in February 1963 and my last visits there by rail were early in 1964 in the cab of a D63xx when acting as pilotman on the recovery trains. Thank heavens at the time there were none of todays Health & Safety Regulations. Having parked at Shepherds I wandered in to the station area. 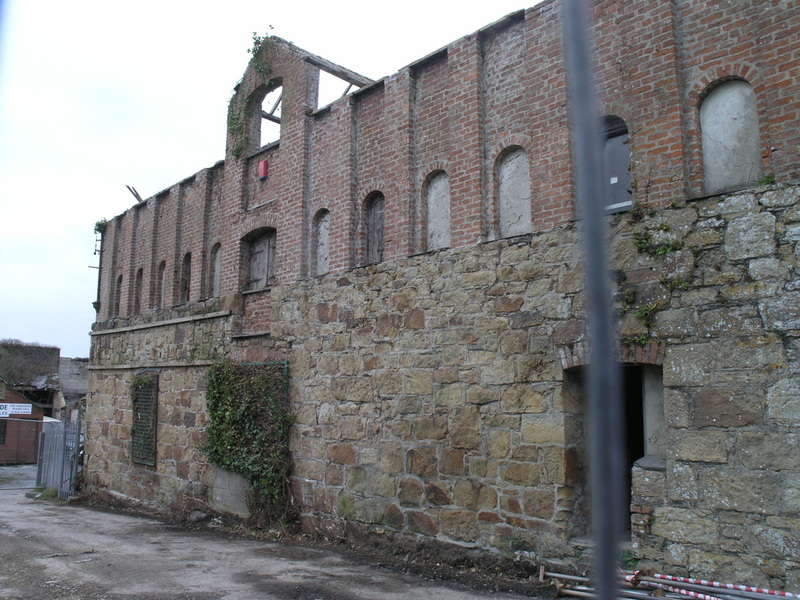 Here the main buildings on the 'Chacewater side' were open and being used as a temporary headquarters for the operation. I asked if I might take a few photographs and take a stroll down the line to the railhead where the lifting was taking place. "Yes, help yourself" was the reply - I think the gentleman may have had an Irish accent! 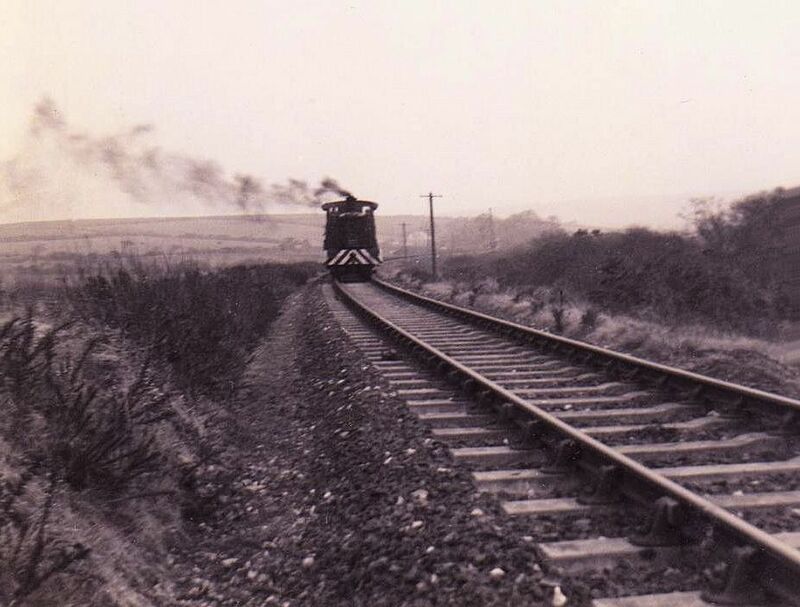 As I wandered down the line towards Newquay smoke appeared in the distance, alas not a steam engine but the contractors loco taking another load to the sorting sidings at the station. Perhaps the gentlemen operating the crane and taking up the line were used to photographers, they took no notice of me! It was noticed that in the third picture the little boy is wearing boots. Reminds me of the story of the lady who lived in the cottage and 'manned' the gates - it is said that she always wore a pair of Wellington boots when she came out to tend the gates - these boots were several sizes too big and she slipped them over her shoes or slippers - a nice tale. 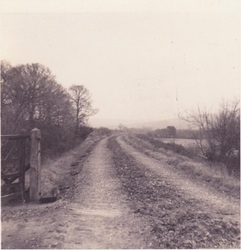 TREWERRY CROSSING an article by the late Cyril Hitchens. 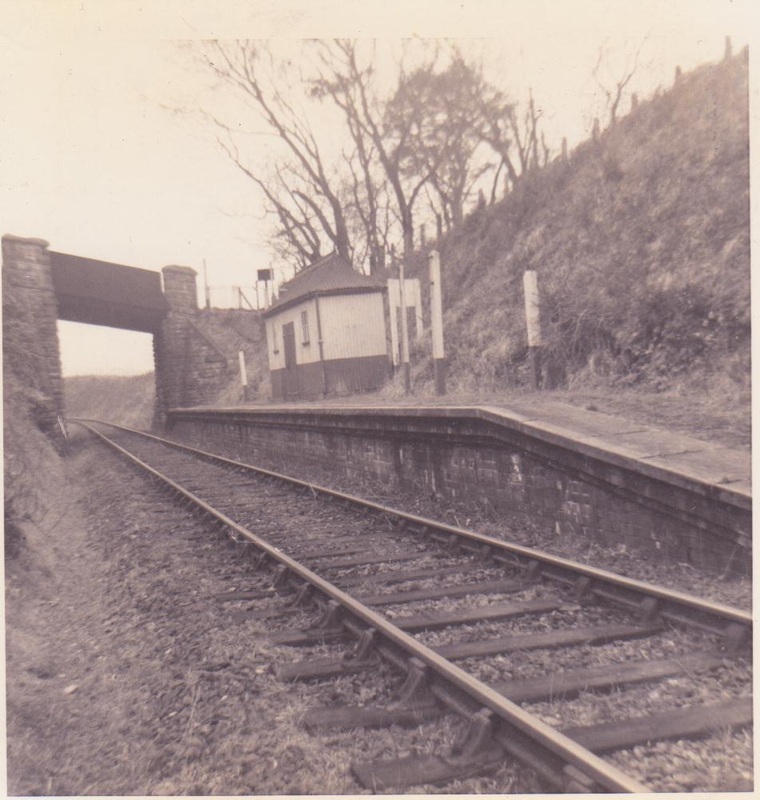 Trewerry Crossing "Box" was situated next to the road crossing at Trewerry and Trerice Halt. This was the only level crossing on the branch. 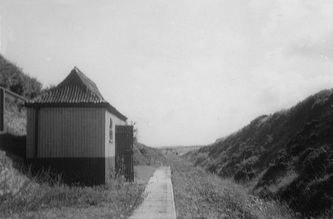 The crossing keeper's hut was a wooden structure measuring about 8ft. by 6ft. 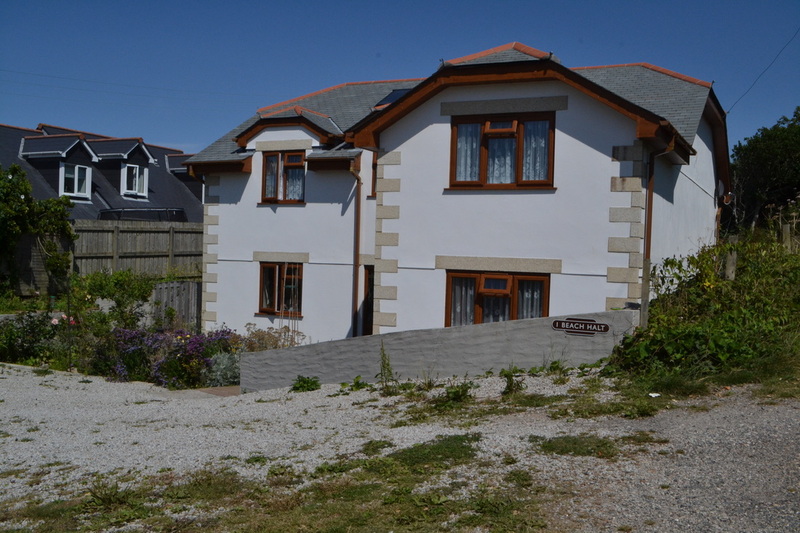 with a slated gable roof topped by substantial ridge tiles. There were windows at the front and one end and a door at the other. 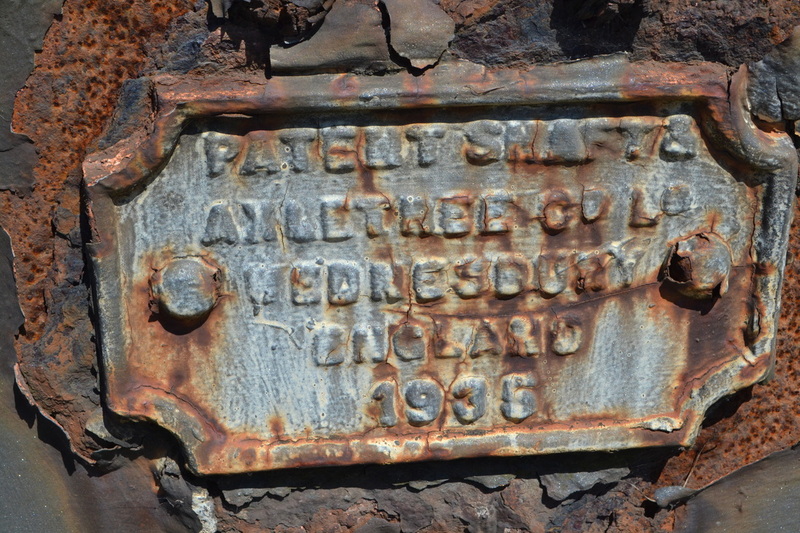 Under the front window was a large cast nameplate which probably stopped the hut from blowing away! Inside were a coal stove for cooking and heating, an oil lamp, a chair, a small cupboard, a phone, a bell to announce the approach of a train and four levers. The interior was rather cramped..... The two red levers controlled the home signals at either side of the crossing and the two blue levers controlled the locks for the gates. 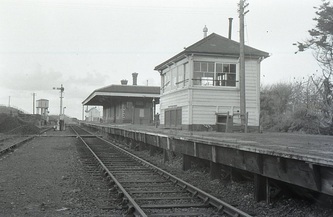 Two fixed distant signals were situated in advance of the respective home signals in each direction. When the bell rang you went out to place the gates across the road, locked them and then lowered the correct signal to pass the train. The resident keeper, Miss Harris, lived in the adjacent cottage which was fitted with a repeater bell so she did not have to remain in the hut all day! When I relieved her it meant covering two shifts, ie. the whole day. It was not a very demanding job so I would keep myself busy by bringing some woodwork jobs from home, cleaning my motorbike (and later, car) or reading. There was very little road traffic and only the occasional passenger although the lights on the platform had to remain lit during the hours of darkness. It was an isolated, rather eerie spot, especially on a windy winter's evening. One day, just before Christmas, Miss Harris returned by train from a shopping trip to Truro and invited me into her cottage for a cup of tea. During our chat she proudly fetched a jar from the mantelpiece to show me. It contained her gallstones.....which had been removed during an operation some years previously! Later, when I returned to the hut it had become very windy and cold so I stoked up the stove. After a while the hut became too hot so I opened the door a little to cool down whereupon the wind blew the light out. As I was nearing the end of my shift I didn't bother relighting it so I spent the next 45 minutes sitting in the dark. 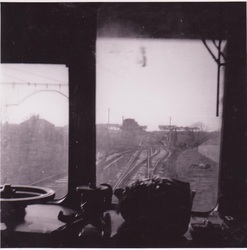 When the last train left I extinguished the halt lights and I remember looking around in pitch darkness with only the sound of the wind for company. 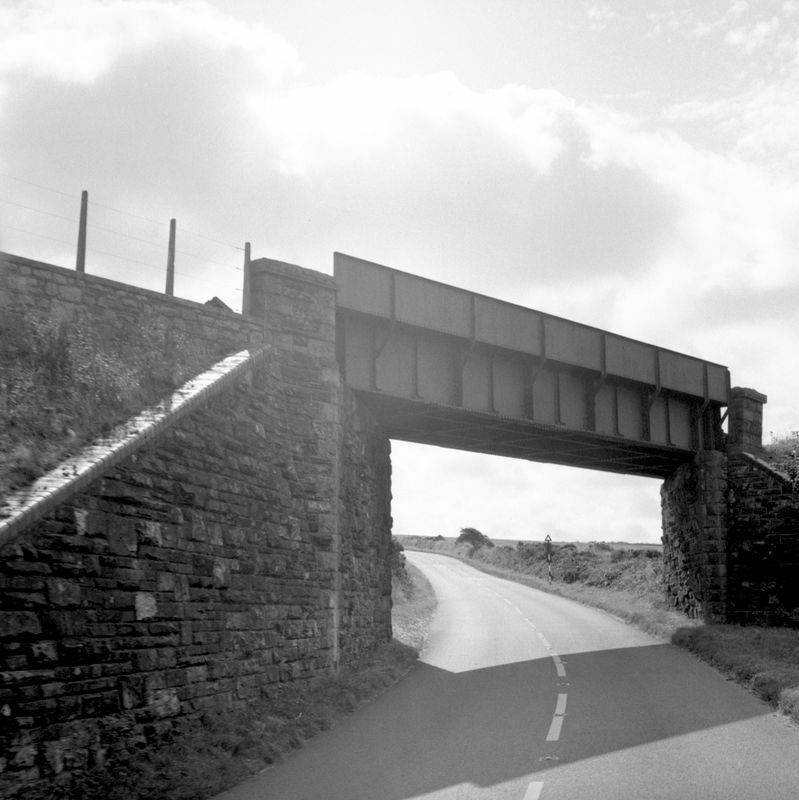 So ended a very strange working day on the railway which, I think, was my very last time at Trewerry Crossing which was the limit of my area from Penzance. 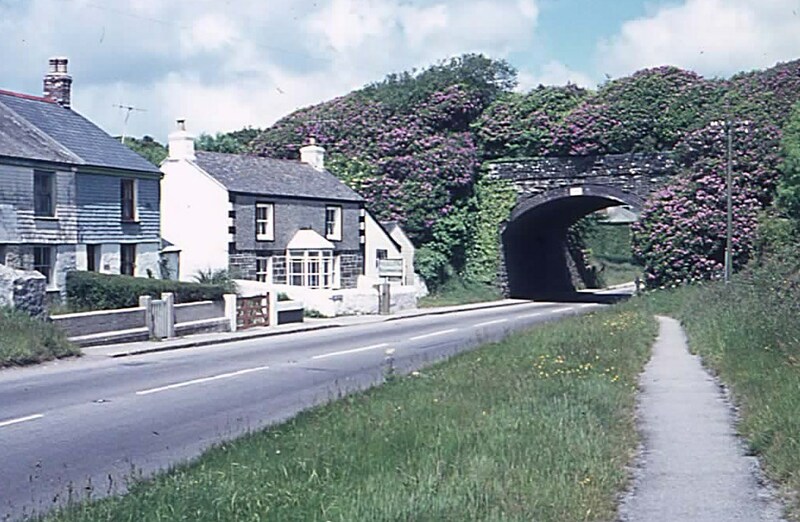 I never had the opportunity to work the boxes at Tolcarn Junction and Newquay. 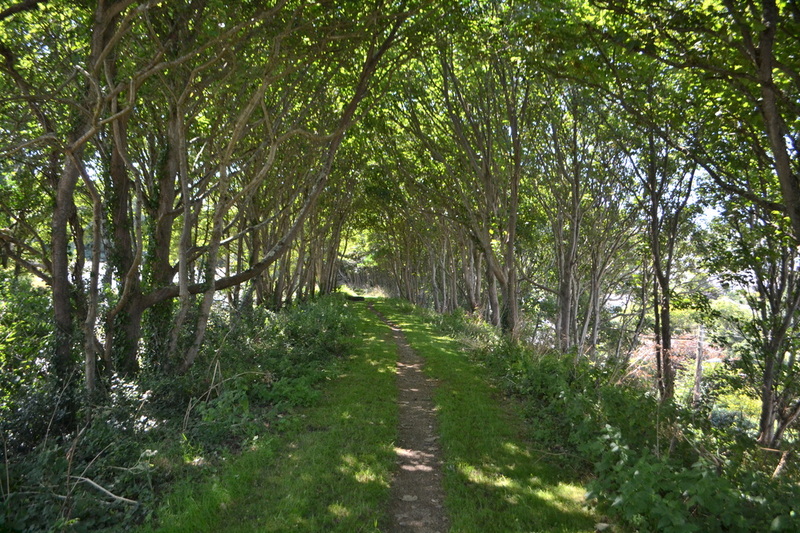 Trevemper Siding was located along the original alignment of the Treffry Tramway from Tolcarne to East Wheal Rose. 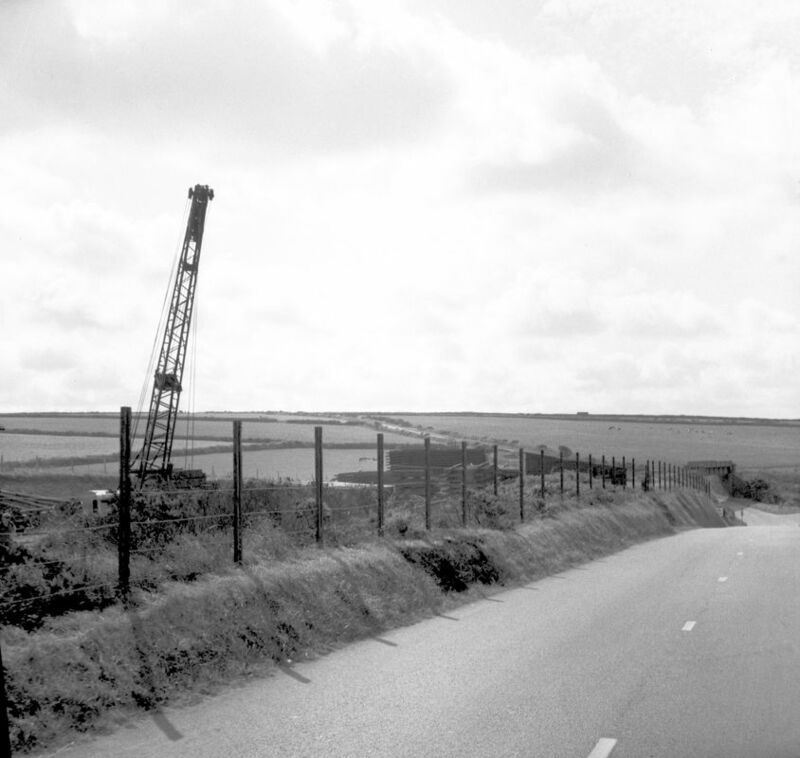 This line was taken over by the Cornwall Minerals Railway wef from 1st June 1874 and the line extended to Gravel Hill Mine . 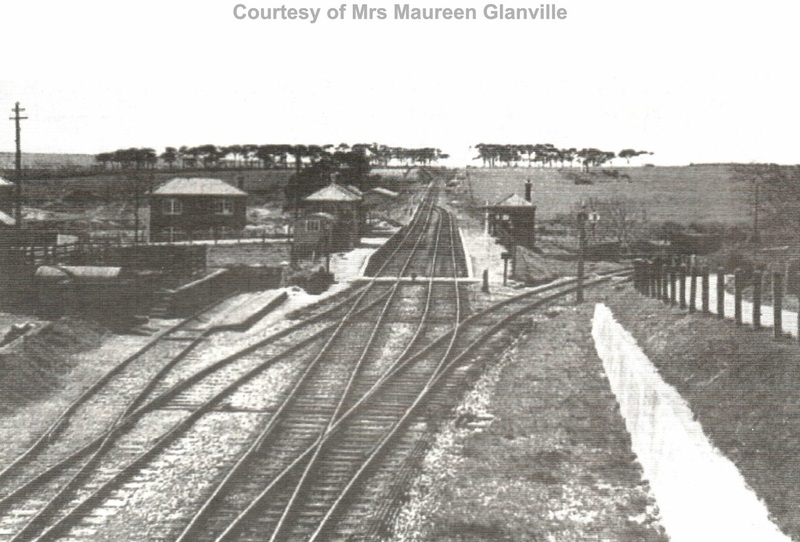 On 2nd August 1898 further improvements were made when this original alignment was abandoned and a new more direct route established which had the bonus of removing three level crossings. 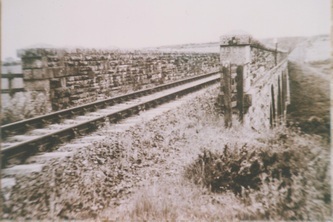 A short length of the original route was left with trackbed occupied by Trevemper siding. 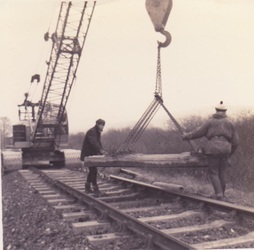 The siding was accessed off the main running line by means of a ground frame. 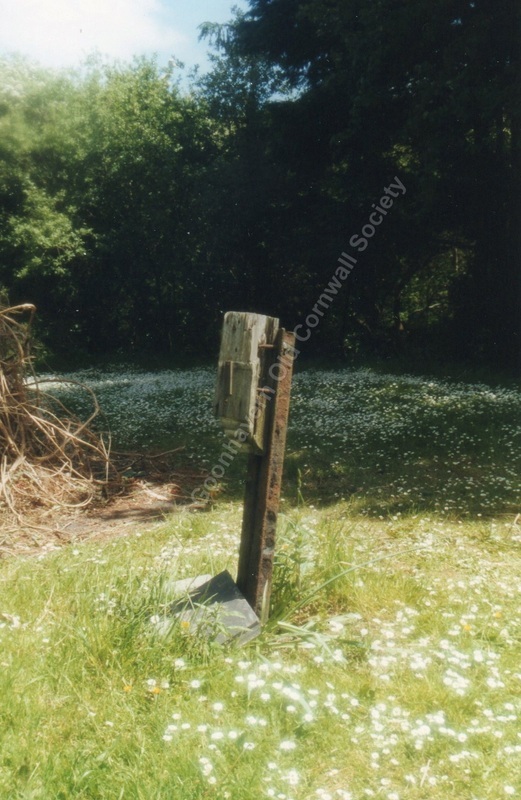 This sign was acquired by a Mr Toms and relocated to his miniature railway on Hayle Towans - it was seen there in the 70's. The current location of this sign is not known. 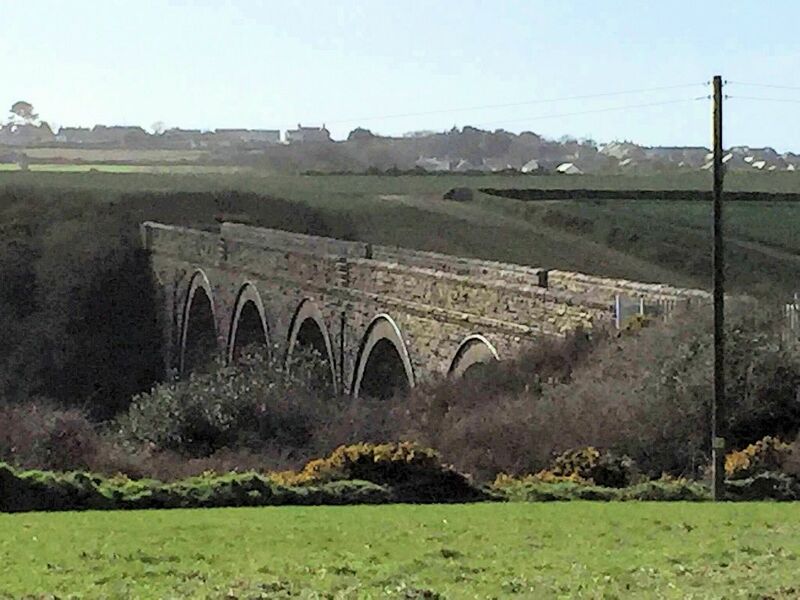 On 2nd January 1905 the re-aligned section and the line from thence to Shepherds was extended to Perranporth becoming a through route to Chacewater. 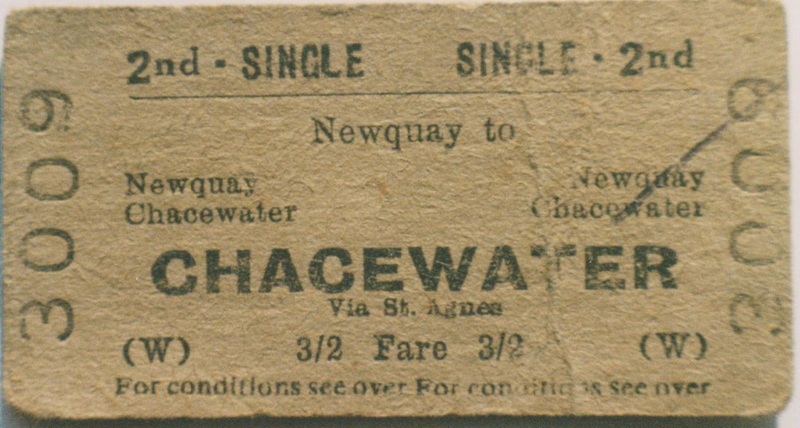 The Chacewater - Newquay line was closed 4th February 1963. 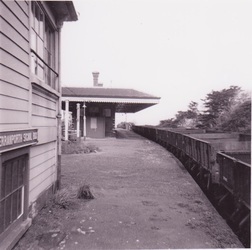 The closure at the time left Trevemper siding still accessed from Tolcarn Jct. 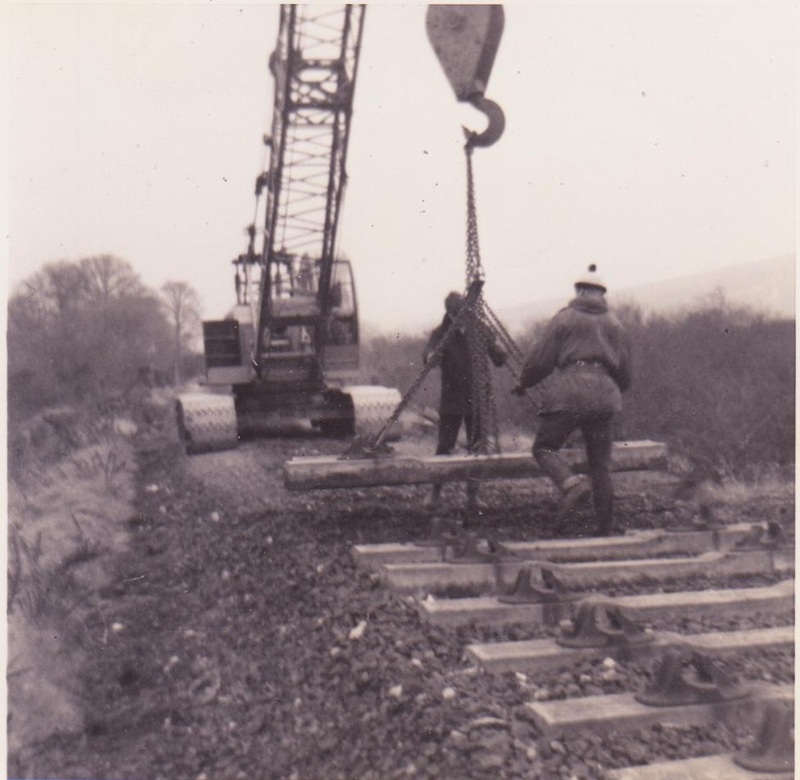 However it is understood that the demolition contractors, due to a misunderstanding, lifted the section between Tolcarn Jct and Trevemper when it was still officially in use. 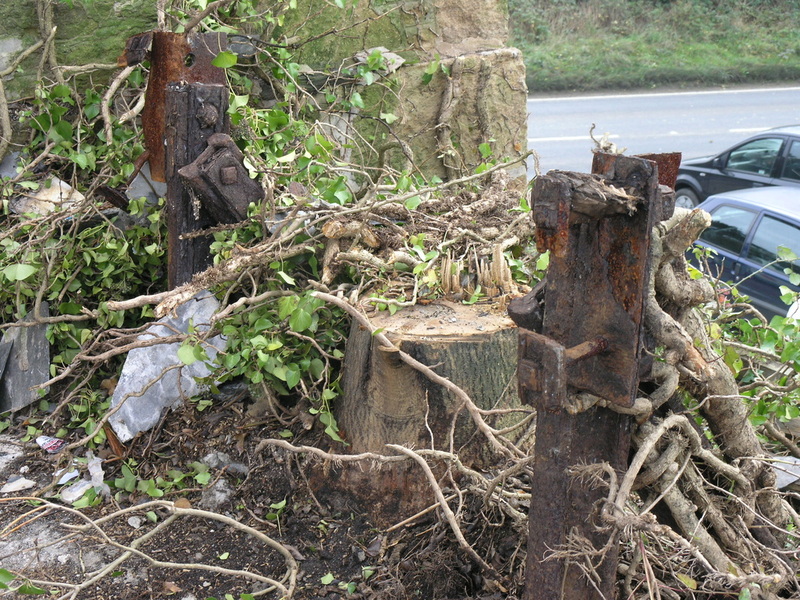 Not all traces of the railway have been removed as can be seen by these very rusty remains of a buffer stop at the end of the siding. 30th October 2014. Copyright Peter Bragg. 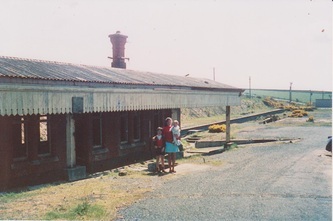 A view from the east along the siding side of the goods shed, the rusty buffer stop is located at the far end of this shed. 1st November 2014. Copyright Peter Bragg. 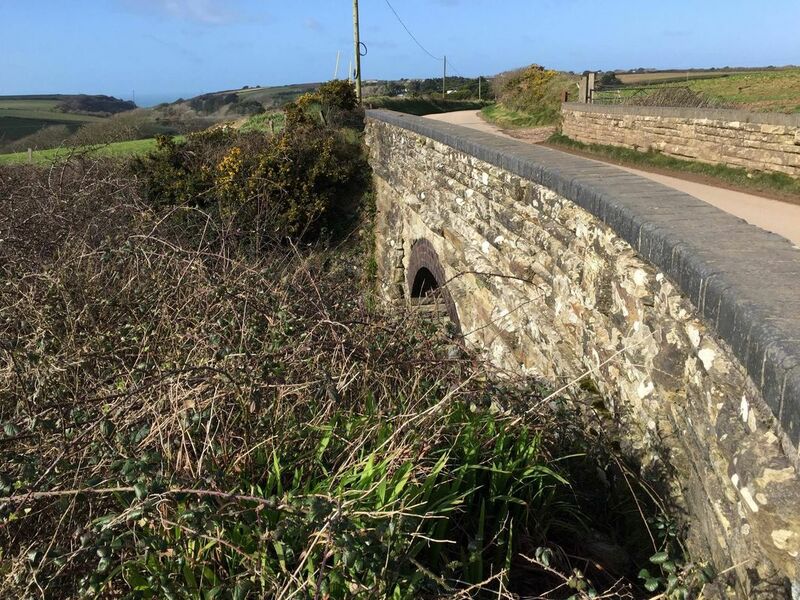 ​On my way from Penhale (Where I had visited the Gravel Hill Tramway) to Newquay, I stopped at Trevemper, where Treffry's original route to East Wheal Rose made a level crossing. It's a busy road in August and motorists would soon get steamed up today if they had to wait for a horse-drawn train to cross. 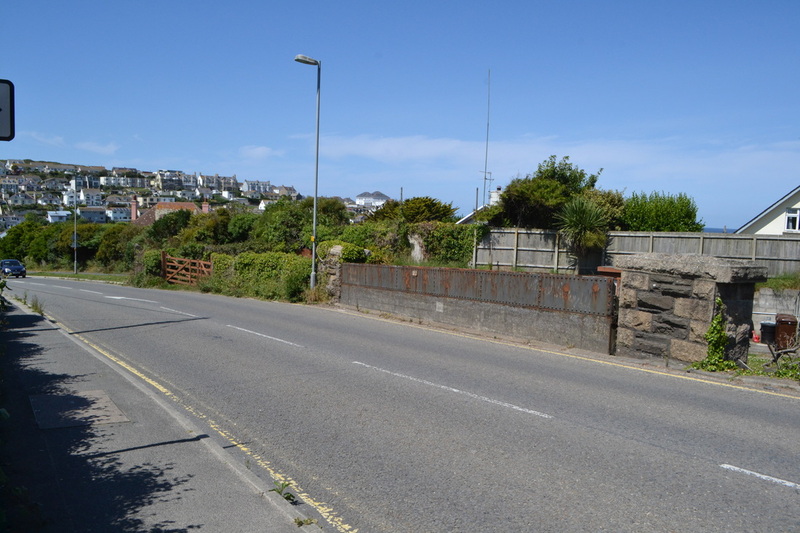 The tramway from Newquay crossed the road from where my bike is to where the white and yellow sign can be seen just beyond the driveway at left. The later C.M.R. 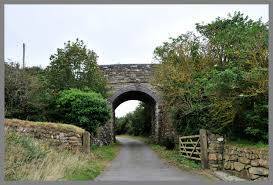 route and its successor, the Chacewater to Newquay branch, passed under the road a little way up the hill behind me. 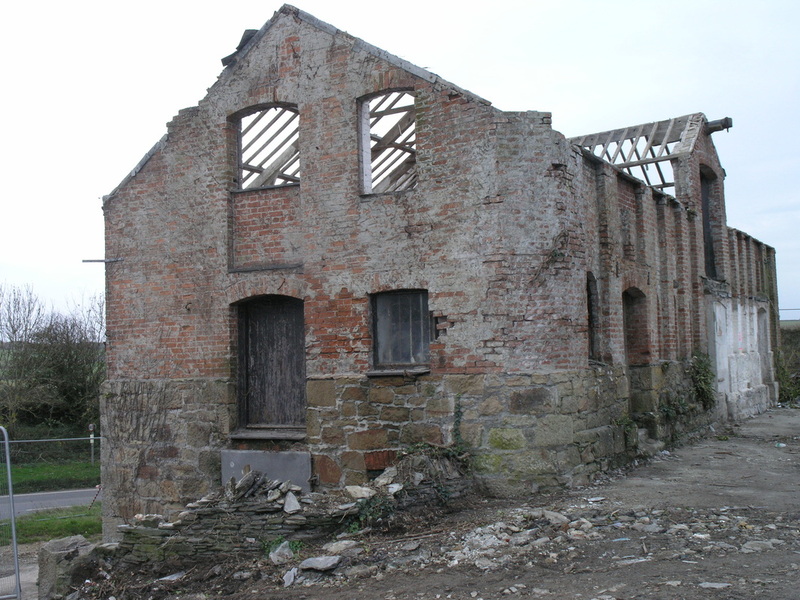 The derelict building had a siding on the opposite side, as covered in our part 1. Copyright Colin Burges. 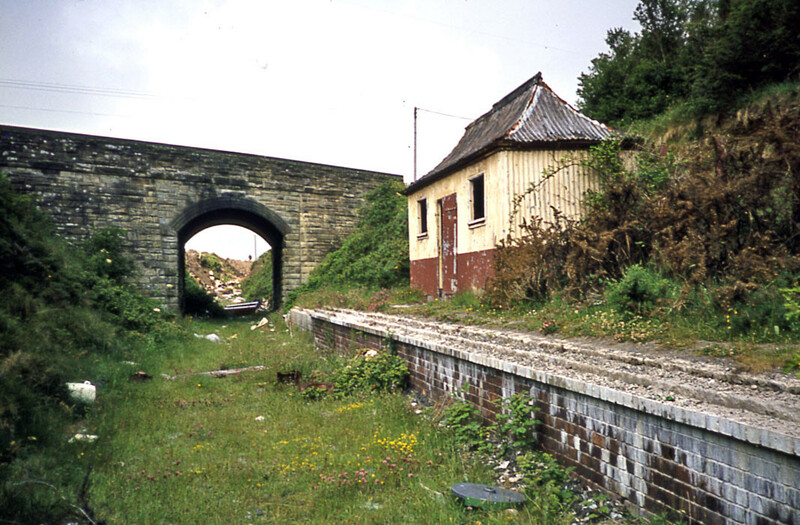 We finish this section with 5500 waiting to head away from Newquay with a train bound for Chacewater and Truro. We are most grateful for the use of this photograph taken by David Bastion who holds the copyright.